Here are my rides for this month. And here’s VeloViewer’s Wheel which shows where I have ridden (except for a ride I did in NL). However, the total distance is wrong on this wheel – no idea why as Strava has the correct data (and it gets the data from Strava). Any activity that is marked as a ride, but performed in a velomobile is subject to being flagged. Continued violation of the above mentioned policy may lead to the termination of a Strava account. We appreciate your cooperation in advance. Please submit a support ticket if you have any questions about this policy. Basically, if we mark our rides as ‘workout’ or ‘private’ they are not included in leaderboards with other riders and many other features are lost. Several people have left Strava because their rides are constantly flagged (even if just round the corner for a coffee, no speed records) so it seems we may move across to Garmin Connect as that seems to accept velomobiles at the moment. 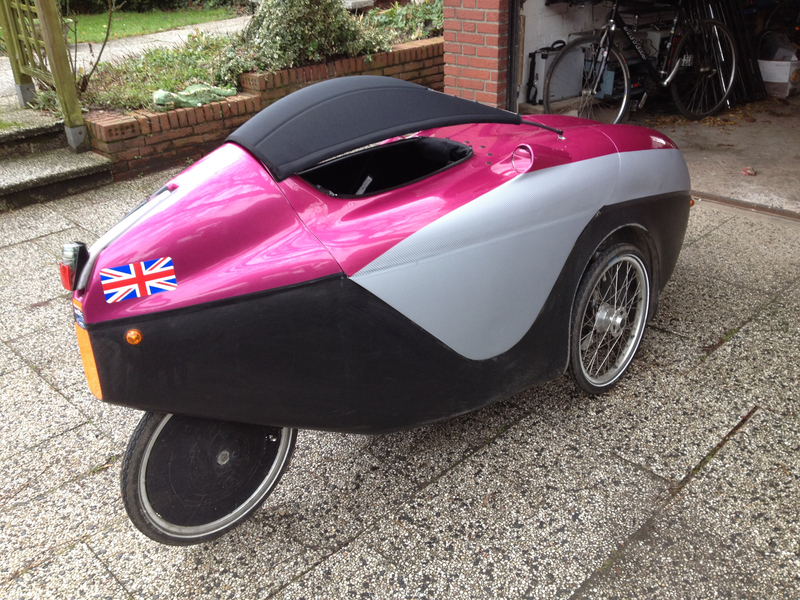 Chum Oliver who rides a Mango velomobile had contacted me to ask if I’d like to meet up with him on his way back from a longer ride (back from Ede in NL to his home near Roermond). He said we could meet for a cuppa in Arcen and then ride together to Venlo or something. Of course I said yes as it would be great to catch up with Oliver again. Sunday mornings is a time that Klaus often rides, starting early in the morning (7 or 8am sometimes) as he has to be home at midday for breakfast. We decided to ride together to Straelen and from there I would head to Arcen to meet Oliver and Klaus would ride home again. So Klaus and I set off from my house and rode together the relatively short route to Straelen, doing a detour to Obereyll and Nieukerk on the way to stretch out the ride a bit, and because that section of road is fab (smooth, fast and empty). I had to stop to take the photo of this amazing place name on the road sign – a clear mix of the local dialect of German-meets-Dutch. We arrived in Straelen and stopped at Hoenen bakery where I had their breakfast and Klaus had a piece of cake. We were very early as Klaus would need to head back by 11 at the latest and I wouldn’t need to leave for Arcen until midday, but I thought I could safely sit in a bakery for an hour on my own with no problems. Just as I had finished my breakfast and Klaus his cake we spotted chum Uli cycling outside. 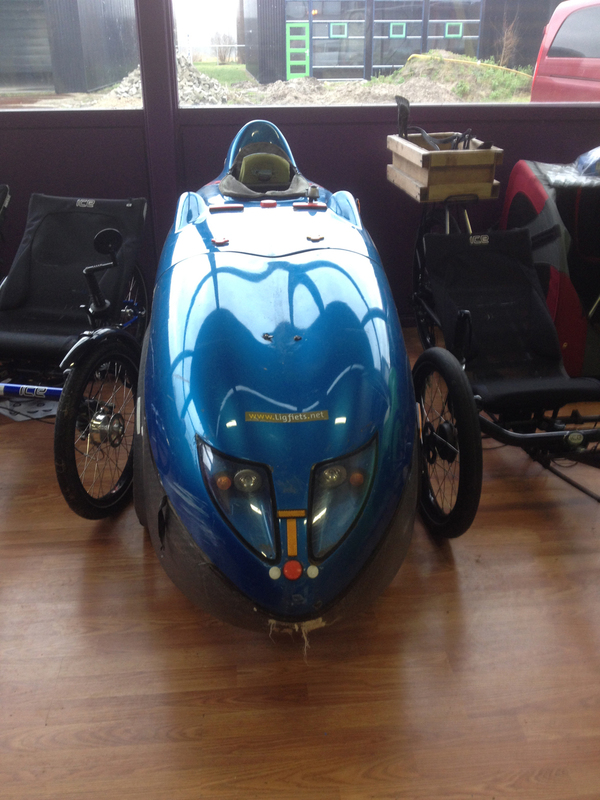 He had seen the velomobiles so parked his bike and came in to see us. He was on his way to Walbeck which was a bit further north to attend a Radio Ham Field Day. I know a bit about these as my father was a Radio Ham previously and went to a couple of these field days. Anyway, Uli asked if I wanted to come along as I had some time to kill so I said yes of course. Klaus headed off home and Uli and I set off to Walbeck, about 10km further on than Straelen. There was some kind of event on in Walbeck that day which meant some of the roads were closed and traffic was a bit random but we found the field with the Hams in in due course – right next to this windmill. The sights and sounds were familiar from my youth when my Dad did lots of radioing (before the Internet appeared). The chaps there were impressed to know that I had experience of Ham Radio but seemed appalled I hadn’t got into it myself. But I find the internet rather easier and involves less equipment! After half an hour there it was time to head off on my own to meet Oliver in Arcen, so I said goodbye to Uli and the other chaps and zoomed down the hill to NL, my second country of the day. I stopped at the usual café, sitting outside to wait for Oliver. He was on a 200ish kilometre ride back from Ede and had given me a very vague estimated time of 12:30 but he was spot on – I heard the thunderous noise of his Mango rolling over the cobbles before I saw him. I waved to him and he stopped, parked near to Penelope and we sat down for some lunch together. After lunch we rode together to Venlo where we stopped briefly to watch what seemed to be a championship of Water Polo played with canoes. Great fun! At Venlo we went our separate ways and I dragged myself up the hill back to Germany, reaching home with 75km on the clock at an average of 20.1km/h. A fun day out with three companions on my voyage to two countries. Two years ago, when I had just been in Germany a month, I attended the Trike Treffen at the Hariksee near Brüggen. This is organised by people in the velomobilforum.de and liegeradforum.de and was great fun. I met Oliver there, and met Klaus for the first time as well, and also got to know other people who I have subsequently seen again. 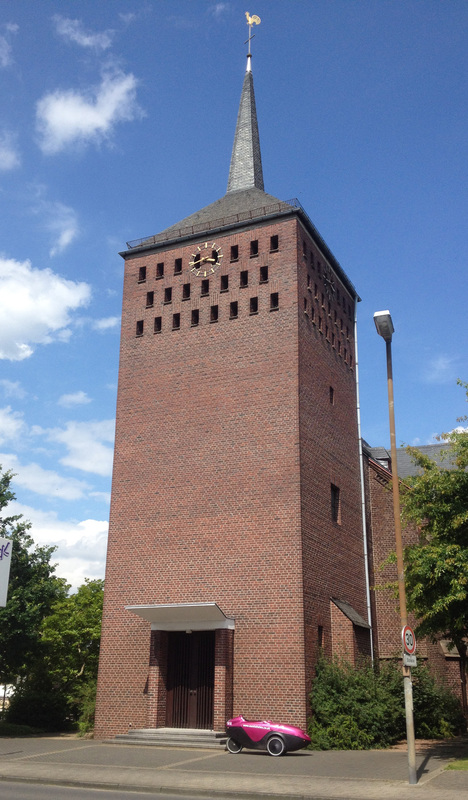 Last year the Treffen was miles away in the south but this year it was back in Niederrhein, in Xanten which is just 40km away, so Klaus and I hatched a plan to visit on the Thursday (a public holiday in Germany for Ascension Day). The group were going to do a cycle tour during the day and then meet back at the campsite; we decided because of the distance just to go to the campsite after they were back, so leaving my house at about 13:00. On the day Klaus had to pull out for domestic reasons so I set off on my own in Penelope on a lovely sunny day to head to Xanten via the route Klaus had planned. I started out riding the eastern side of the track which was a much more interesting scenic route, particularly when I got near to the Rhein and there was a lovely cycle path on a very quiet piece of land, the Bislicher Insel. The place was heaving with cyclists and the sun was shining and it was a lovely day to be out on a bike. I stopped at a café for a waffle which was extremely good value at 3,50€ with a free cuppa. Here was my first view of the Rhein as I turned towards Xanten. The track Klaus had planned went round Xanten rather than through it (a wise move on a busy public holiday) and I was soon at the campsite which is marked with the little photo square on the map above. It was impressive to see how many people were there with their tents and bikes. I walked around a couple of times looking at all the trikes and velomobiles. I loved this decoration! And this Alleweder A4 had a Haribo dispenser on the side! A very friendly chap who I had met at the previous Trike Treffen made me a cuppa and I sat chatting with friends, including Detlef who lives not too far from me and has a WAW velomobile (he let Klaus try it out before he bought Celeste). It was good to catch up with some people I knew. After a couple of hours I decided it was time to ride home so I headed off, avoiding the huge hill at Sonsbeck by going round it and then taking the fast roads home. It was a very good route back and I averaged 22.4km/h for the day’s ride and hadn’t felt like I was riding particularly quickly. 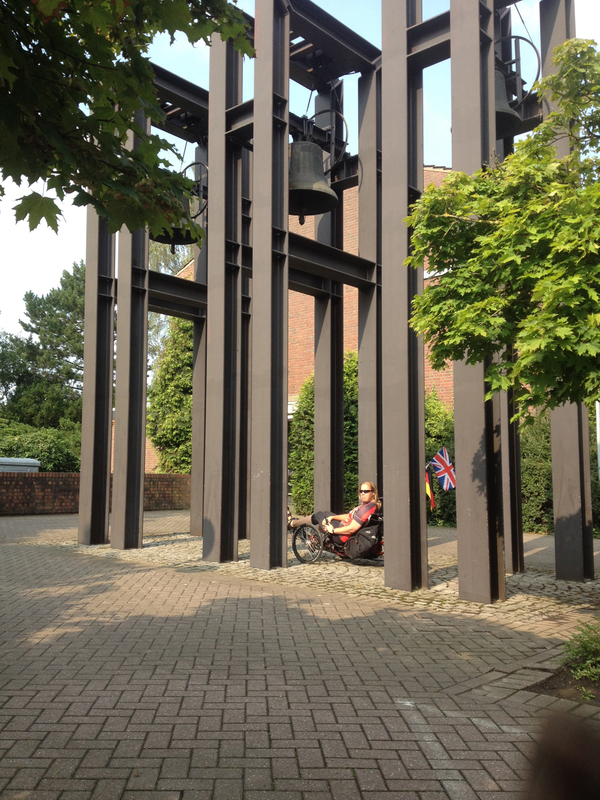 I woke up very early on Saturday morning so made a last-minute decision to join the Trike Treffen tour that day. The plan was to drive with Alfie in the car to the campsite and join them on their tour along the Rhein around Xanten. So I quickly downloaded the track for my Garmin and headed to Xanten in the car. It’s impressive seeing so many tents and recumbents. We had a little introductory talk about the route and then set off in a big group of what turned out to be 62 bikes and riders. The Rhein was in sight during lots of this ride. I was very impressed by this topiary! We stopped for lunch at a restaurant next to a Rhine ferry crossing. We parked our vehicles under a tree as it was a very hot day! The organisers of the Treffen had booked food for the participants but as I hadn’t put my name down to come I bought my food separately in the restaurant. I started with a piece of cheesecake. It was a really hot day and I was thirsty so had to order a bottle of water (they wouldn’t give me tap water). Look at the price of it!!!! It was a very good sociable ride and I had lots of chance to chat to people underway. The pace was very sedate – we averaged 14.2 km/h for the 78.62km ride. 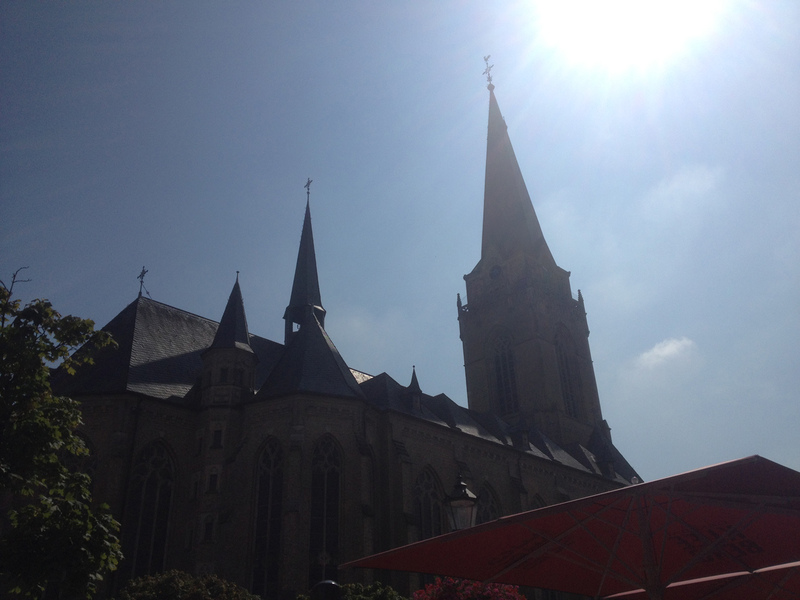 I’ve ridden around here a few times so recognised some landmarks – Xanten is always easy to spot with the double-steepled cathedral. I enjoyed the day very much and it was good to catch up with acquaintances and meet new people as well. There’s a lot of organisation that goes into these events but as a participant you don’t always appreciate how much work it is, so thanks to Walter who did the organising this year, as well as the others who helped him. Anyway, Pfingsten (Whitsun) was a free Monday. On the Saturday I was going to a Eurovision party with Claudia and Gudula but Sunday and Monday were completely free so I decided I would do a short bike tour. I’ve done the Rhein south of here lots of times but not really north of Kempen so I decided to cycle northwards along the Rhein. 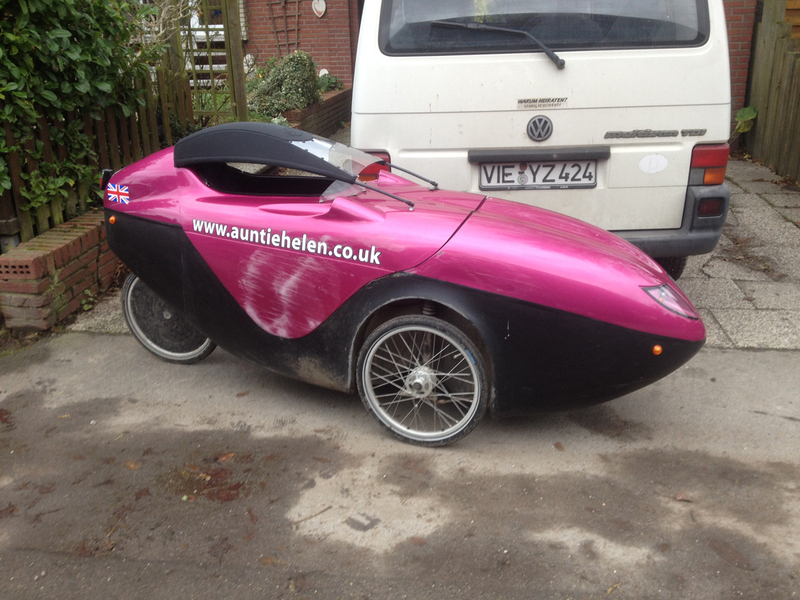 And for it to be my first ever proper tour in the Velomobile (overnight tour I mean). Interestingly, you need almost as much equipment for a one-night tour as for a three week tour. You need two sets of cycle clothing and one set of casual evening clothing, including shoes that aren’t SPD/clipless. I also wanted my iPad. 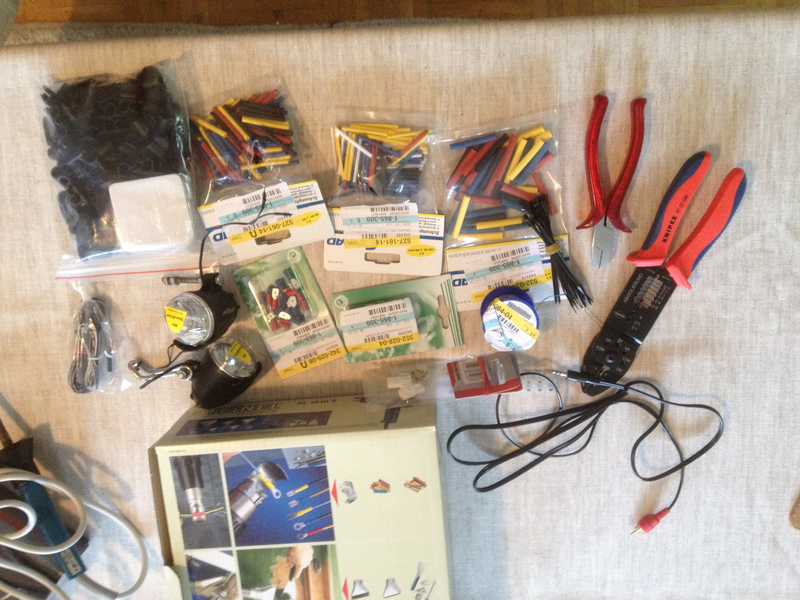 You need tools, wash kit, phone chargers etc. The only things I left behind were the charger for Penelope’s batteries (they would last no problem for two days) and the charger for my AA batteries for my Garmin. 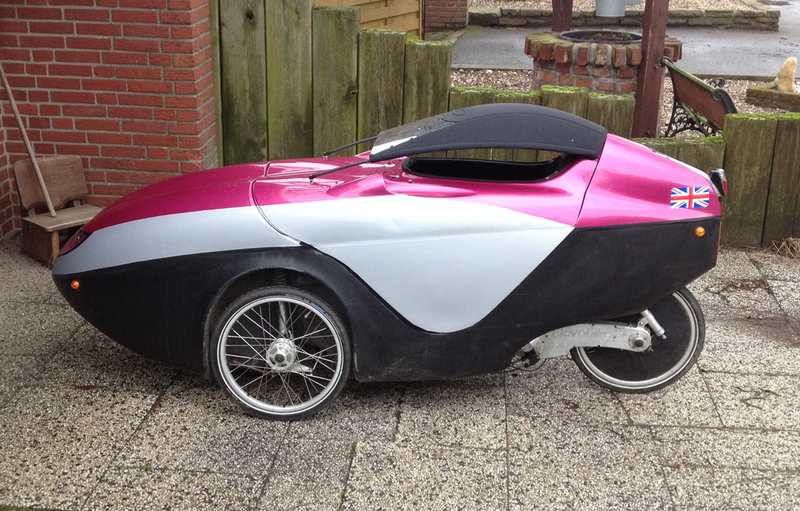 What is notable about a velomobile on a bike tour is… other people can’t tell you’re on a bike tour. 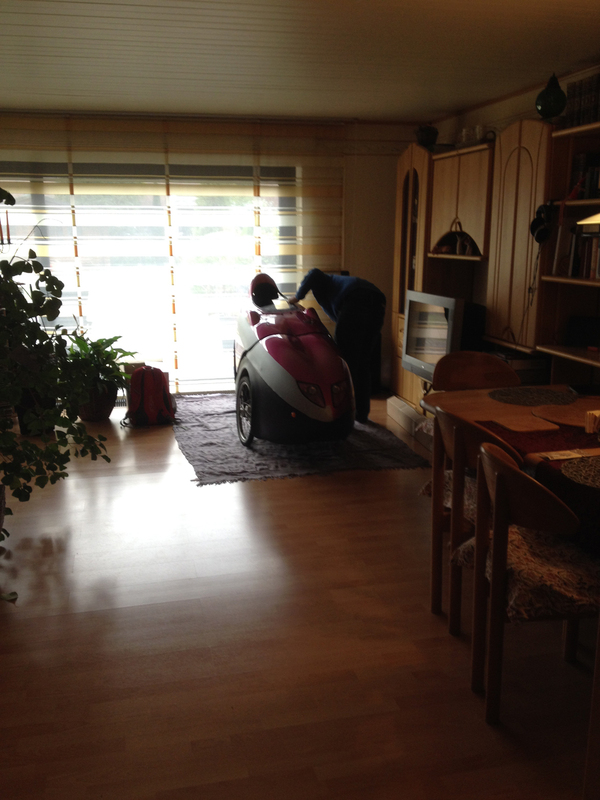 All the luggage is stored in the velomobile so as far as they are concerned you might be cycling round the corner to visit a friend. On a normal bike the touring panniers are a dead giveaway. 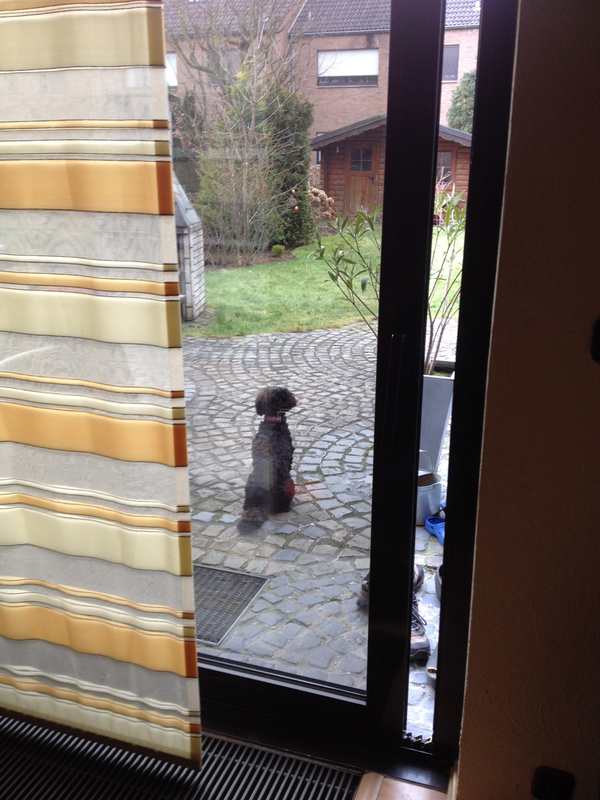 This is what Penelope looked like from outside and inside during my tour. I had planned a route there which went first to Xanten (or near it, past where the Trike Treffen had been the previous week) and then on to the Rhein, following the southern bank until Millingen. That was the plan, but I changed it a bit underway. After Geldern I headed towards Xanten via Sonsbeck on the route I had taken home from the Trike Treffen Thursday evening meet. This had an excellent hill-avoidance diversion so I didn’t have to haul myself up the hill between Sonsbeck and Xanten, just looked at it to my left as I pootled along on the flat. A much better option! 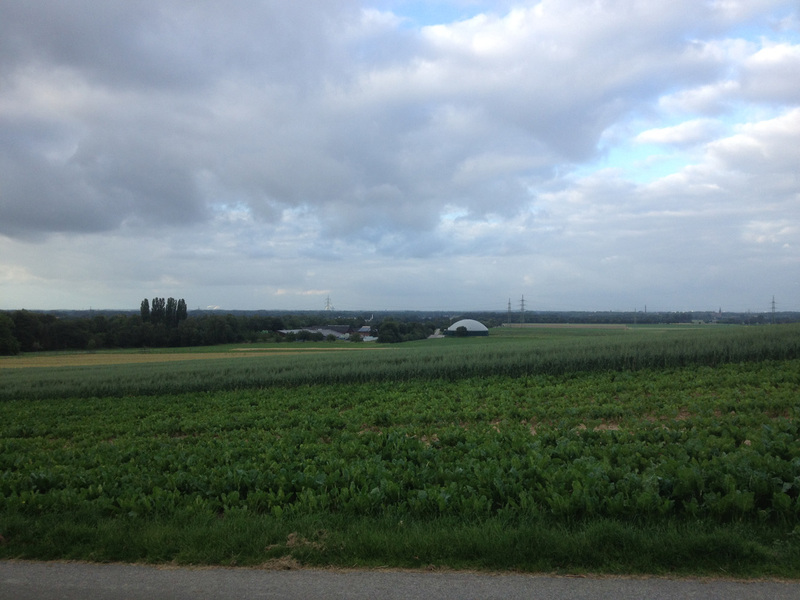 I cycled past the road to the camping place for the Trike Treffen and then continued north, through Marienbaum and then eventually to the Rhein. 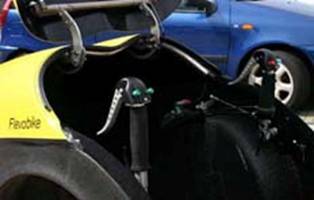 These are a pain in the neck with velomobiles as you have to get out, manoeuvre the bike through and then get in again. My velomobile routes always avoid them if possible but I didn’t know these were here. Fortunately they were the only ones I encountered on my tour. Soon I was up on the Deich/dyke and able to see my river, the Rhein. I was having a very relaxed ride, not overdoing it and being careful about my knee which has had a few problems recently. 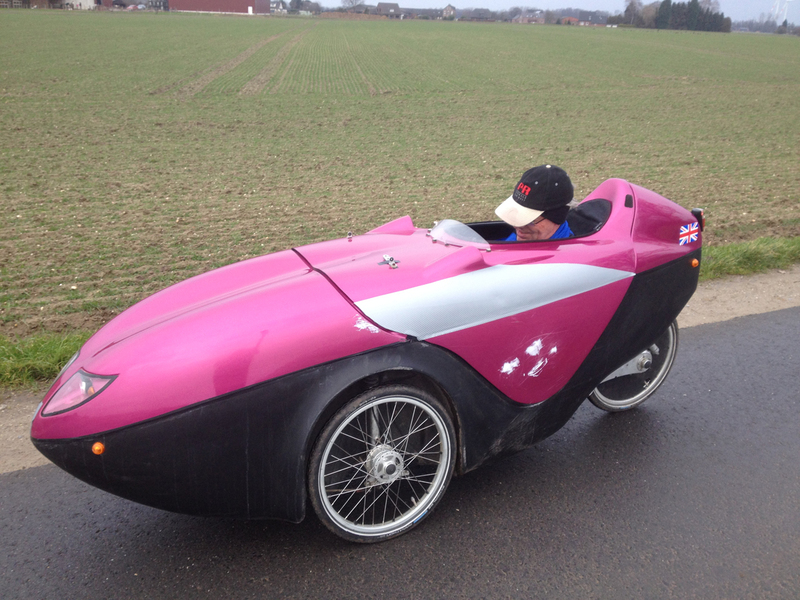 With a heavy velomobile and unknown route it would be easy to go too fast so I was careful. Well, that’s my excuse as to why the day’s average speed was only 18.9km/h. Then I found myself on a familiar bit of road that I had cycled with Hartmut first, and then Klaus on the way back from Dronten – the bit before the bridge to Rees. I had been considering the distance of my tour – only 84km. I wasn’t sure if I would have another opportunity for a 100km ride this month and thought it sensible to extend the ride so I could bag the Century. I thought therefore it might be nice to cross at Rees and head to Emmerich for tea/cake as that ought to add on up to 10km. So I decided to follow the cycle signs to Emmerich (rather than my Garmin), and found myself riding up an extremely steep slope up to the bridge. I almost didn’t manage the slope because of traction issues… when I had crossed the bridge with Hartmut and Klaus we had gone on the road. The cycle path was definitely less suitable although I managed it. You can see here how narrow the bridge pedestrian/cycle section is. But of course a lovely view down the Rhein. It was an extremely windy day and once I crossed the river and turned north west and west I was directly into wind and even in Penelope I noticed it. It was actually quite a cold day and I had chosen unwisely when I wore a short-sleeved cycling jersey – long sleeves would have been better. Thank goodness for my buffs too, to keep my head and neck warm too. We had had a week of very warm temperatures in Germany (27-28 degrees) and then suddenly overnight it had gone down to 14 degrees and I was not accustomed! Anyway, I pootled on following the signs after Rees to Bienen (German for “bees”) and then eventually to Emmerich. I rode through the rather deserted town centre not seeing any likely cafés for lunch but soon realised that they would all be facing the river and found a long strip of food establishments with masses of bikes parked outside. After a relatively short stop I carried on, heading for the bridge to cross back over the Rhein. It was really windy going over the bridge and the lady cyclist in front of me was weaving all over the place. I was a bit worried about the wind blowing my phone away so I didn’t take any photos! Once back over on the left hand side of the Rhein I rejoined my Garmin’s track and cycled into a howling gale, overtaking lots of other cyclists on upright bikes who were really battling the elements. I had a wonderful display at one point of a huge bird circling around… and I realised it was a stork. It was trying to join two other storks on a nest but they seemed not keen on this idea and chased him/her away. Here are the storks on the nest. Seeing these enormous birds flying is amazing! As I got nearer to Millingen I realised I still wouldn’t hit the 100km, I would be six short. So at one junction I saw a likely-looking detour along some quiet roads which would take me south west (side wind instead of headwind) and then I could go north-east back a little way, doing two sides of a triangle. I guesstimated it would be about a 6km detour so should do the trick. So off I went. There was a fringe benefit for this detour – this excellent road name! And then I found myself crossing the border from Germany to the Netherlands directly at the sign for the town of Millingen. I found my hotel which I had pre-booked. It was pretty cheap (57€ for a single room including breakfast) and seemed fine, although the restaurant menu proved too expensive for me so I went to the chinese restaurant round the corner. I ordered satay chicken and rice and a pancake roll. The pancake roll was enormous and the rice had, rather bizarrely, two slices of ham on it. Very Dutch I suppose! I had completed 100.69km for the day with an average heart rate of 130bpm which is lower than normal. A nice relaxing tour and although my back was hurting at the end (I have had back trouble for a month now) it wasn’t too bad and my knee had held up well. After my Chinese I went to bed, pretty tired after the cycling. I slept 10 hours which is extremely unusual for me – but shows again that cycle touring is a very relaxing holiday! 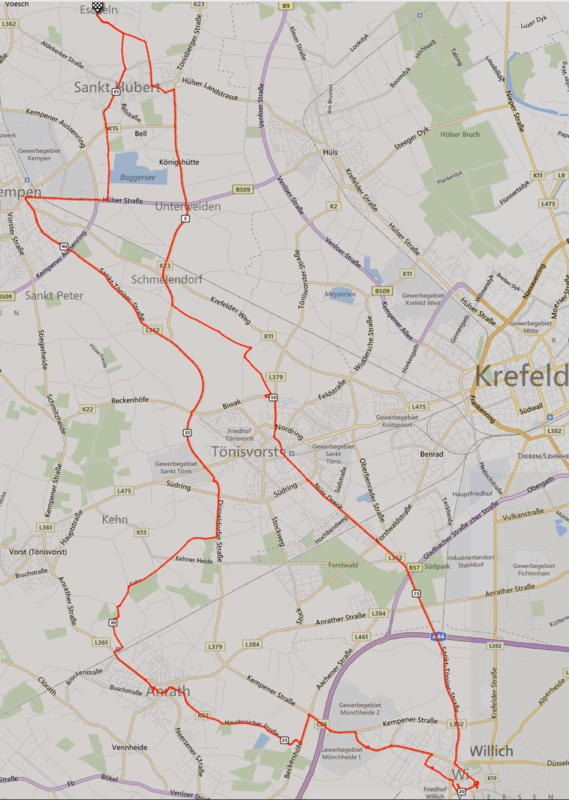 My route back to Kempen was much shorter as it was more direct, going round Kleve but through Goch, Weeze, Kevelaer, Geldern and Stenden. I’ve ridden to Kleve before on Alfie so vaguely knew the route, but had decided to take a different route to Goch which seemed to go through some kind of forest/wood. Here it is in the distance as I pootled my way across the landscape which was subtly different to my bit of the Niederrhein (more trees perhaps). The forecast was for rain today and I was followed by some menacing clouds quite a lot of the time. Today of course I had a rather good tailwind so I felt like it was much easier riding – which is evidenced by my overall average heart rate of 110 with the maximum of 148. My average is usually around the 140 mark. I decided I would stop at Weeze or Kevelaer for cake and had decided to just press on for home today rather than do any sightseeing but my plans changed when I spotted an RAF flag fluttering through some trees, shortly followed by a light aircraft landing and glimpses of more planes. There was tape preventing people from parking on both sides of this main road but then I saw a chap in a fluorescent tabard sitting on a chair beside a road closure gate and decided to go and investigate. I cycled past this chap, and also past some people who had money belts on (I later discovered other visitors were paying to go to see the airfield! Oops!) and found myself at an airfield where there was some kind of Open Day taking place. There were lots of other small light aircraft there, a beer stand, Bratwurst stand, seating area in the hangar and various displays from local sponsors (banks etc). Although I have to say there weren’t that many people there, perhaps because of the unfavourable weather forecast. This plane had a Union Jack flag attached to the propellor. It’s a Slingsby Sedburgh with Dutch registration so no idea of the UK link. The announcer told us over the tannoy that this plane was a one-third scale model of a BAE Hawk which has all the features of the real Hawk except a pilot! He told the crowd that the Hawk was the Red Arrows plane, and would now do a display including the coloured smoke. So this was definitely worth hanging around to watch! Here is a small collage of some of the photos I took during the display, which was great fun and felt really, really close. That thing flies brilliantly! I’ve seen the Red Arrows a few times at air displays and this was just like seeing one of them… the size wasn’t really noticeable when up in the air. But he flew just 50 feet above the airstrip at some parts of the show which was fun. 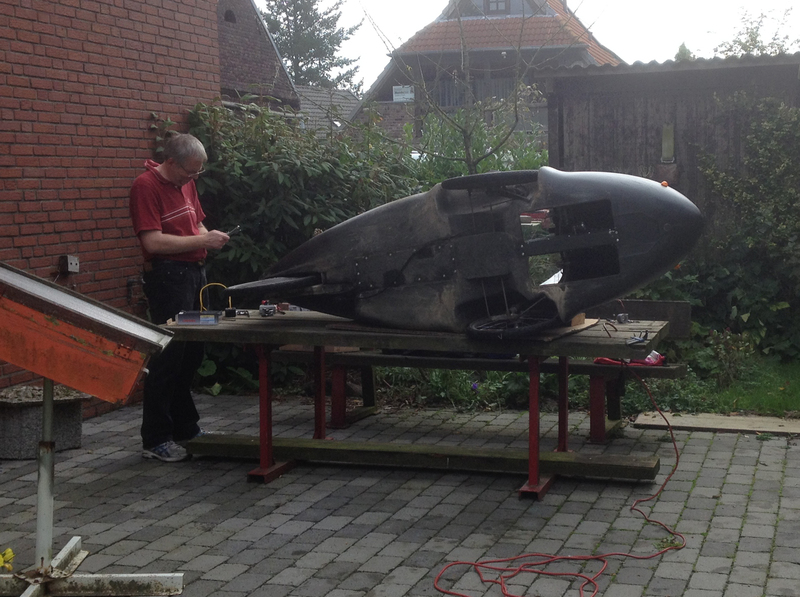 Apparently the chap built it himself which is amazing, and it runs on proper jet fuel and weighs 25kg. After watching this display I was getting very cold (again, I didn’t have the right clothes really for this tour) so decided to continue on. I rode through Goch and then found myself leaving it on the way to… who knows!!! Again, the landscape felt different than Kreis Viersen; more forests and not so wide views. But nice. When I arrived at Weeze I decided it was time to stop for cake as I realised my track didn’t go through Kevelaer but round the outside and I hadn’t visited Weeze for a while. 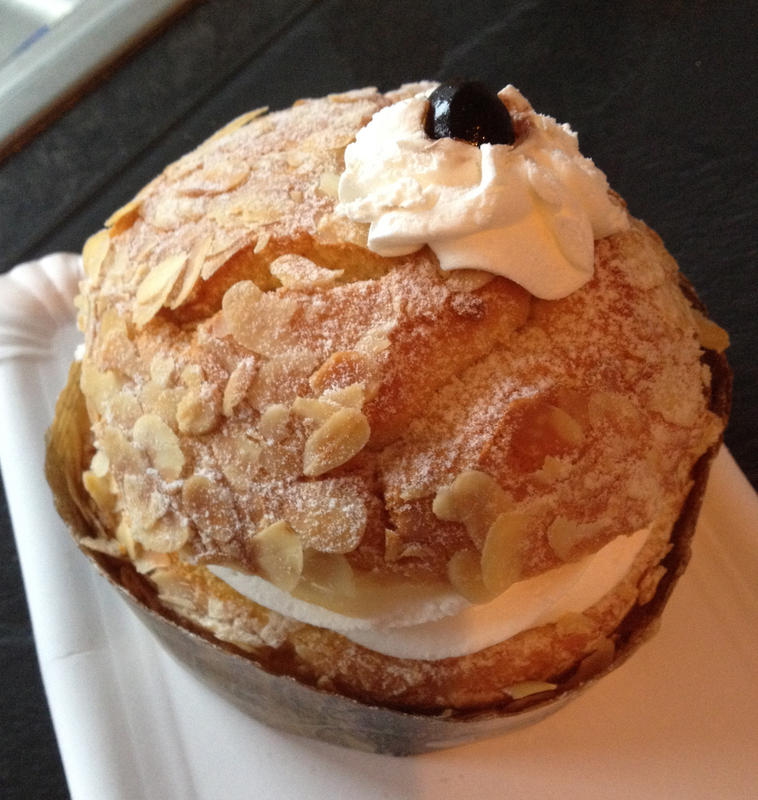 So I found a nice café which offered me a good selection of cakes… and I chose this very light moussy number. Having dodged a few raindrops during my cake session it was time to set off for the last 30 or so kilometres, all very easy and relaxed. I went around Kevelaer and made a couple of detours to keep me off the B9 road where there is no cycle path (previously I rode on the road but with some ramps over railways I was slow at times and it was a bit uncomfortable with the fast cars). And on one of these small detours I spotted this rather large bike! It was on a trailer. I liked the Schwalbe sticker on the tyre. The white pipework is I guess some kind of lighting for winter. I think I could have fitted my entire foot on this pedal. I think the chain needs a bit of work to be effective! Here is Penelope again with her new friend. It was a very cool bike and I would have loved to try to sit on the enormous saddle but of course it was Zutritt Verboten. 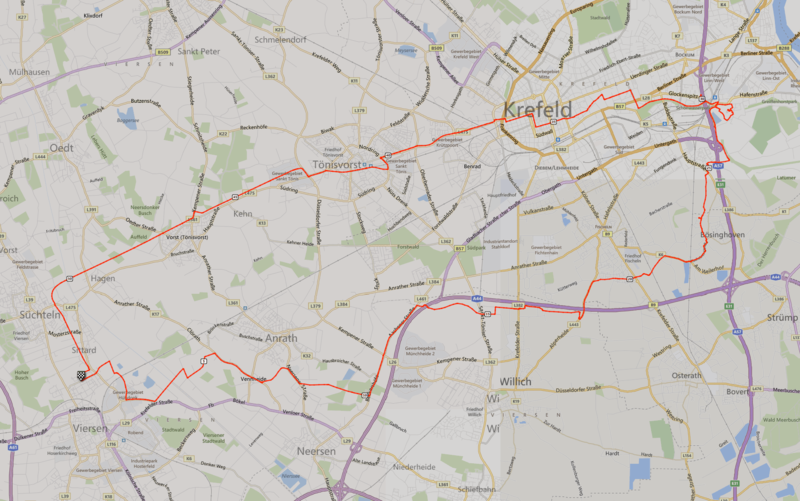 The rest of the route home was very familiar from my recent Sunday rides into Kreis Kleve and went quickly apart from my brief detour into Geldern where the circus had closed some of the roads which made things a bit slow. I was home nice and early for a hot shower and some warmer clothes! My ride back had been 73.87km at an average of 18.7km/h but I only burned 1,069 calories as I wasn’t working hard at all. 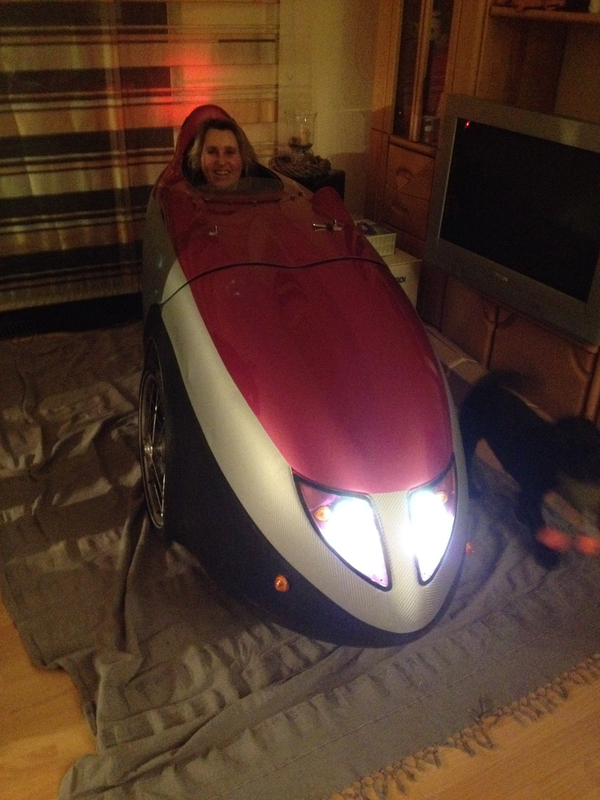 My conclusion about touring with the Velomobile – it works well, you can cover ground quickly, you keep warmer and if it rains it would have been ideal, but it’s harder to manoeuvre to park and through gates and things and some really steep ramps for cycle paths on some of the official routes might defeat me. I have mentioned in previous blogs that a cycling acquaintance Steve Abraham was going for the Highest Annual Mileage Record (HAM’R) last year, which was over 125,000km. He broke his leg partway through the attempt after a drunken moped rider hit him so didn’t get the record but Kurt Searvogel from America did. Anyway, this interest in the men’s record of 67,000 miles in a year also awakened interest in the women’s record, set by Billie Fleming (née Dovey) at 29,603.7 miles (47,642.5 km) which she set in 1938. There are currently three women undertaking this record, Kajsa Tylén from the UK, Amanda Coker from the USA and Alicia Searvogel (wife of Kurt who holds the men’s record) also from the USA. Kajsa started her attempt first, on 1 January 2016, and has been very successful with updates to supporters on Facebook, plus articles elsewhere such as the BBC. She encourages people to ride with her, although as she is riding to Guinness rules she is not allowed to draft. Several UK friends have ridden with her and said it was a really good day out. I noticed from her website A Year In The Saddle that she would be travelling from the UK to Sweden in May/June and wondered if I could intercept her. So I sent her a message through her Facebook site as I saw that she would be in NL for a few days which might work for me. She replied that she’d love for me to cycle with her and after a bit of diary-checking I realised the only day I could do this would be a Saturday when she was riding from Delft to Dedgum in Friesland. I initially thought I would get the train to ride with her but Dedgum is miles from any railway places so in the end I concluded I would have to do a there-and-back ride, driving to Dedgum and then riding towards Delft, hopefully bumping into Kajsa along the way. Fortunately she has a spot tracker which gives her position every 10 minutes or so which meant I would be able to know when to expect her. She had also sent me a GPX track of her route which she intended to follow (with possible diversions on the day if necessary). So on the Saturday morning I loaded Alfie into the car and headed off to Dedgum, which was a three hour drive. I arrived at the campsite and fished Alfie out of the car. 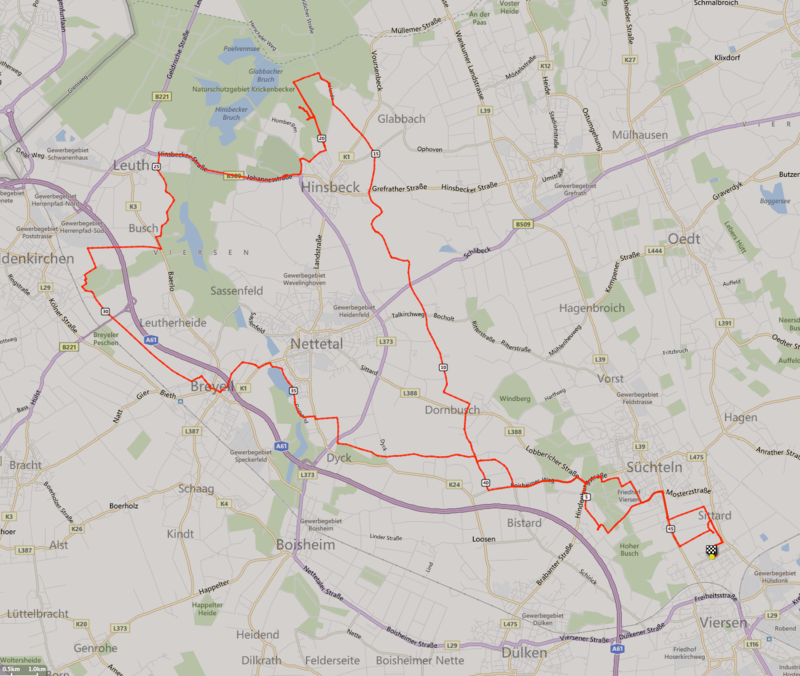 Here is a map of NL (with Kempen off the bottom, just to the south west of Essen) which shows where I rode. And this is a close-up of the track. (The boxes show where I have taken photos and uploaded them to Strava). The forecast for Kempen was 25 degrees and sunny but I knew on the coast it would be cooler. It was probably around 19 degrees so I was glad I had my windproof jacket on. The sun wasn’t really breaking through and there was a lot of wind – these turbines were turning pretty fast. I set off without using any e-assist. Although I was riding into wind I thought I might need all my motor’s help for the way back with Kajsa as she’s a lot faster than me. So I had a pretty slow trundle to Zurich where I stopped for a very overpriced ham roll. I stopped here to prepare for the next 30km which would be on the Afsluitdijk, a causeway built in 1932 that separated off the IJsselmeer. It is an impressive engineering feat and I was keen to have a look and cycle over it – twice. My Garmin map was very blue! Looking back over both sides – the North Sea on the left, the IJsselmeer on the right. After about 5km there was a curve and I could see the causeway stretching out into the distance. There were a couple of motorway service stations along the 30km route which were accessible by bike but I kept going. What was less pleasant were the huge clouds of insects that I found myself cycling through. I had to ride with mouth firmly closed, breathing through my nose, and could feel them hitting my face… You can see on this photo lots of little black dots – the insects. There were patches where there weren’t any insects but for most of the journey across they were annoying. Once I was across the causeway I found myself in Den Oever. Kajsa’s track headed away from the village through some woodland but I checked the tracker and saw she was 20km or more away so decided to stop for food as I didn’t know if she would want to stop on the way back and I hadn’t really passed anything suitable anyway. So I wandered into Den Oever and found a burger café which did me a burger and chips for a reasonable price. As the day was warming up I decided to have an ice cream and photographed my Magnum next to the village’s windmill. It looked as though Kajsa was now about 5km away so I decided to start riding in her direction – as this would get me another 100km for the day as I had already done 49. The track went through some woodland and was rather pleasant. I settled in to cycling beside her, impressed at how well she was going after 150km. 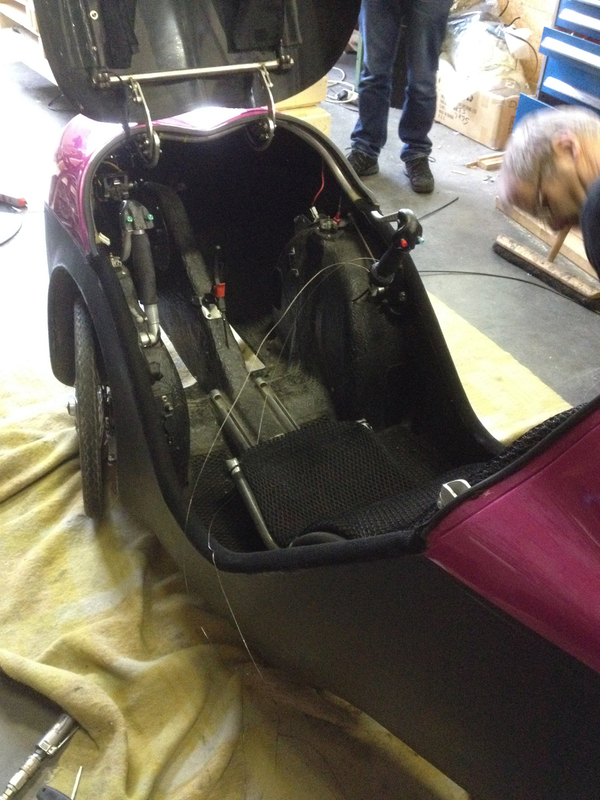 I had my electric motor on now to adjust to her speed and soon we were riding side-by-side quite effectively. If there was ever a reason to single out I was either a long way in front of her (so she couldn’t draft me) or behind. I warned her about the insects on the causeway which she clearly wasn’t looking forward to but the reality was they had all been blown northwards by the time we got there. We were fast across the causeway with the tailwind Kajsa had had all day helping us to an average of 25-26km/h. Over 25 my motor switches off so I was using my leg power too! Here we are – I had ridden ahead to try to get a selfie. And here is a pic that Kajsa took of me. We had a really good chinwag over the time we were riding. It was fascinating talking to her and hearing about this mammonth undertaking. I’d been watching her videos on Facebook over the year so it was also a weird experience seeing her in real life for the first time as I felt like I already knew her. We whizzed along, soon off the causeway and back into the Frisian countryside. I had only used half of the battery in my trike despite riding for 60km with it on level 7 or 8 (out of 9) so I was pleased with that, although it’s party explained by us riding at above 25km/h in some sections which means there is no e-assist. We got to the campsite and Kajsa kindly offered for me to have a cup of tea and slice of apple pie with them. She had a quick sit on Alfie too but after a 200km day had no wish to actually ride anywhere, especially as she had the wrong cleats. Then I headed off for the three hour journey home. All in all it was a great day, some interesting new scenery and the Afsluitdijk was really cool to ride over (twice), and 109.44km for me at an average of 18.4km/h. The ADFC (German cycling club) periodically organises things called Sternfahrten (Star Rides) where people ride from lots of different directions to a central meeting point. 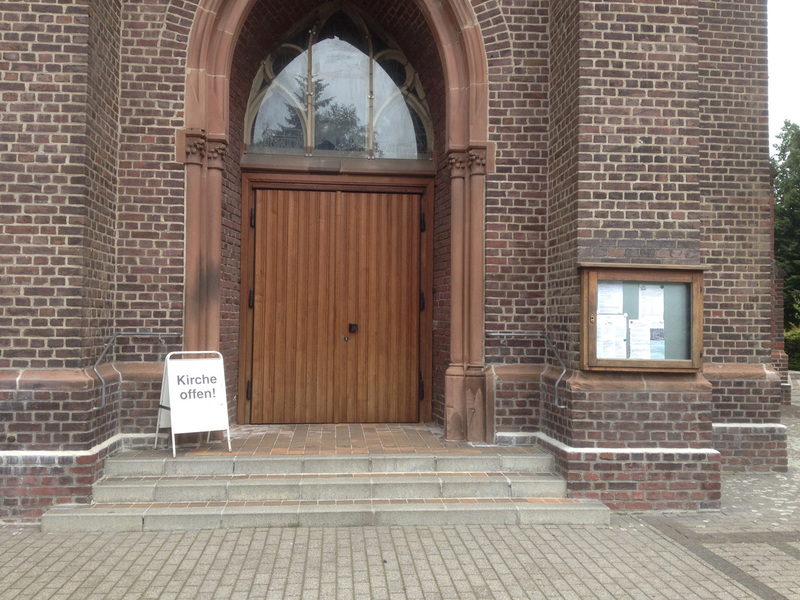 Mönchengladbach, which is a rather car-overrun city, has had two before and the last one was very successful. 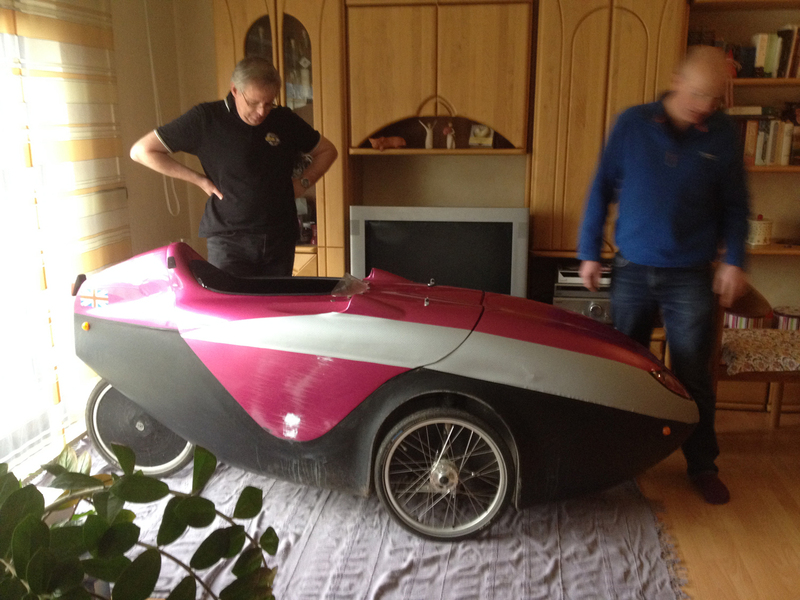 So the Sternfahrt for this year was planned… and a couple of ADFC acquaintances asked me to come along with the Velomobile. One of the feeder rides was starting in Kempen so I persuaded various people (Klaus, Gudula and Frank) to come with me and to first of all have breakfast of cake in Kempen. Which we did. Jochen, who was leading the ride from Kempen, joined us at the café. 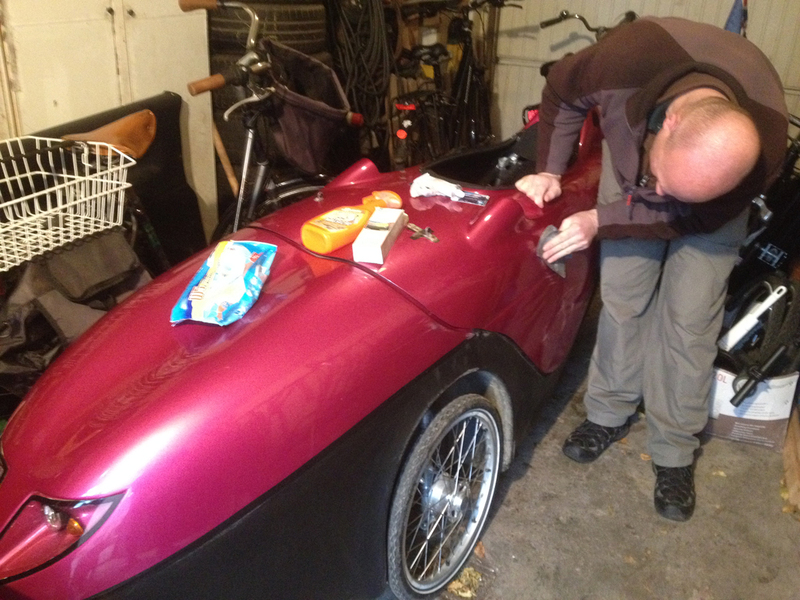 He is currently seriously considering buying a velomobile, probably a Strada, so he and Klaus had a lot to talk about! Here is the track of our ride. As we were quite early to Vorst we also had ice creams. Eventually we arrived in Rheydt where the ride would start. And here he is again..
More and more people were arriving – as were the rainclouds. Rain had been forecast but we were lucky that it had so far held off. But then it started. As everyone began to put on their waterproofs a small peloton of velomobiles and recumbents arrived… some people from the Velomobilforum including Düssel who Klaus and I have met several times. At just past three o’clock it was time for the ride to start. There were several police vans plus police motorcyclists and cyclists who would close the roads for us – fun! 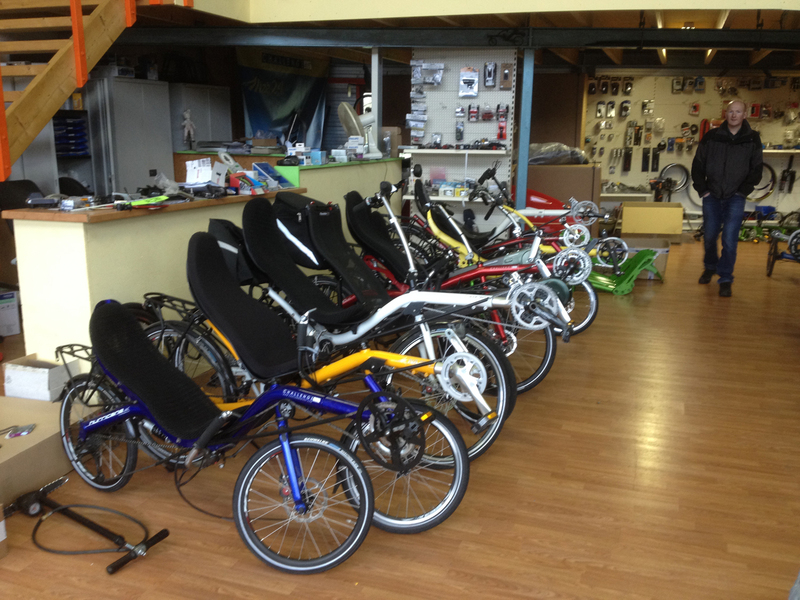 Velomobiles are quite hard to ride in groups so we decided to all go at the back for the ride. The ADFC Facebook site had this great photo of the ride though, and Gudula and Frank are visible in it. 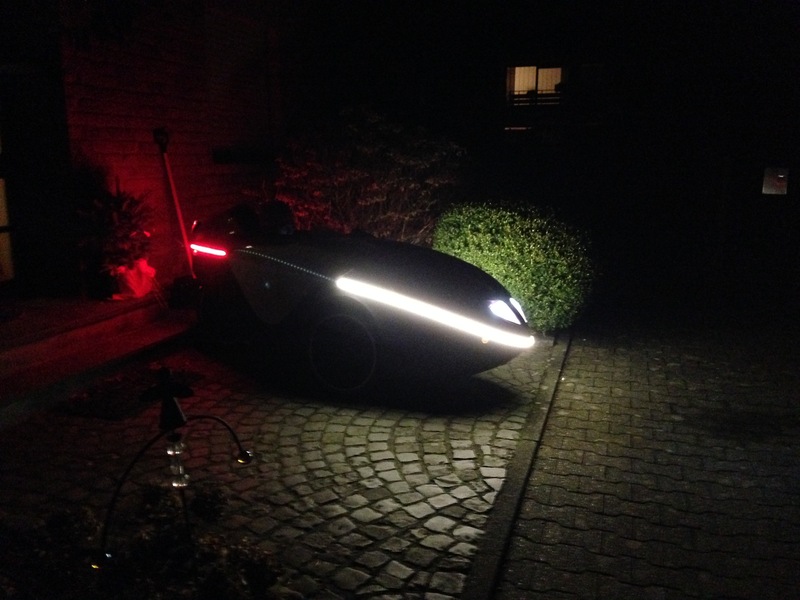 And there was also a video taken – the velomobiles are in the last few seconds! The ride was just 10km long and very slow because of all the bikes. It was also raining a lot as you can see from this shot I took whilst riding. It was fun being in a group with the other VMs. Passers-by were standing watching and cheering and it was good fun except for a few dodgy motorists near the end. There was a near-accident with a bus (who got a good stern talking-to by a policeman) and Klaus witnessed a policewoman knocked off her bike and he had a close shave. Still, it was great fun and lovely to ride in such a big group with people of all different abilities and ages. When we got back to the square we lined ourselves up for a photo. And at some point the semi-official photographer got a shot of Klaus and I… and of course Jochen gazing fixedly at Celeste again! 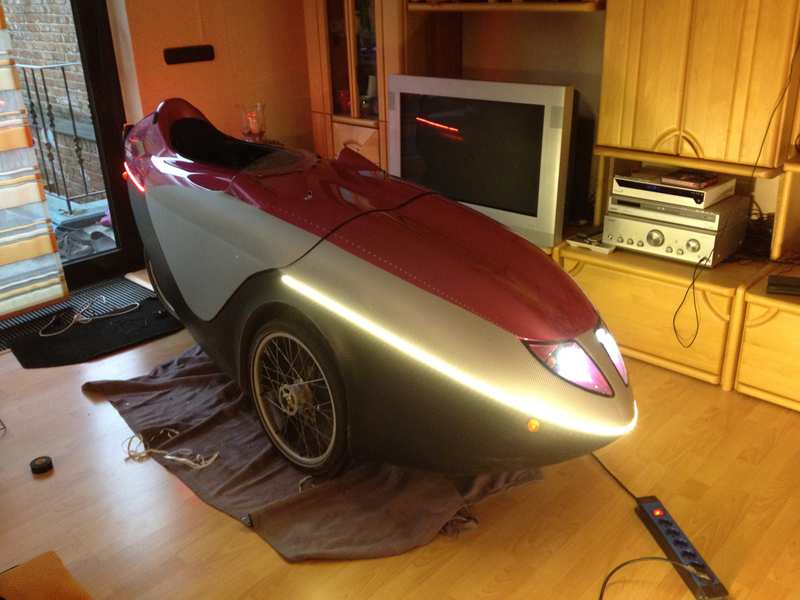 We then rode back in the rain and I was very glad to be dry and warm in the velomobile. I ended up with 82km for the day which wasn’t bad and brought me to the brink of 4,000km for the year. If the weather had been good they would probably had double the number of participants but it was still fun and I enjoyed catching up with cycling friends who I’ve met over the last two years. I look forward to the next Sternfahrt! Here are a few other pictures taken on rides this month. This was Burg Linn near Krefeld early evening. And this was a beautiful morning scene on my way to work one day. And here was a very interesting velomobile that whizzed towards where Klaus and I had stopped for some soup on an evening ride. The rider stopped and had a great chat with us about his Go-One Evo R. He lives in Kaldenkirchen so not so far away from us! Look at the size of that chainring! And you can use it as a knife if riding in reverse! It was very good to chat to the owner Oliver. He says it is a really fast machine but not particularly comfortable on long journeys – it’s a stripped-down racer without rear suspension. I had several days off work as there wasn’t enough for us to do and this coincided with both Gudula and Frank also having a day off so we decided to go on a trip to visit the exhibition within the Oberhausen Gasometer. There exhibition was ‘the wonders of nature’ and consisted of lots of photographs of nature with accompanying text. Lots of the images were from the BBC’s Planet Earth series. Inside were two huge floors with the picture and video displays and then the floor above was something else altogether (more anon). Here are some views of the ground floor. And the first floor which was crisscrossed by girders and beams, most of which had spongy material on them in case you bumped your head! I spent about an hour and a half looking at these two floors and then it was time for the third floor… which turned out to be a real surprise! It was a huge, huge space with a giant globe suspended from the room of the Gasometer onto which were projected slowly moving images of the earth taken from the ISS and other space expeditions. The images slowly changed from night to day with the earth very slowly rotating. It was beautiful to watch, especially as there were beanbags for you to lie on so you could look up at the globe in comfort. And here I walked around a bit away from the stepped seating area which you can just see at the bottom of this photo. I watched the images for half an hour and then they restarted – it was a very impressive show and quite hypnotising. I met back up with Frank and Gudula and they said we should take the lift up to the top. We had to queue but they said it would be worth it – and it was! Firstly, it was a glass lift so we were able to watch as we went above the globe, almost to the very top of the gasometer. The above picture looks a bit like a jellyfish but it is looking down onto the globe and then lower onto the lit steps where people sit to watch the globe. At the top we are almost 105 metres above ground. There was a slight extra bit to climb to get to the very top of the structure. Where there were some excellent views over the industrial areas. And lots of evidence of landscaping by humans. It was well worth a visit to the Gasometer and I will probably go back again to see the next exhibition as it was all so well displayed. A long time ago when dinosaurs roamed the earth people listened to CDs rather than MP3s or streaming music. Because CDs only contain about 45 minutes of music you had to keep changing the CD in the player. Except Sony invented a CD player that, like a slide carousel, held 300 CDs in one machine and worked rather like a jukebox. I had one of these. I bought it back in 1992 or thereabouts and have used it ever since as the sound quality is much better than an MP3 player. However, it had started making some strange noises when rotating the carousel or selecting the disk… and eventually it stopped working altogether, just making slight noises but not playing anything. It was also not possible to open the door to get the CDs out. Clearly I would have to get it repaired but I had no idea how much this would cost and whether it would be possible. So after procrastinating for a month or so I decided I would take the lid off myself and have a look. After all, to transport it to a repair person I would need to take all the CDs out so they didn’t fall out and get stuck. And with the lid off – you can see all the CDs lined up inside. And from the side (I have removed a whole bunch of CDs here to get a better look). Aha! The problem becomes evident. A rubber band has fallen off the two spindles. We had to remove a lot of the CDs so we had space to move, and then Nils did his surgery. He managed to fit the rubber ring back on the spindles. We turned the machine on and things started to happen but it didn’t entirely work right and when we stopped it the rubber ring had fallen off the spindles again. 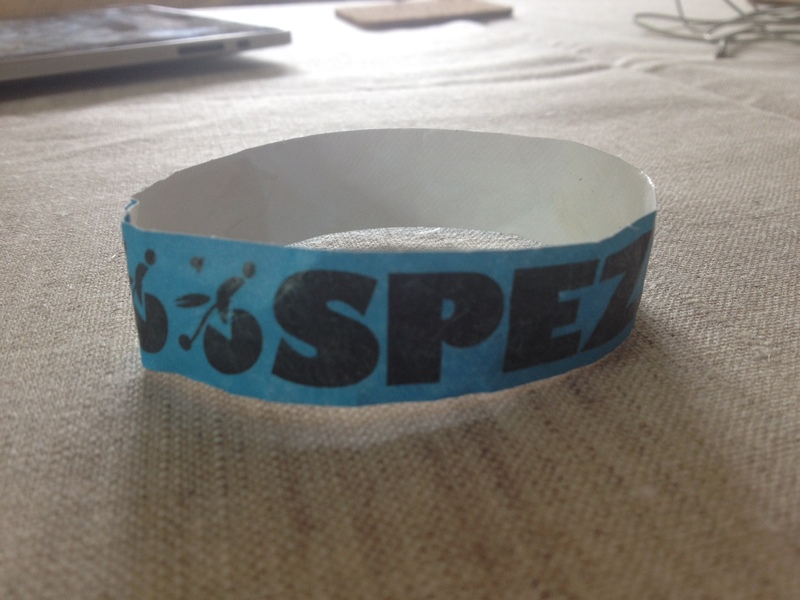 Perhaps it was a bit perished and had stretched (after all, it’s over 20 years old). But we tried again, removing some of the grease from the rubber ring with our fingers (it had dropped into a grease reservoir). And then, the second time, it was working perfectly! So we put the lid back on, I put all the CDs back in (which is rather time-consuming) and now it is back in pride of place working excellently. Top marks to Nils and me for our engineering geniusness! My Dad was always keen on watches and clocks and so I decided to buy myself a nice automatic watch as a way of remembering him. I obviously needed to do some research so wrote to some of the brands I liked asking for their catalogues. I got some amazingly posh catalogues back, including the catalogue from Sinn which was more like a really high-quality hardback book. Eventually after lots of studying and thinking I narrowed down my choice to two different watches by the firm Mühle Glashütte. A jeweller in Kempen had some of their products so Gudula came with me to have a look. I rode Penelope, Gudula used Alfie. I tried on several watches at this jeweller (they didn’t have the specific models I wanted but had others in the range) and decided which one I would go for. I had identified one in stock at a jeweller in Nürnberg and had negotiated quite a good discount so I ordered it and it arrived a few days later. It’s a Mühle Glashütte Antaria Tag Datum and very lovely! Because this blog post is rather long and difficult to download I have gathered all the cake pictures together for this month into one image. Enjoy! 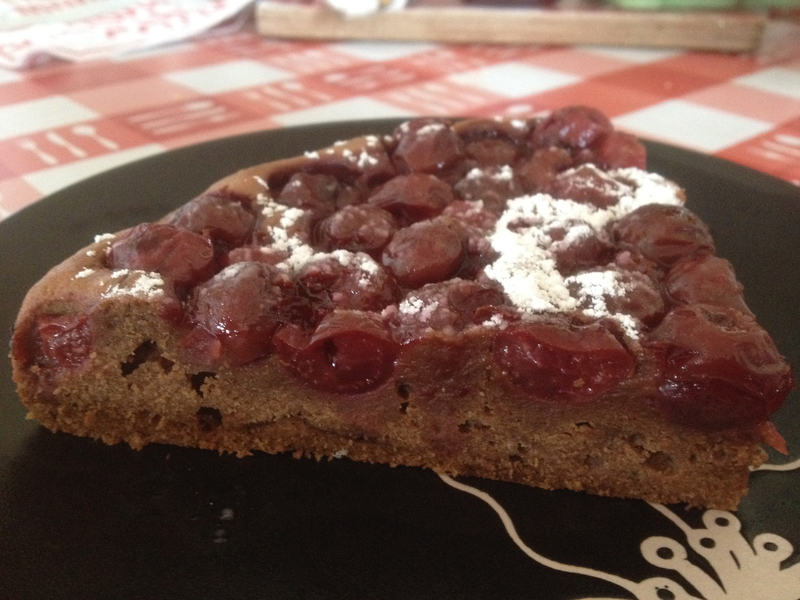 Friend Lara had her twelfth birthday and she and I made a Käse Sahne Torte the day before. It’s been a little while since I’ve written about Penelope but that is partly because she has been a bit of a ‘work in progress’. I mentioned in some of my earlier blog posts that she had sustained some damage from two accidents when friends were riding her (they each rolled her onto her side – once each side). 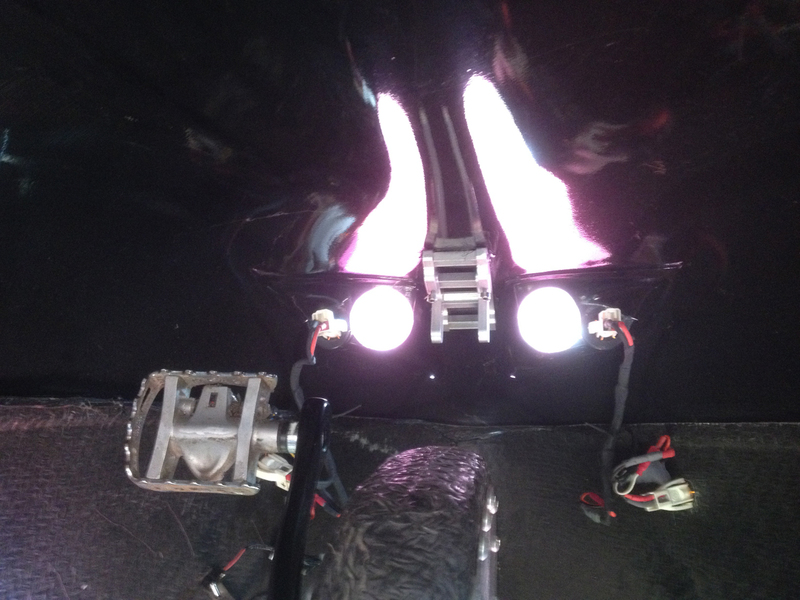 I had also been working on improvements to her lighting as the installed lights weren’t bright enough for night riding. Penelope is nine years old and her LED lighting (running on a 12V system) was a bit of a mystery to me. There was a mysterious black box near my feet (which had a plug which occasionally fell out and plunged me into darkness) and there were three different levels of brightness. These were dim, slightly less dim and very slightly less dimmer. In other words, riding Penelope in the pitch black with just the installed lights was a very scary experience. My initial solution was to buy a decent battery-powered light and mount it on Penelope’s upper side, attached to the place where the Versatile Roof fixes on (so I could only use this light when not using the roof). This improved matters enough that I could ride a bit more easily. 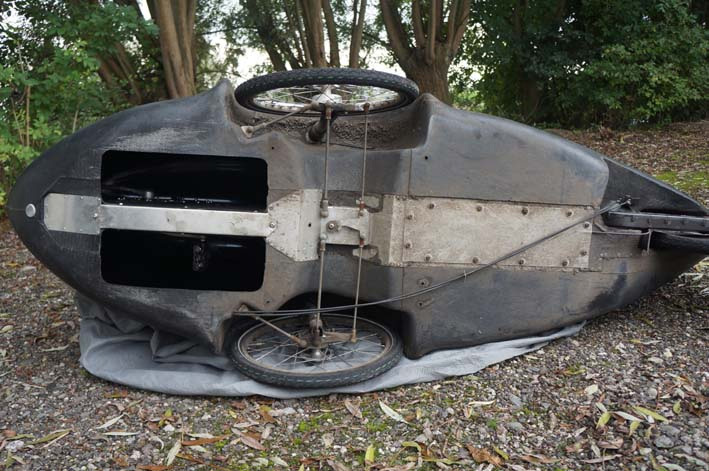 However the perennial recumbent three-wheeler problem persisted – when you go round corners the light does not go round the corner fast enough for you to really see what you are doing. So eventually I mounted the light on a bicycle helmet (I don’t usually wear them) and that worked OK. But it meant I had to wear a bike helmet (which I don’t like) and that if I was riding in the day (no helmet) I had to take the helmet with me in Penelope for a return in darkness. I also looked rather bonkers! It seemed a very sensible plan to upgrade the pre-existing lights to something much brighter. I swear by the lights from Busch & Müller (as do lots of cyclists) and the German online bike shop kurbelix.de had the lights I would need for just a shade over 30 Euros each. Bargain. I am no electronic engineer. Fortunately I know two of them (my husband and Klaus) and I managed to persuade Klaus to have a look at the lighting for me with the thought that James might do some work on it when he next visited. 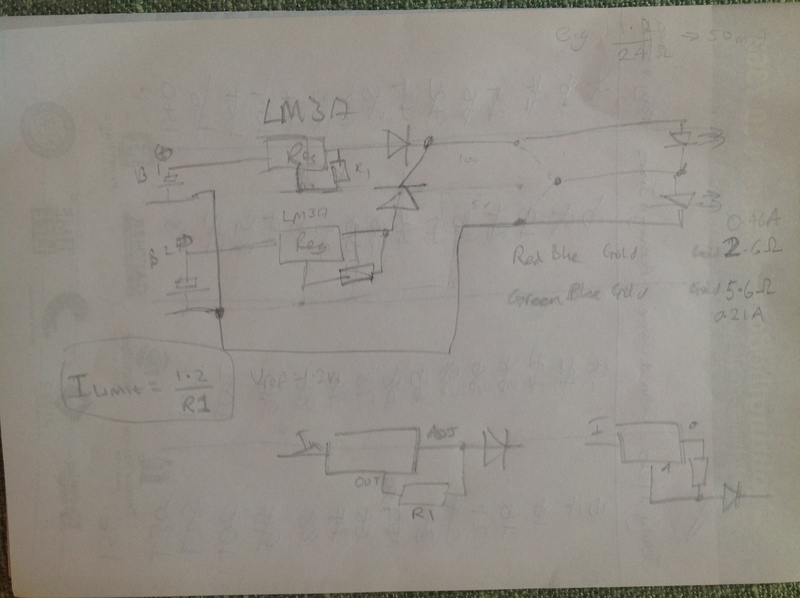 Klaus spent some time playing with a test meter and then decided on a first plan of action which would involve wiring the two 6V Busch & Müller lights (Lumotec IQ Cyo Plus 60 Lux) in series for my 12V system. Although series is a bit rubbish it would be a good first step and we could decide how good the lighting was. He had to buy a few bits and bobs for the job – here they all are! 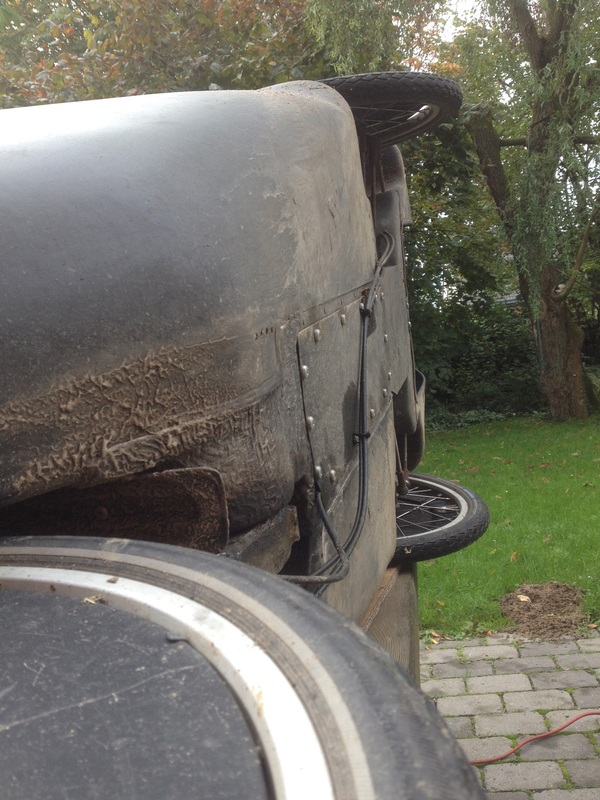 On a sunny Saturday in October we planned to do the first bit of work on Penelope. It was decided to do it here in my house (as Frank, my landlord, has a very comprehensive tool room). The first thing was to get Penelope in a position where she is easy to work on – in other words, lying on her side on a table. Frank, Klaus and I lifted her up and chocked her so the lid could be open without putting too much pressure on the hinge. 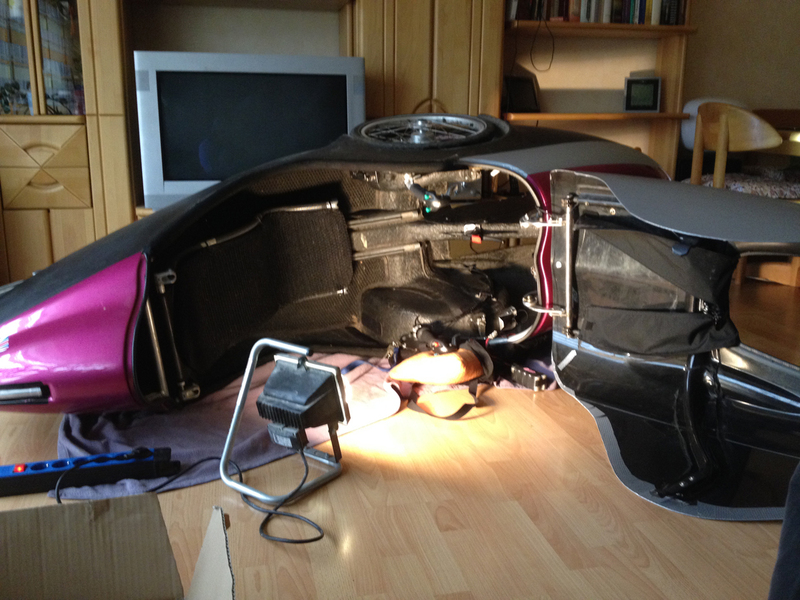 And when you look inside you see this jumble of wiring and the metal frame in which the current lights were fixed. There were wires going from the battery area to the mystery black box and from there to the lights, so the black box was removed to see what was in there. The penciled circuit diagram sketch is actually the old ‘mystery’ circuit from the black box – configured as twin current regulators. 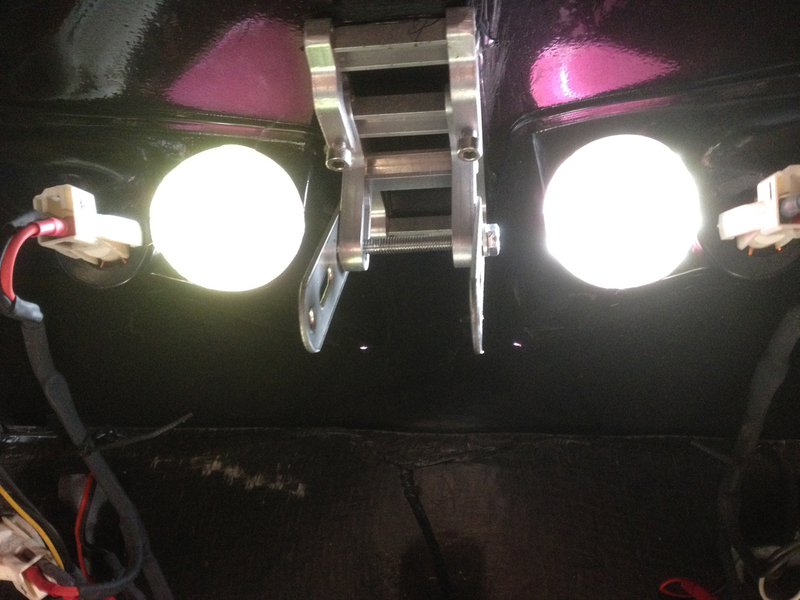 With the black box out it was time to also remove the existing headlamps. 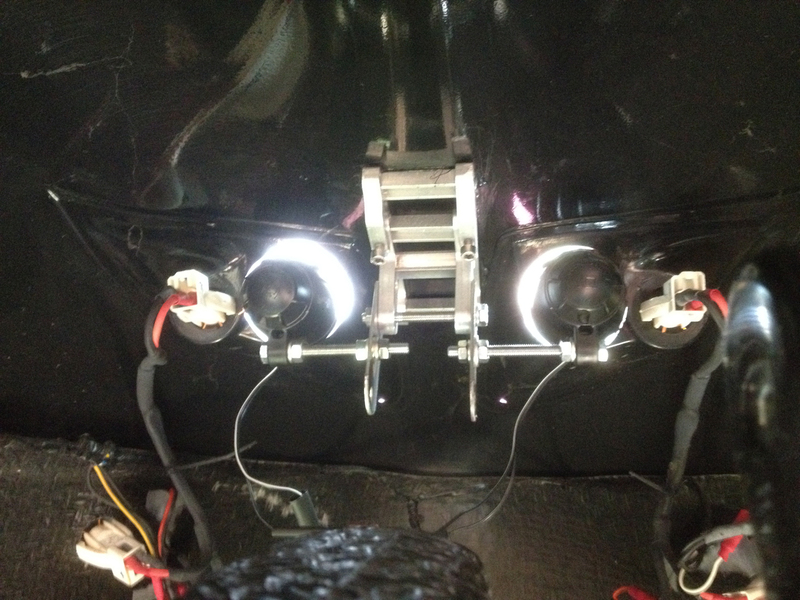 And here’s the view from inside with no headlamps (the wiring you can see goes to the indicators). And the very solid frame that the lights hung from. 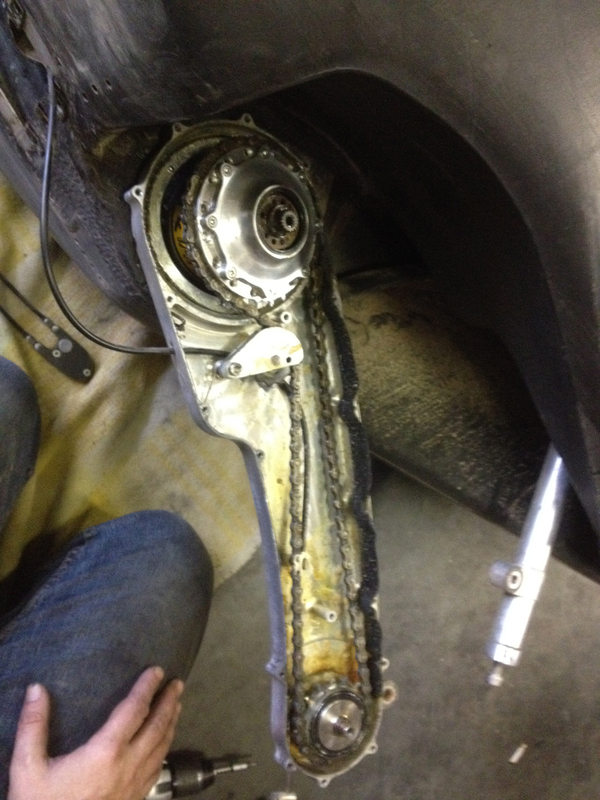 Here is the gubbins removed. Frank my landlord had looked at the frame and bought a couple of items he thought would work to mount the lights – he explained his suggestions to Klaus who was doing the fitting and it all seemed good. 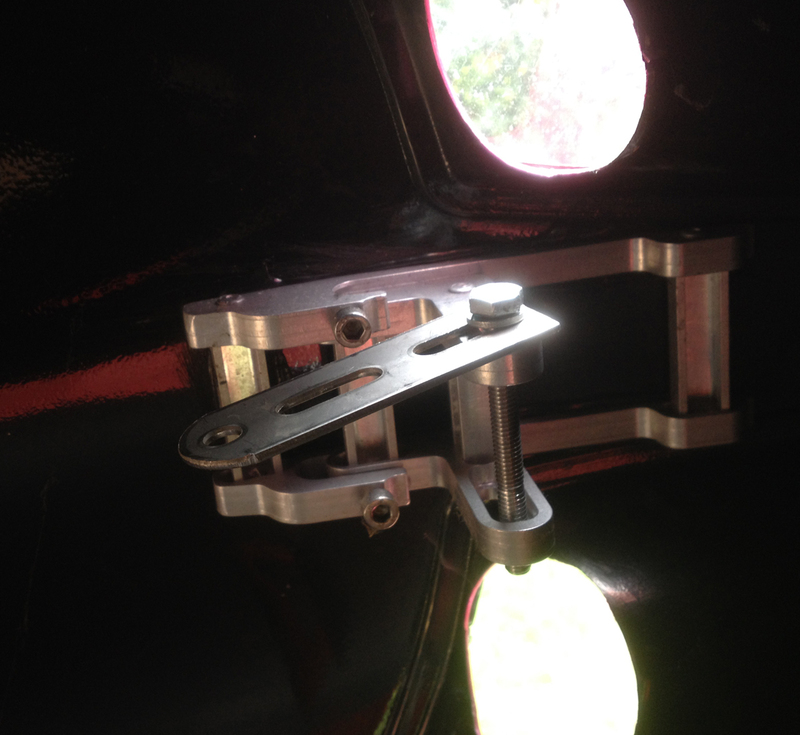 First of all an extra bracket was fitted to attach the lights to. And another one for the other light. The idea was to pass a screw across the bottom of the light (B&M lights are designed for this) and to attach it to the bracket, but the screws that Frank had didn’t have long enough threads. But it turned out Frank had a special thread-lengthening tool which Klaus used to make the thread go the whole way down. 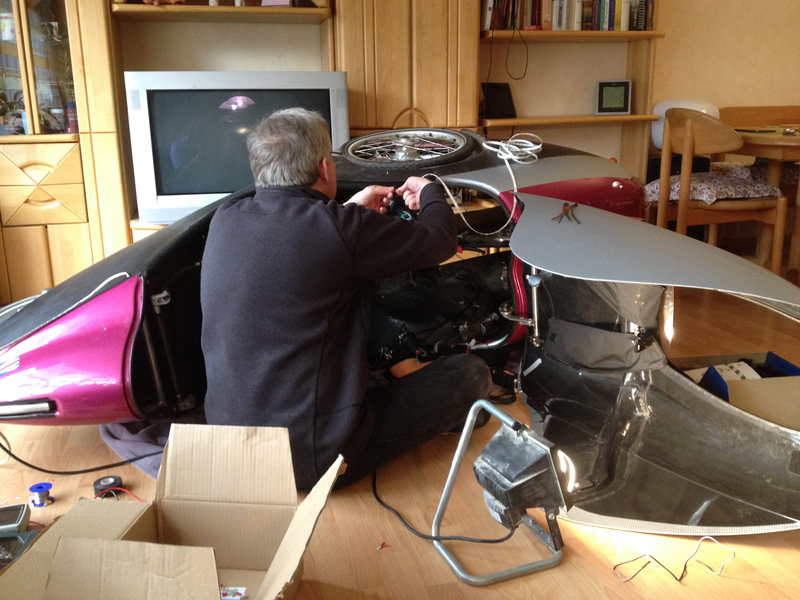 The wiring from the lights to the main power obviously needed to be done so that was the next job for Klaus. He had spent a lot of time with his test meter working out which cables to use as there were rather a lot jumbled up in Penelope’s nose but he found one that provided 12V so that was used. The second cable was just put aside as it wasn’t needed. 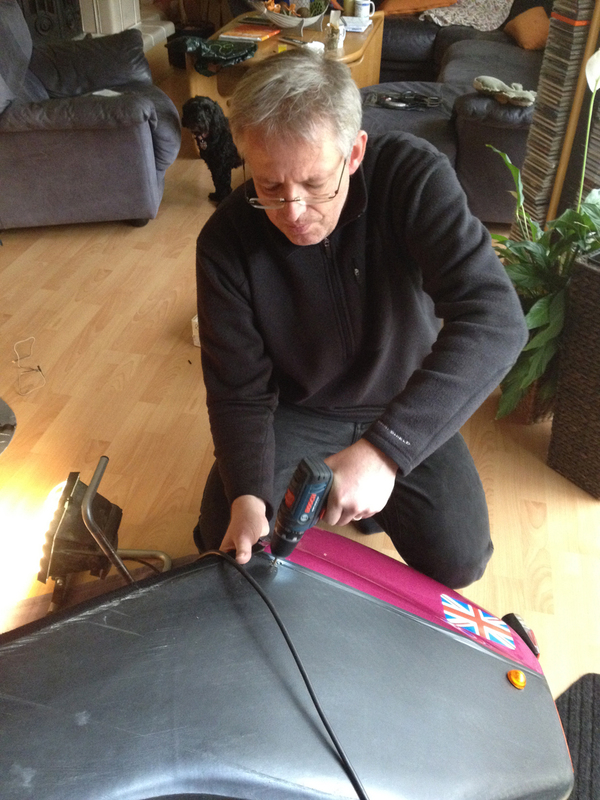 Then Klaus fitted the new lamps – which was a surprisingly fiddly job. They JUST fitted in the cut-out in Penelope’s eye sockets. And here you can see the mounting point and the new wiring. And then to wait for darkness to fall to test the lights. 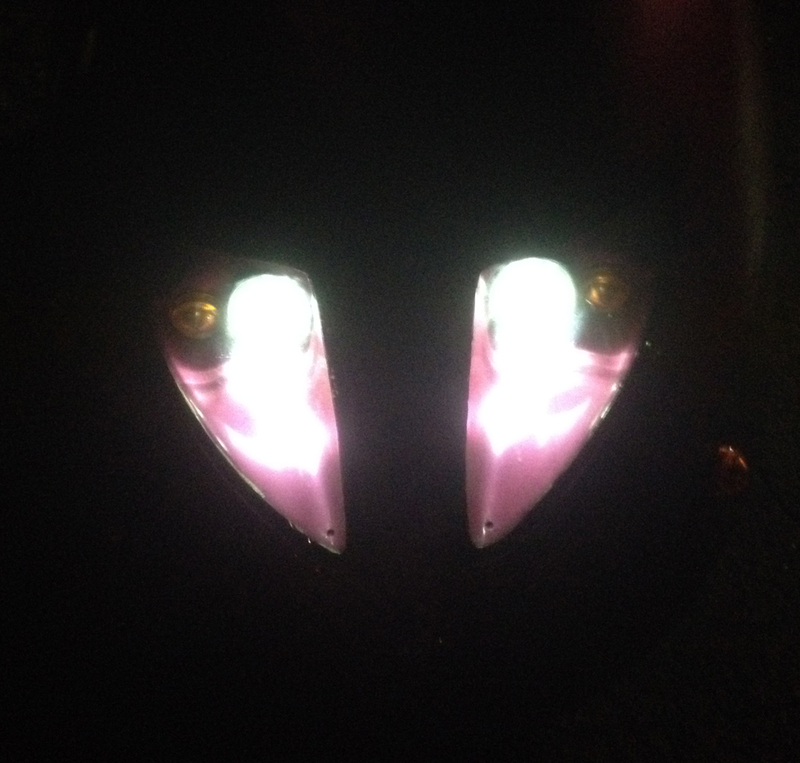 I then used Penelope a bit for some evening rides and very quickly came to the conclusion that they were still not bright enough for safe usage. So Plan B (which was always in Klaus’s mind) would have to come into play in due course. 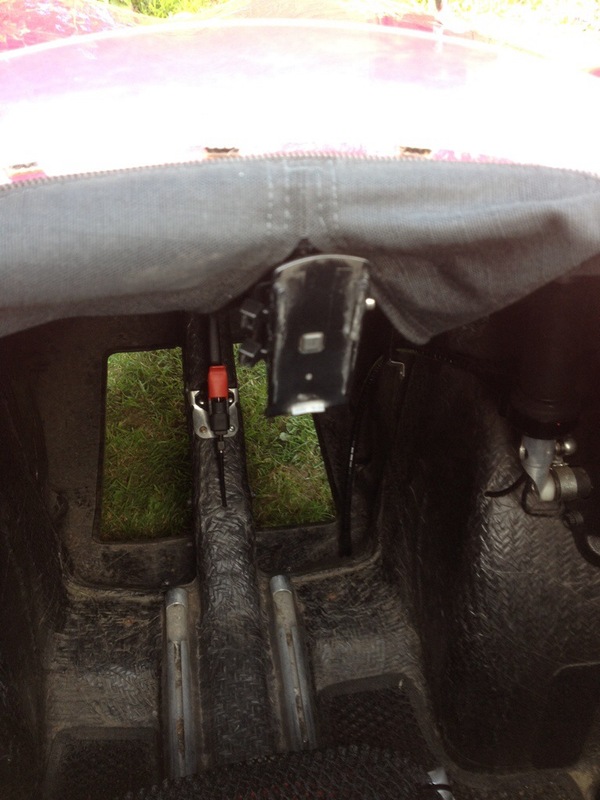 As I was riding to my VHS German course one day I turned the grip shifter to change gear and… nothing happened! At the time I was crossing a busy road with the green pedestrian traffic light so I carried on pedalling very fast (I had attempted to change up two gears) and tried to work out what had happened. It seemed that the Rohloff was stuck in one gear, a fairly low one. Which was inconvenient 10km into a 40km round trip. 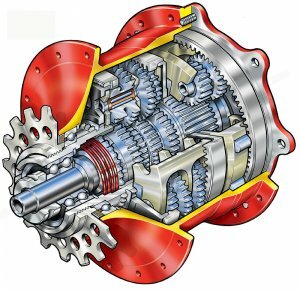 I soon realised the problem was not actually with the gears but with the attachment between the grip-shift and the gear system. The problem with grip-shifts on recumbents is that you have to use the opposite side of your palm from your thumb to grip to change gears (on an upright bike you are using the circle between thumb and forefinger). The heel of your hand is not very good at making a strong grip (which is the problem I often had with the grip shifts on my Trice Q in the rain). So what the makers of the Versatile did, very sensibly, is attached the Rohloff’s grip shift to the entire handlebar column that you hold – so you turn the entire thing. 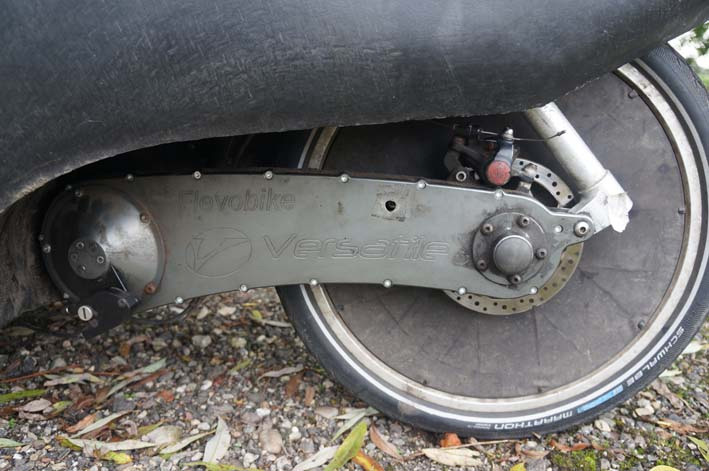 Basically the superglue (yes, that’s what Flevobike used) had failed after nine years. It was possible to change gear by twisting the very bottom section (in this photo I have lifted up the twist grip so you can see the underlying metal) but this resulted in skinned knuckles. Fortunately Frank glued this for me and harmony was restored. It did actually fail a second time (Frank hadn’t had the ideal glue) whilst my husband was visiting so we invested in some superglue and it was further repaired and seems to be holding well. 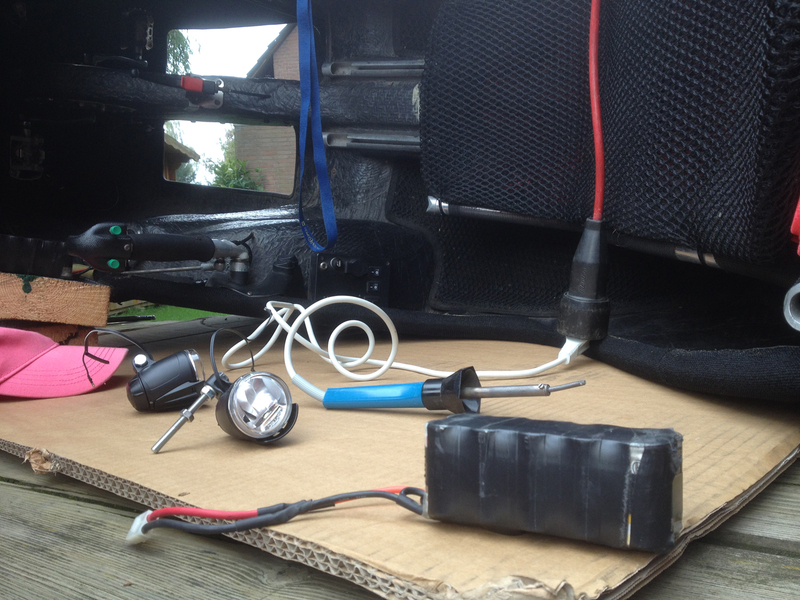 Lighting Upgrade Stage 2 – Why did it go dark? As mentioned above, I had already realised that the lighting upgrade was not enough for safe cycling in the dark, so had continued to use my helmet-mounted light as well. 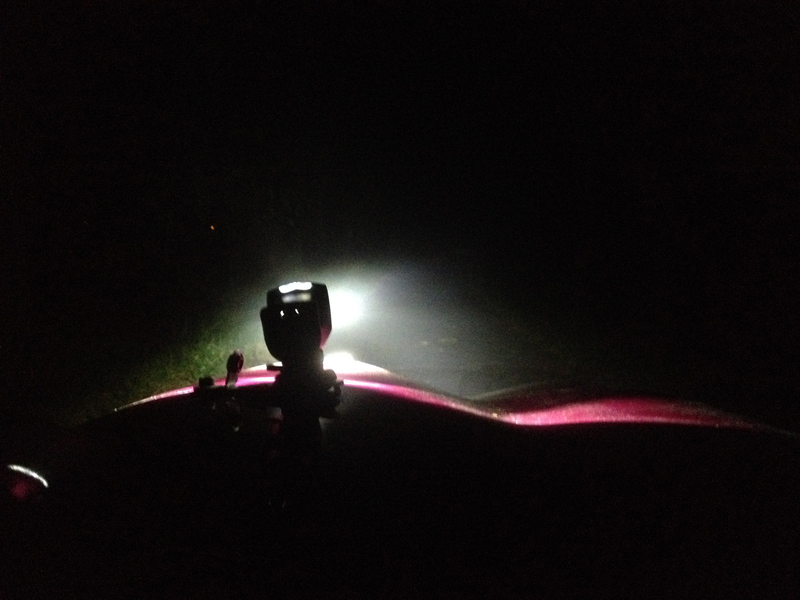 Which was rather fortunate as one day, 3km from home, the main headlamps went completely dark. No light. I had had occasional flickers from the right-hand side lamp but this was rather more dramatic. I rode home just on the head torch and sent Klaus a message. He suggested bringing Penelope to his house the following Saturday (when I had my 3 hour choir practice fairly near where he lives) and he would borrow a testing gadget from work and have a look whilst I was singing. 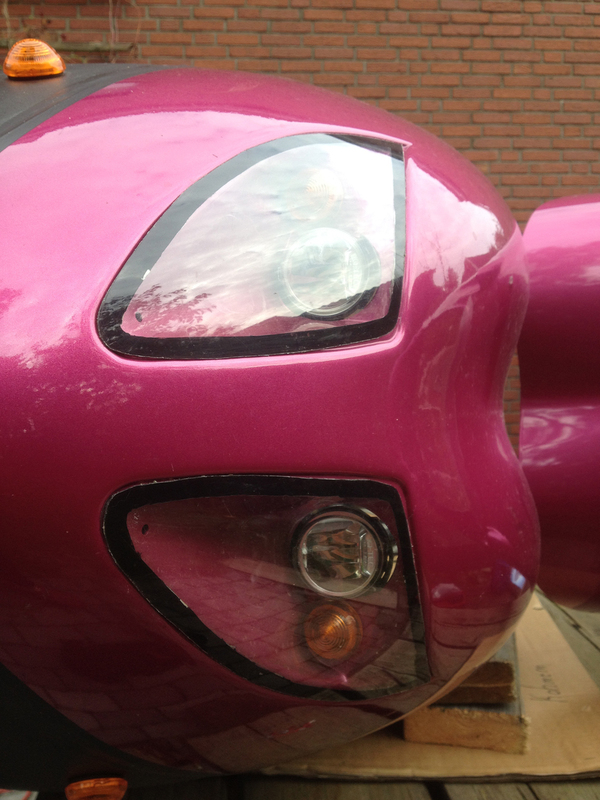 This was partly to check different brightnesses if we ran Penelope’s lights at a higher voltage. Apparently these lamps have a LOT more light at up to 7.5V. Friend Kim had given me various advice following testing of a lamp for her partner’s trike but the situation of these lamps is slightly different (behind a perspex screen so no cooling airflow). Klaus wanted to check the temperatures when they were running at higher voltages. Klaus had spent a lot of time testing brightness and temperature at different voltages, as you can see here (testing both lamps together). His conclusion was that he was concerned that if we ran the lights in parallel at 7.5V they would get too hot but he thought 7V would be OK. I managed to negotiate him up to 7.2V. James my husband had done some investigation and decided on a mystery widget that reduces the voltage from 12V to whatever we wanted (I spent a lot of time trying to persuade Klaus that 7.5V would be OK but he wouldn’t budge). 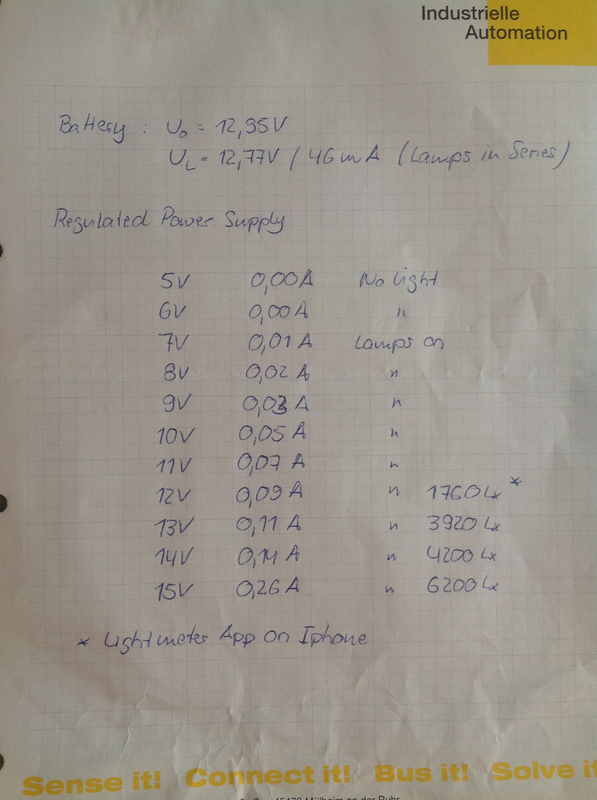 Anyway, we agreed that James would buy the gadget and that when he was here over Christmas or in the New Year we would change the lights from 6V in series to 7.2V in parallel. Klaus couldn’t find out why the lights went dark though (they were working the next day when I tried again) so that was a remaining mystery. As mentioned above, Penelope had some redecoration when being borrowed by some friends of mine. 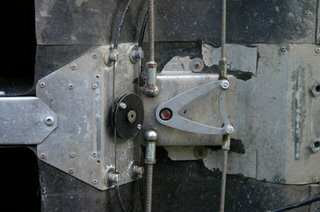 The roll to the right side was at a higher speed so the scratches were more extensive and went forward of the hinged lid. I got some quotes from car paint places for repairs and they ranged from 400-600 Euros which seemed way too much. James my husband suggested that possibly a vinyl wrap (like people do on cars) might be a reasonable option. We both looked into it a bit and it seemed like it was worth a go as if we did it ourselves the wrap would be pretty cheap and if it didn’t work well we could go for the professional paint job option. 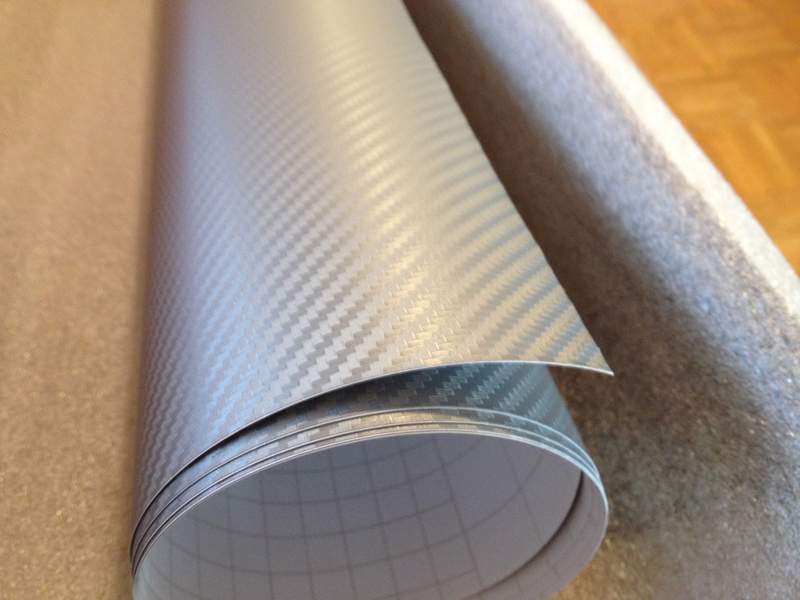 James suggested the carbon fibre-effect wrap so there was a slight pattern (and any imperfections underneath would be less obvious). 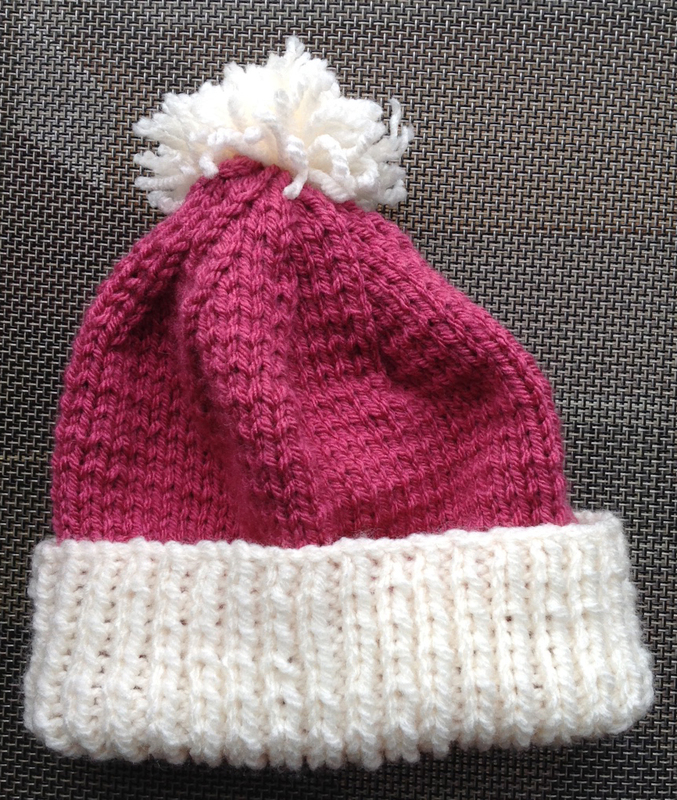 The issue was what colour – the pink/purple of Penelope did not seem to be available. In the end I decided on silver as I thought that would go OK with purple and would also perhaps be easier to see in the dusk (I think that Penelope is not always that visible). 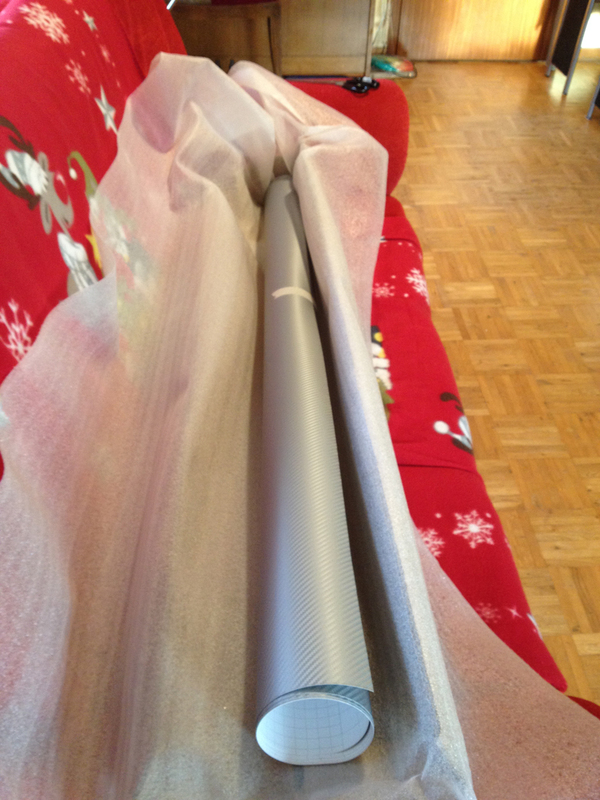 However the actual wrapping needed to wait for James’s arrival in mid-January for a visit. So James and Klaus had discussed everything between them and James had purchased the regulator widget thing that would be necessary to run the lights at 7.2V. 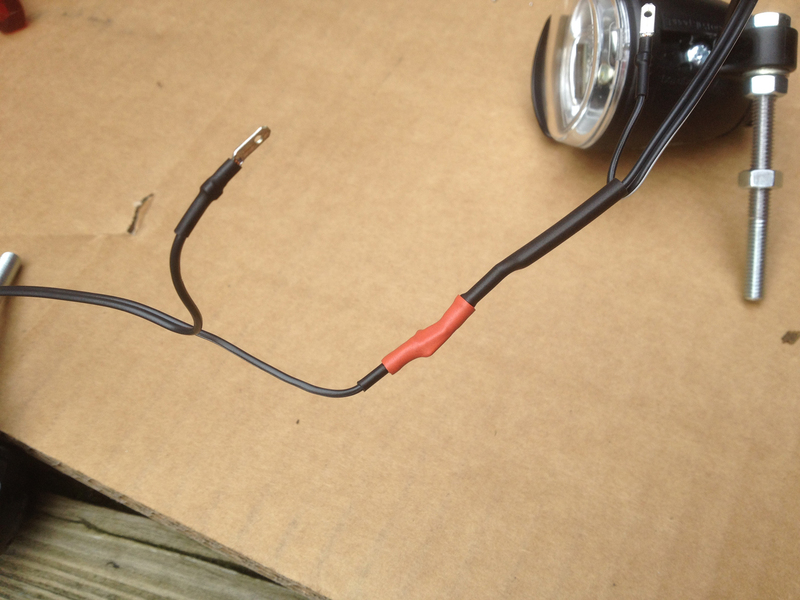 He tested it with a 12V battery at home and it seemed to light up nicely. The regulator was delivered to me in December when my friends from Colchester visited (James gave them a small care parcel for me). But with the busyness of Christmas we didn’t have a chance to do anything about the lighting upgrade until James’s visit in January. Because we needed a Saturday (we might need to buy some parts during the job) it was decided that the day of James’s arrival we would work on Penelope, and in fact Klaus arrived before James got here. He’s a hard worker and settled down to work straight away. James arrived shortly afterwards directly from the Hook of Holland and settled down to a quarter slice of this rather fantastic cake I bought from the local bakery. 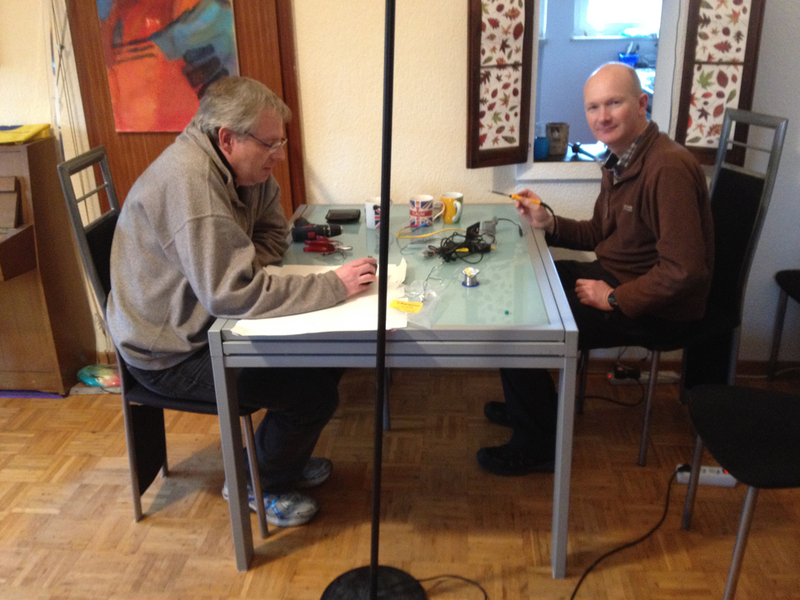 Then it was back to work – two electronic engineers soldering away on my dining table. The plan was to reuse the mystery black box to put the regulator in. 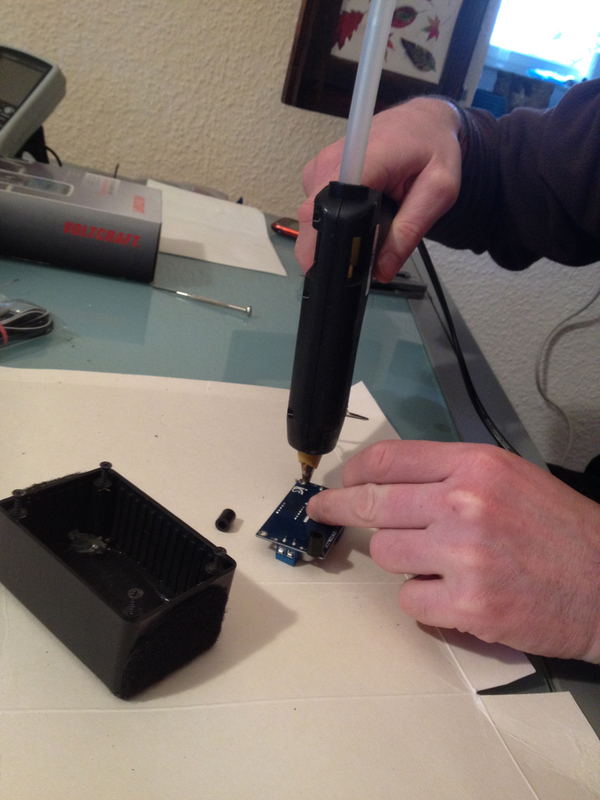 So first of all the contents were removed and then it was necessary to fix the regulator in with a hot glue gun. Rather than using the existing connectors Klaus had liberated one of his work’s special connector thingies to use which would be a lot more secure. 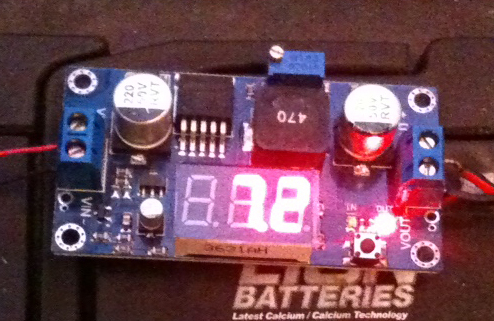 The black box had a small window which now showed a red glow from the voltage readout. Because it would be beyond my feet in Penelope it would not be visible but would be a useful hint that the gadget is working. The weather was really awful (blowing a gale, pouring with rain – James’s overnight ferry crossing had been with force 9 winds) so we weren’t entirely sure where we would do the actual work on Penelope. We had decided we would probably need to use the garage (but remove as much as we could from it) but that would probably mean lying on the floor as there wasn’t a large enough table in there. Fortunately my landlord Frank came to the rescue again and asked our next-door neighbour Gerd, who has a workshop for his historic tractor, if we could use his space. He said yes so Penelope was soon installed in an excellent workshop, protected from the wind and the elements. 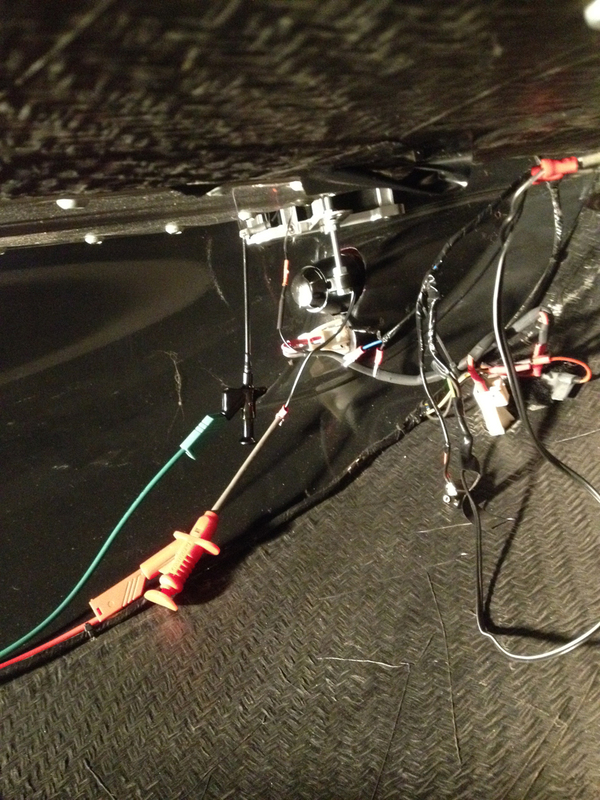 Klaus’s job was to wire the regulator (in the black box) to the lights. James did a few odd jobs around other parts of Penelope, including cleaning up the mess of oil that had come out of the Rohloff. Something was clearly wrong and we had a rather bad feeling that perhaps the regulator was now dead (it was £3.50 from Ebay direct from China so not exactly a major investment, fortunately). Some further investigation showed that the wiring within Penelope wasn’t corresponding to the usual colour scheme so things were swapped around and we had another go, fully expecting the regulator to be dead. But no! Light! It appeared there was a sacrificial diode or something to deal with the wrong polarity (or whatever the problem was – I am a bit hazy on electronics). 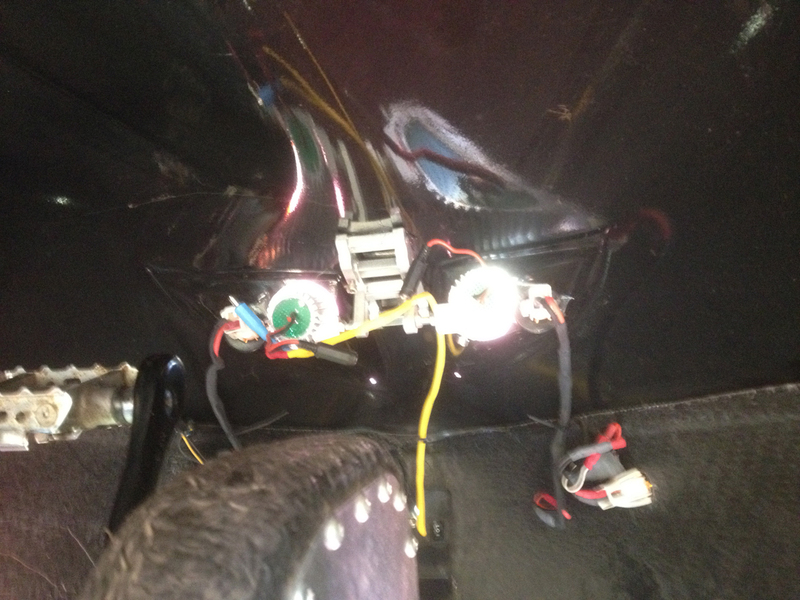 We assume that this issue is why Penelope’s lights failed and occasionally flickered as the wiring was a bit weird. Anyway, when it was all plugged in again wired the correct way round the lights were working! We dialled the voltage up and down and watched them get brighter and dimmer. 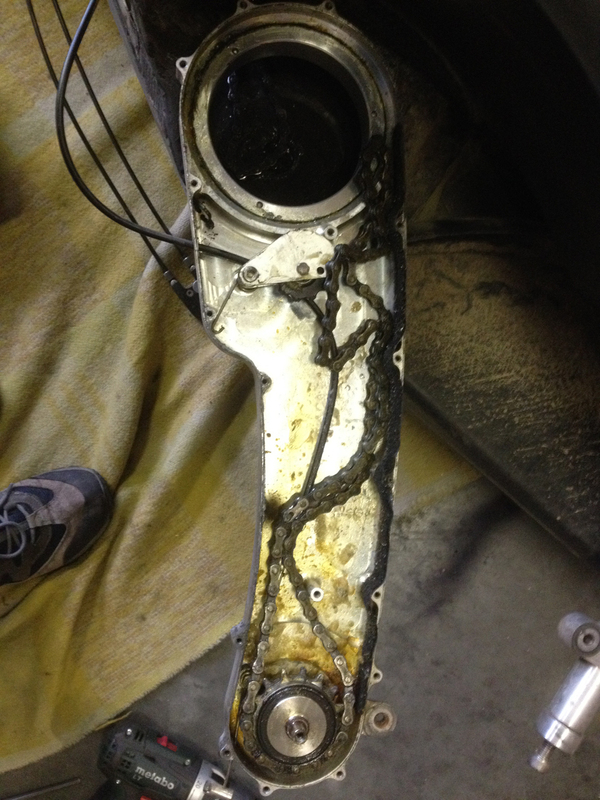 We had agreed 7.2 Volts so that’s what the regulator ended up on. 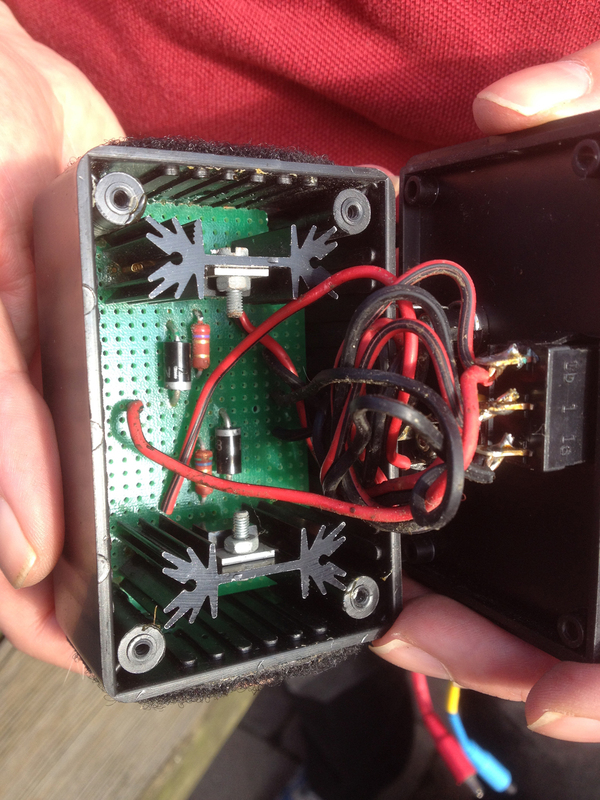 The black box was then sealed and the wires tidied away inside Penelope so that all was neat. She had lights! They were clearly brighter than before! 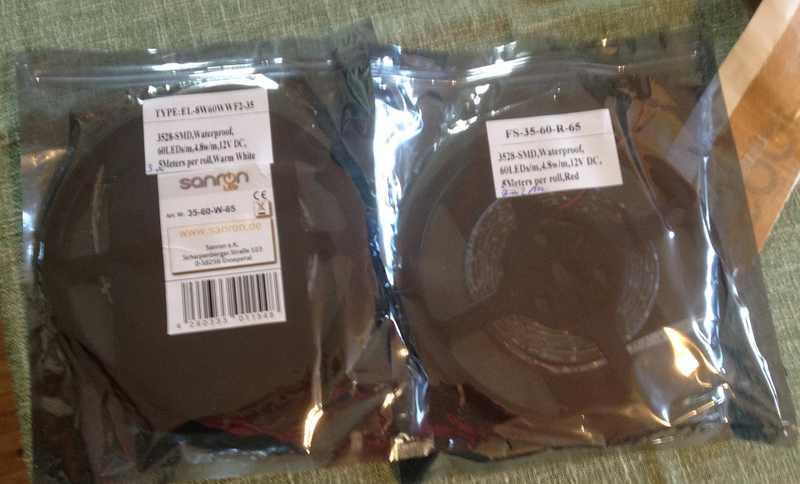 The proof was in the testing over the next few days… and the result is excellent. They are bright enough to ride by without any additional lighting and the 12V battery seems to last a lot longer than it used to. A real success! 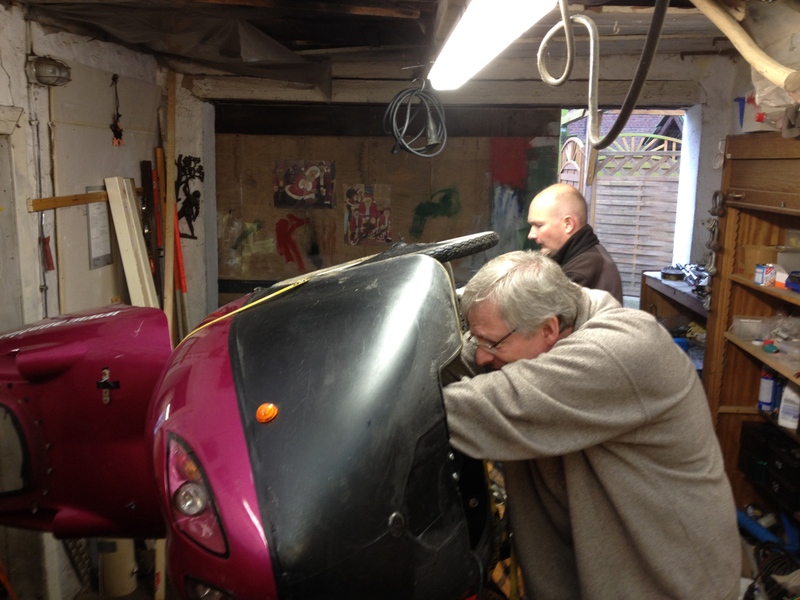 Once again thanks to Klaus and James for all their hard work with Penelope’s electrics. Penelope’s Rohloff is supposed to be serviced every year but it had been almost two years since it was last done and it had been leaking oil for quite a long time (apparently this is normal). 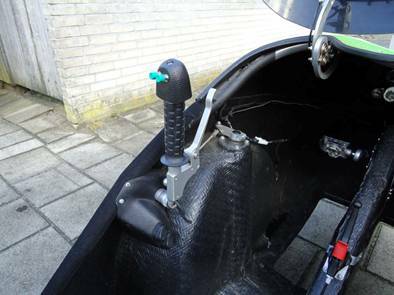 I had struggled to find good instructions on how to do the oil change – the rear swing-arm has to be disassembled – so in the end decided it would be much more sensible to take it to Ligfietsshop Tempelman in Dronten, to Gerrit Tempelman who is a Versatile Velomobile service chap. I had spoken with Gerrit on the phone a couple of times and he seemed very helpful. 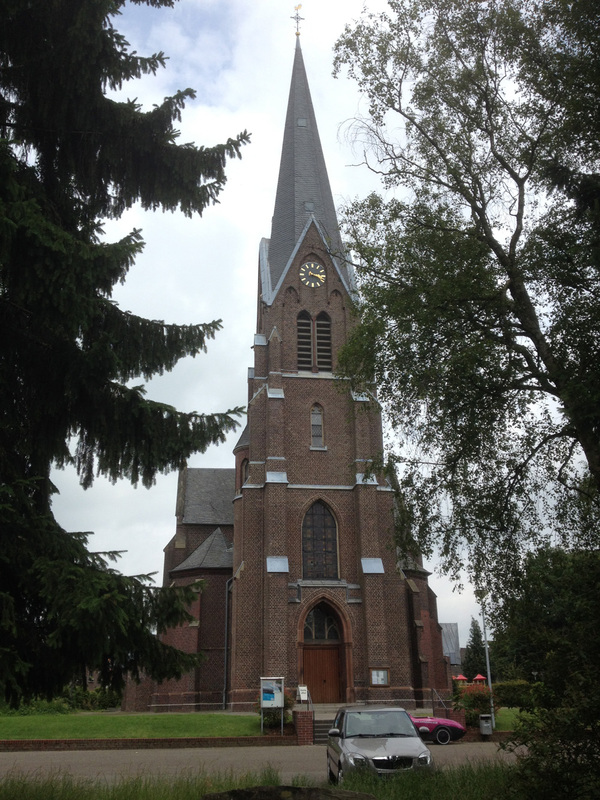 The main issue was how to get Penelope to Dronten (near Lelystadt) in the Netherlands. The answer was, once again, to impose upon the helpfulness of Frank my landlord and borrow his VW Bus. 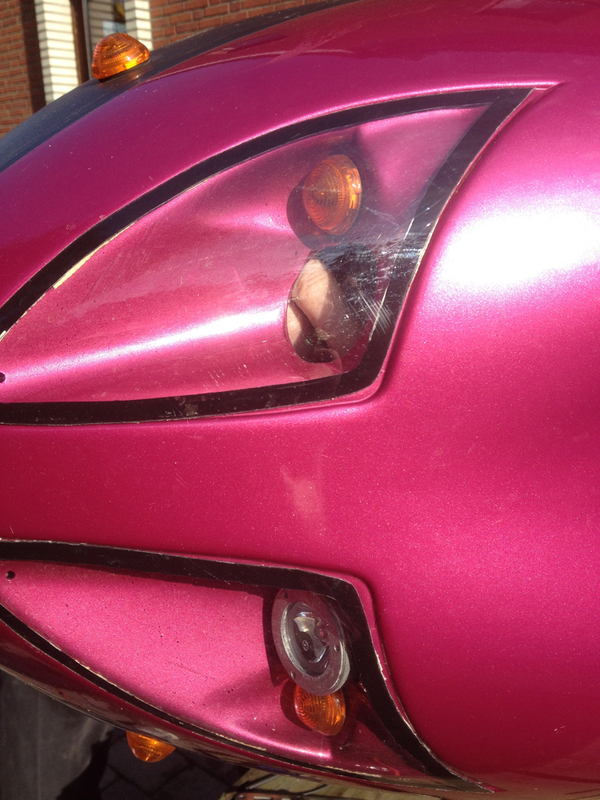 Before we went we gave Penelope a good clean and discovered a previously-unnoticed crack in her upper plastic. We suspect this was actually caused when she was lying on the table in Gerd’s garage when we were finishing the lighting. James effected a repair from the inside with a piece of plastic. this is not a structural element but it was a bit of a shame. Anyway, we headed off in the VW to Dronten on another rainy, windy day. Not a day to be cycling, much better to be in a warm car. We had made an appointment with Gerrit so he had time to do the service and he had agreed we could watch it all so we knew what to do next time ourselves. So Penelope was duly installed on a blanket on the floor of Gerrit’s workshop. One thing about Gerrit – he works really fast! 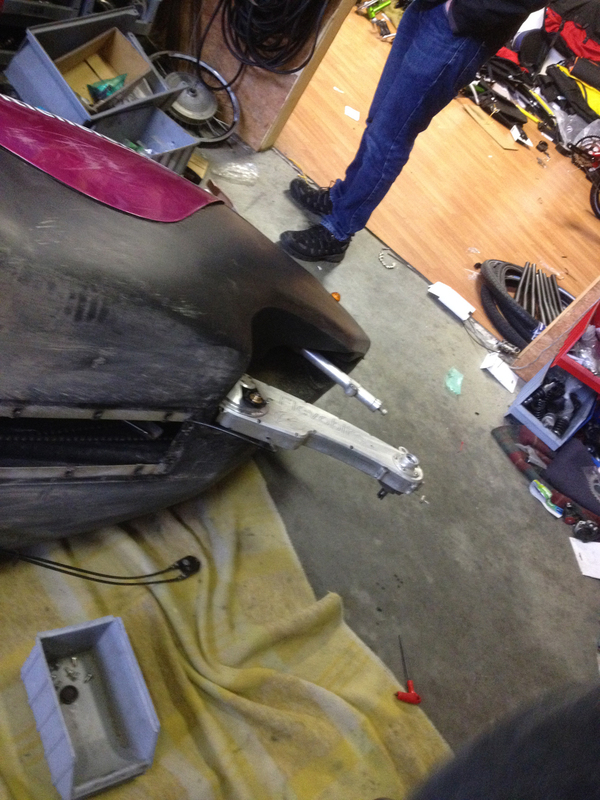 Within just a minute or two the rear wheel was removed so the swing-arm was free. He then undid the panel underneath Penelope to check the chain – it was fine. It is the first time I have seen Penelope’s chain in 5000km of riding. He then opened up the swing-arm. The loose-ish thing at the top is the Rohloff hub. The Rohloff just lifted out. It was pretty much empty of oil so he put some more in and that was that. Normally you’re supposed to run the thing with a cleaning solution and change gear but as that involves completely rebuilding the swing arm, and then undoing it all again, he just adds the oil. He put it all back together again fairly quickly (the whole thing was less than 15 minutes) and checked the idlers for the chain. Because of the problems mentioned above with the twist-grip shifter I thought it worth having new Rohloff gear cables so he did those too. And then the final major check was the suspension. 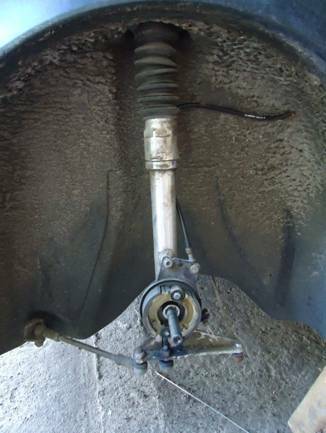 These suspension arms can be rather pricey if they need replacing (I think he said 150 Euros each). 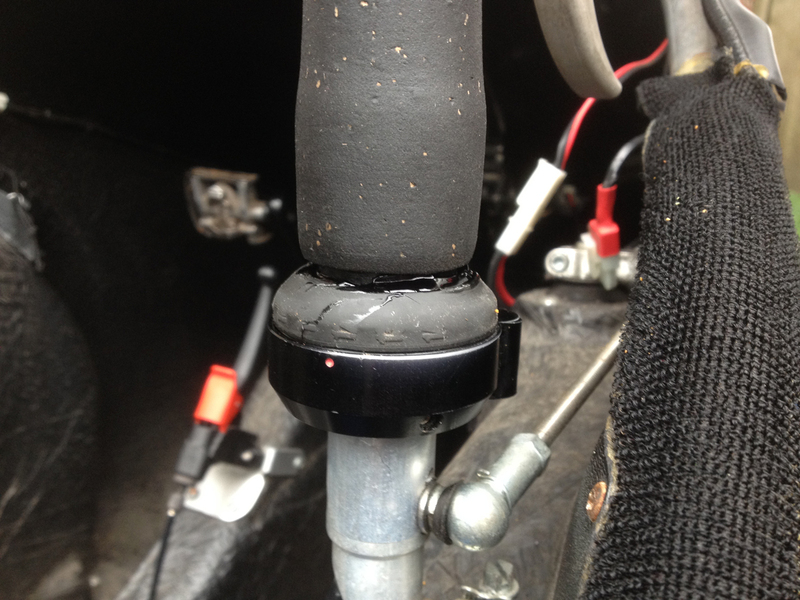 Both had some cracks/tears in the gaiters so he changed them both and then tightened up the suspension. 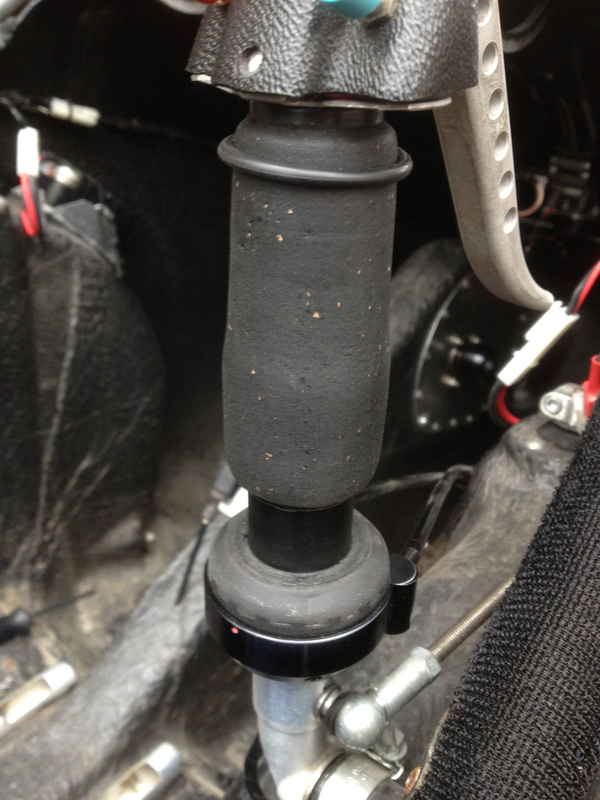 Some play had developed between the two steering handles and this was also improved a bit. I wondered about lowering the seat (it was on the highest spacers) which he thought was a good idea as I am quite tall but he didn’t have the right size spacers. 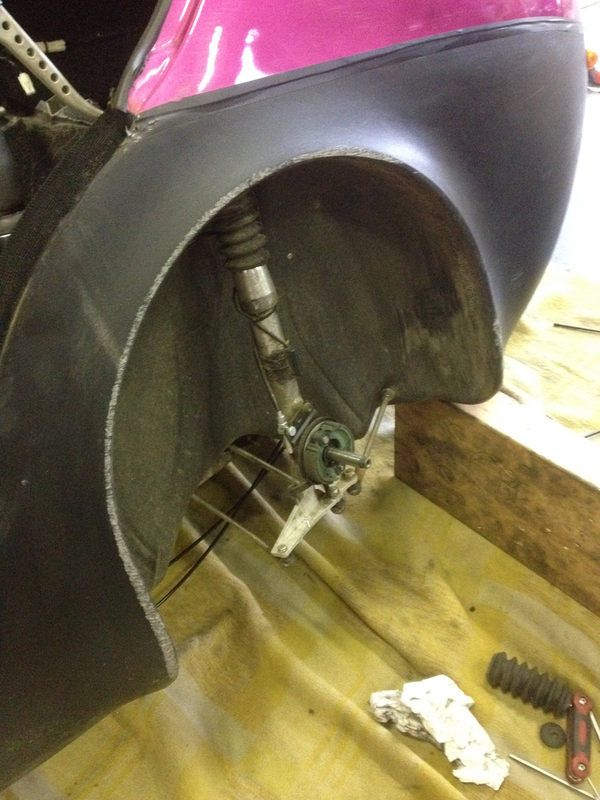 But he is clearly a resourceful chap and put together some spacers from washers and lowered the seat. This was not just to keep my face a bit more out of the airflow but also because it marginally lowered the centre of gravity. I always feel safe in Penelope but the fact that two friends have rolled her means it is wise to be careful. 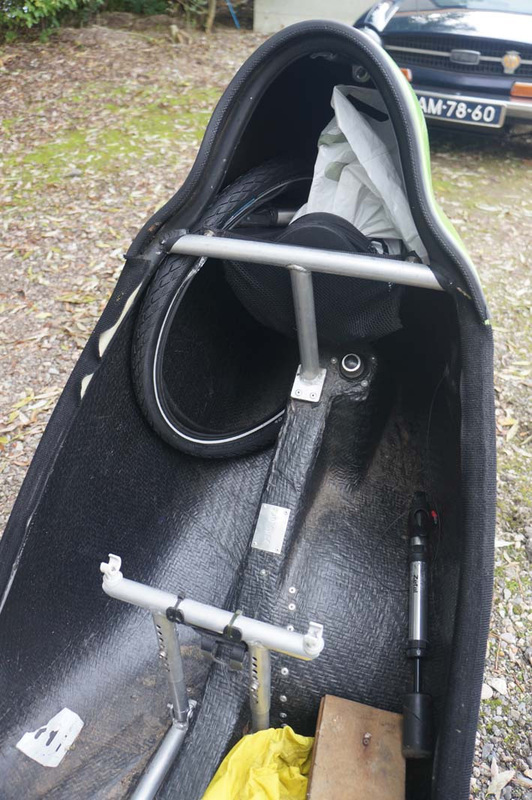 Gerrit said that Versatiles can roll when ridden by people not used to recumbent trikes and probably the reason I have been fine is that I’ve ridden 75,000km in recumbent trikes so am used to them. 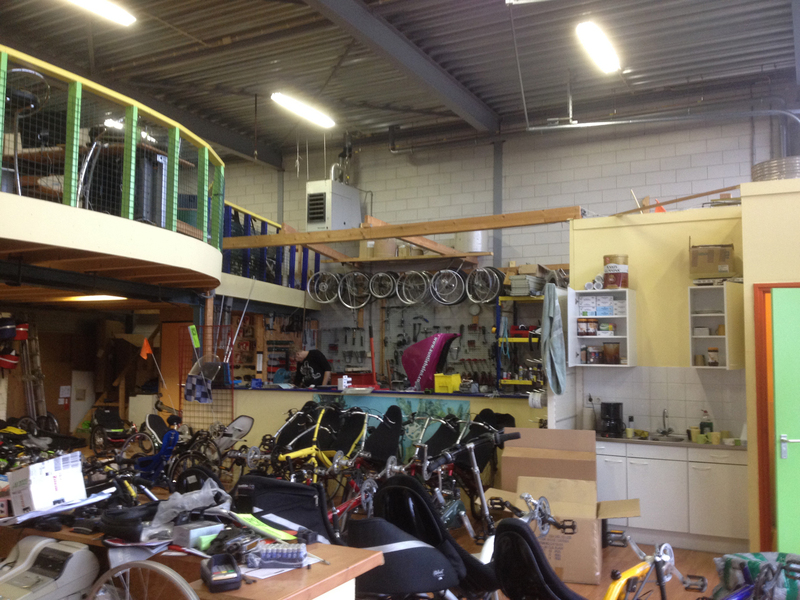 Gerrit’s shop was a real treasure-trove of recumbents and various parts. Including this rather old and battered Versatile that he was servicing for someone. Overall we were there for an hour and three quarters and I was expecting a bill of about 300 Euro for that time (including parts) but was amazed that the cost was only 97 Euro. James and I were really pleased with that and we will definitely take Penelope to Gerrit again if she needs any more attention – excellent, efficient service and a good price. 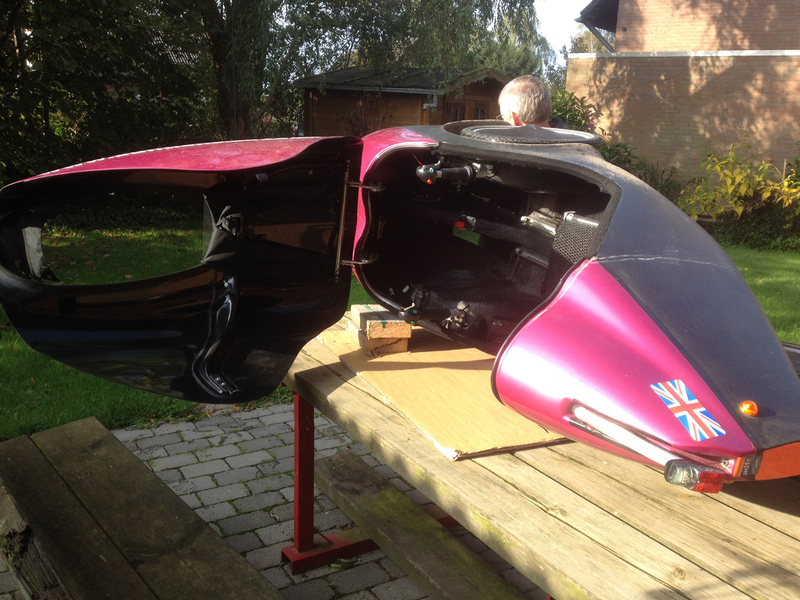 So now James was back in Germany it was time to do the repairs to Penelope’s bodywork both sides. 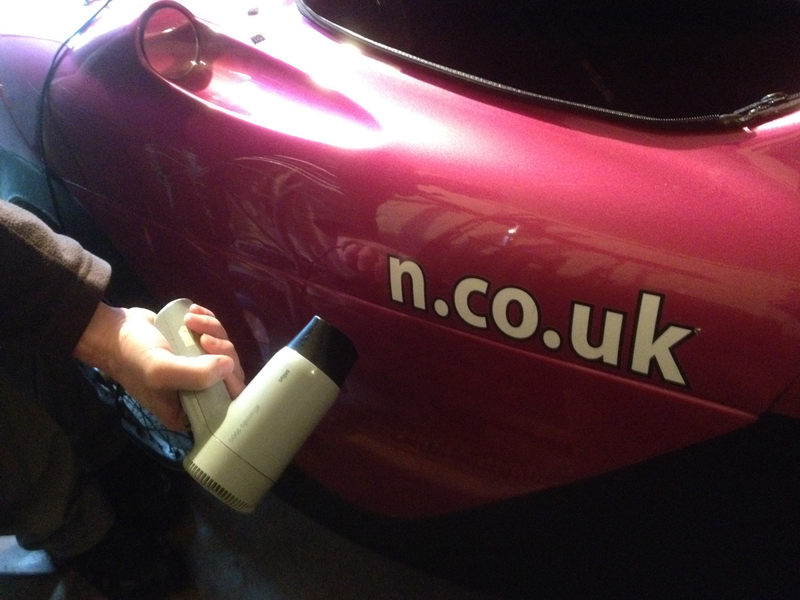 The first job was to remove the signwriting of my blog name. This involved a hairdryer and some patience. 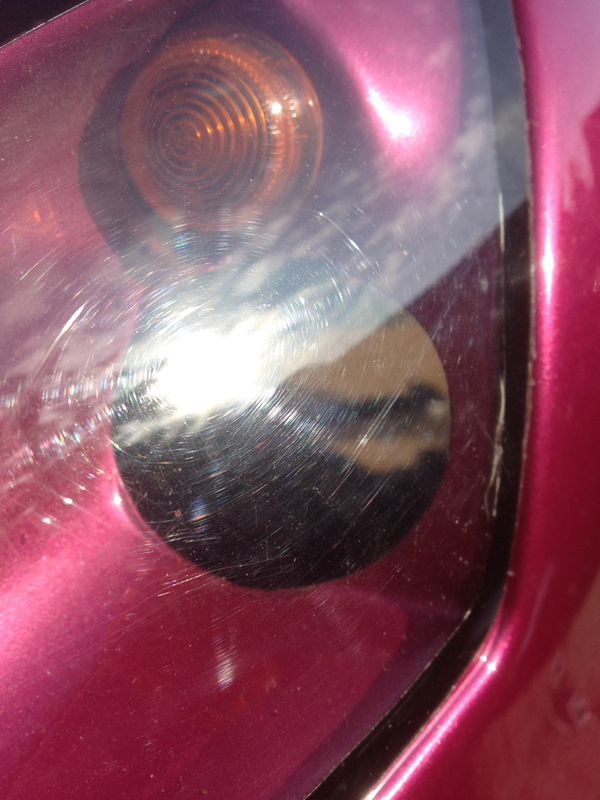 The next job was to fill some of the worst dents/cracks/scratches with some flexible filler. James had bought some boat stuff with him and it worked well. After all this had dried James did a test section of wrap which was mediumly successful but it didn’t stick terribly well. The instructions had said that the wrap worked best when applied with an ambient temperature of 15 degrees or more – but it was less than 5 degrees in the garage. Fortunately Klaus came to the rescue again. He and his wife offered for James to use their lounge to do the work (whilst the rest of us were out at the Karneval event mentioned in my recent blog post). There would be enough space for James to work and also some peace and quiet. So I just needed to ride Penelope to Klaus’s house which I did – he came along too, and had a quick go in Penelope. 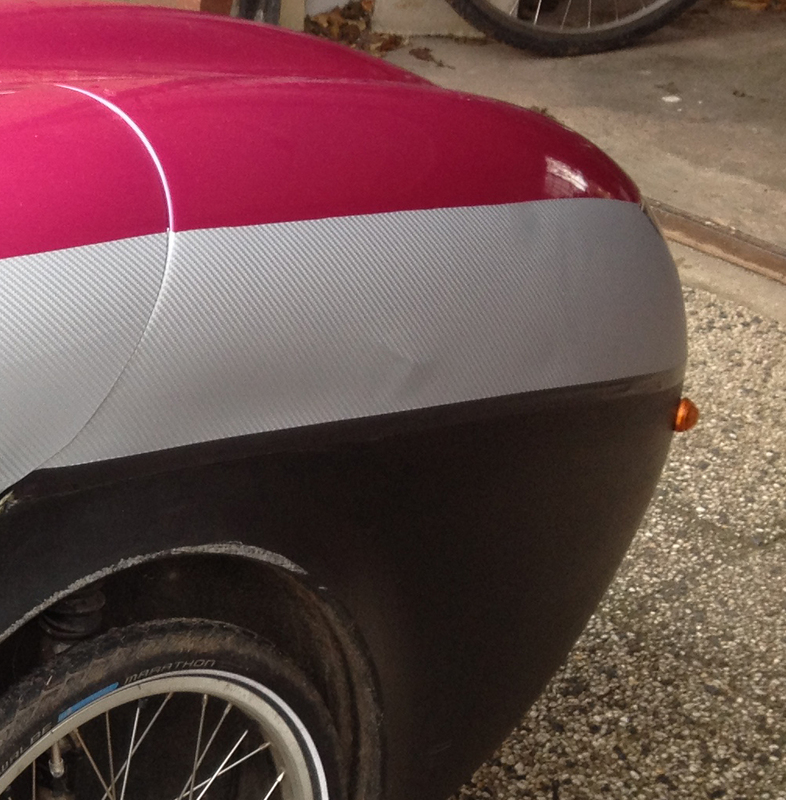 Here you can see the filler on the side panel and the first section of vinyl wrap. 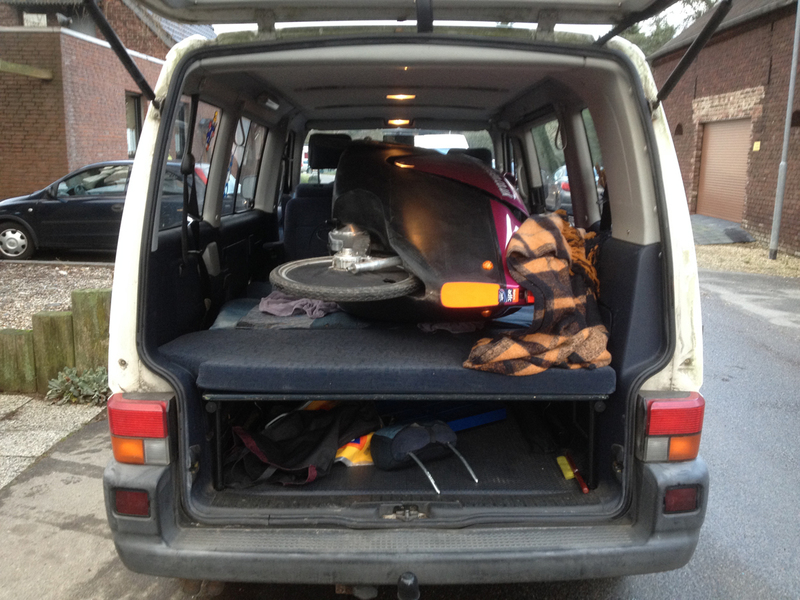 So I rode to Klaus’s house in Viersen with him and James came along by car with the wrap and tools and whatever else was needed. Here is Penelope safely installed in a nice, warm living room. James just had to get started. We all disappeared off to Karneval (for another three hour session of shouting, watching people stomping around in strange clothing and attempting to catch flying food and small gifts) whilst James (and Poppy) peacefully worked on Penelope. He had done an excellent job (Poppy was impressed too). 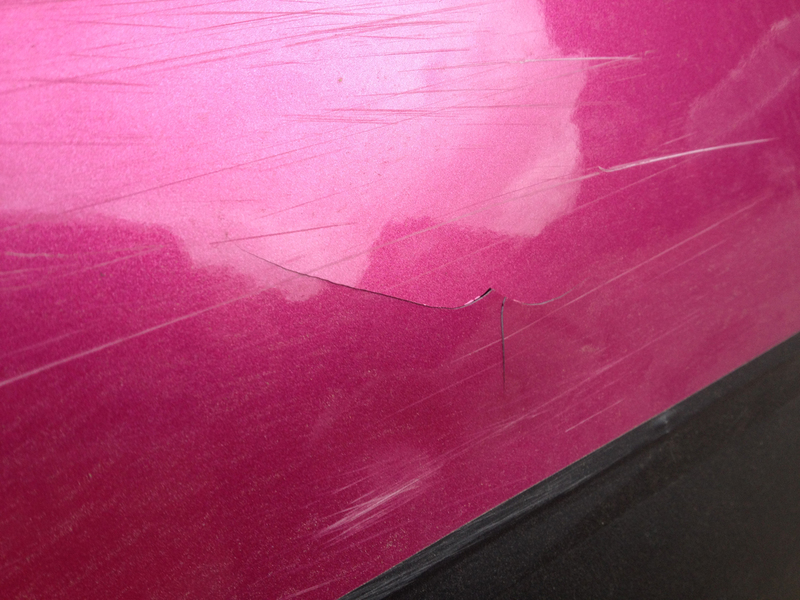 The crack in her side was still a little bit visible underneath the wrap but all the other scratches had disappeared. This was an excellent job by James as you can see. I think the silver helps with visibility too. 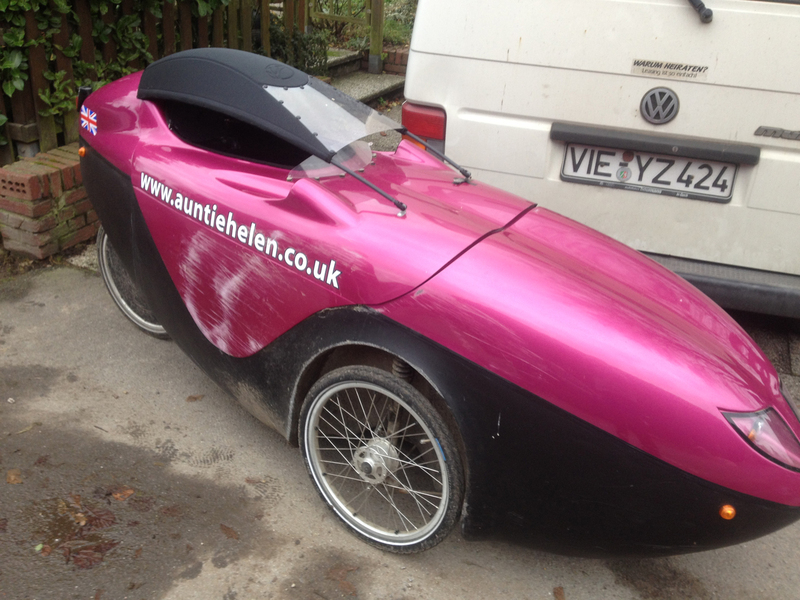 I am vaguely toying with the idea of getting James to wrap the rest of her on his next visit but there would be some extremely tricky areas round her rear-view mirrors and lights so it’s probably just best to leave her like this – two-tone trike. I sent pictures of the new look to my mother in law who then stumbled across the perfect hat for Penelope at a church bazaar and bought it for me. 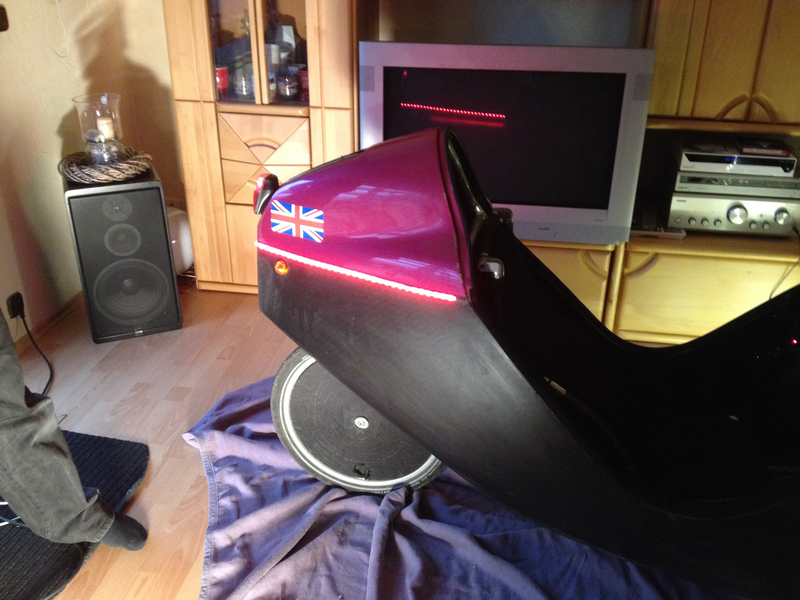 On the German Velomobilforum I spotted a photo of an Orca (newer version of the Versatile) with LED striplights along the side. Of course I HAD to have these. 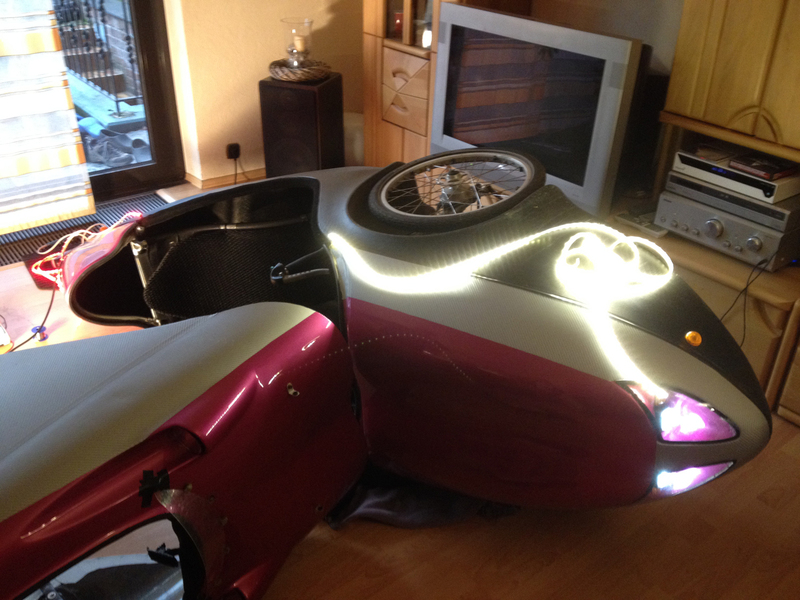 I contacted the owner of the Orca and asked what he used and he sent me the information so a few days later I had ordered some white and red 12V LED striplights and once again twisted Klaus’s arm to fit them for me. 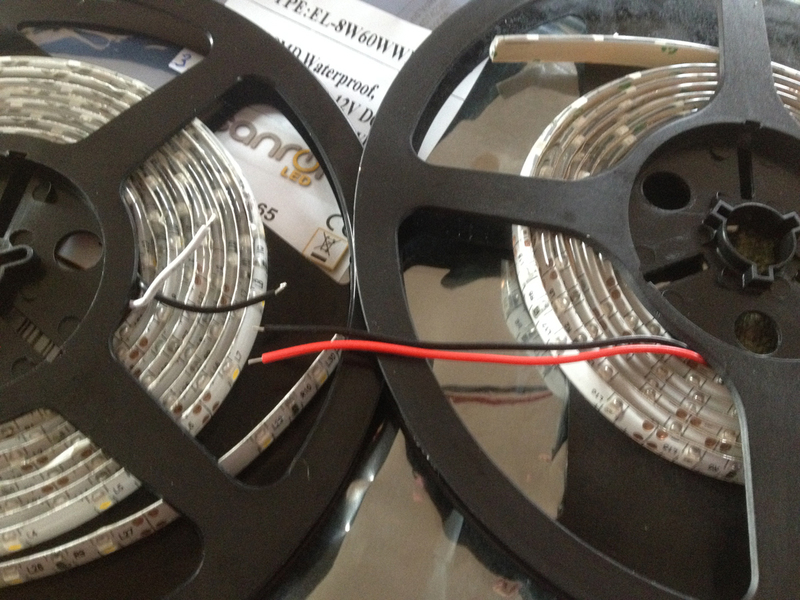 The package arrived – tiny, tiny lights, 60 per metre. Poppy was impressed with them too. I had 3 metres of white and 2 metres of red. The guy with the Orca had said that I would need 2.5 metres of red and 1.5 of white (but they only came in full metre lengths) so we had a bit of spare as well which might be useful. 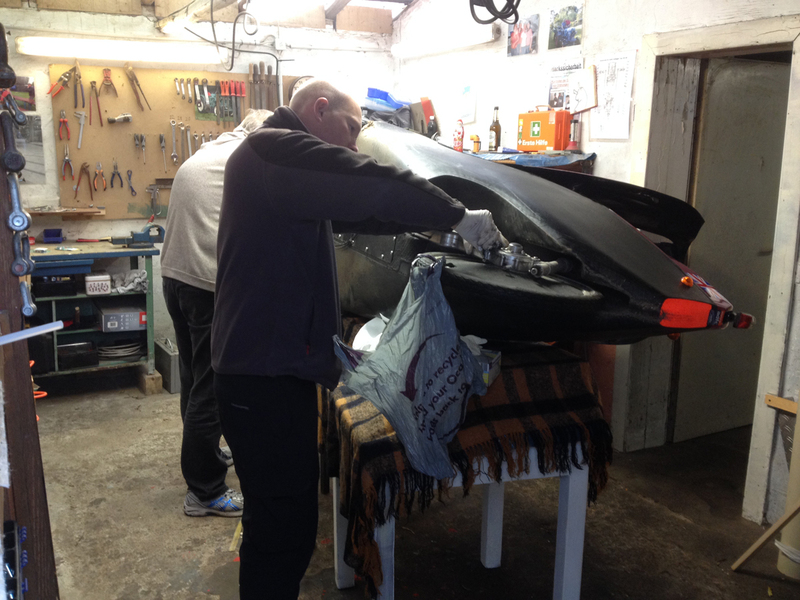 Klaus developed a man-cold so didn’t want to do the work in the garage so once again his lounge became a velomobile workshop. He nursed the hope that the other mystery cable that went into the original black box would also have a 12V feed and would work on the second light switch that Penelope has (there are two switches, red and green, which were for the different brightnesses of lights in the original installation. At the moment only the ‘green’ button did anything). If that wasn’t the case then he’d have to invent some kind of switch as I would not always want these lights on (they would use a lot more power than the headlamps so would drain my batteries more quickly). 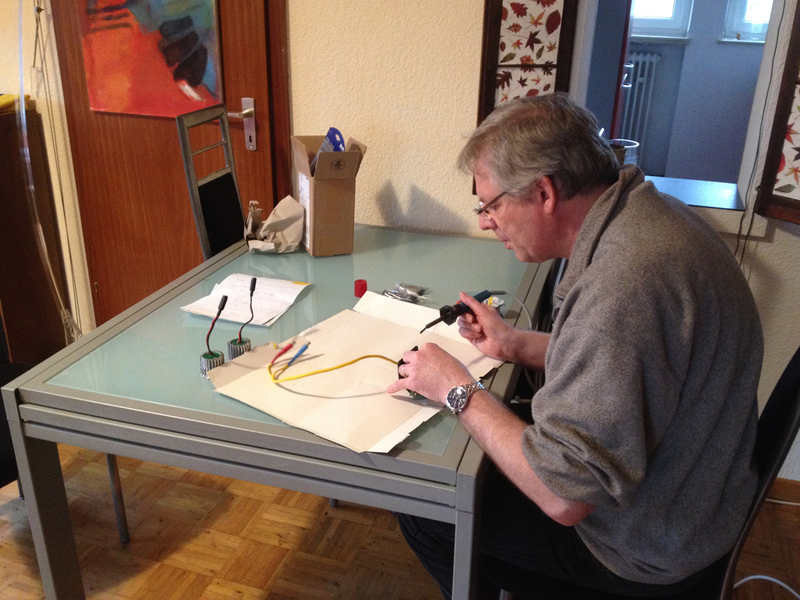 Klaus wielded his test meter and lo and behold the second cable did indeed have 12V. Hurrah! This meant it ought to be a very easy job to fit. It involved drilling holes in the very solid plastic of Penelope’s bottom half. This hole is for the wiring for the front light strip. 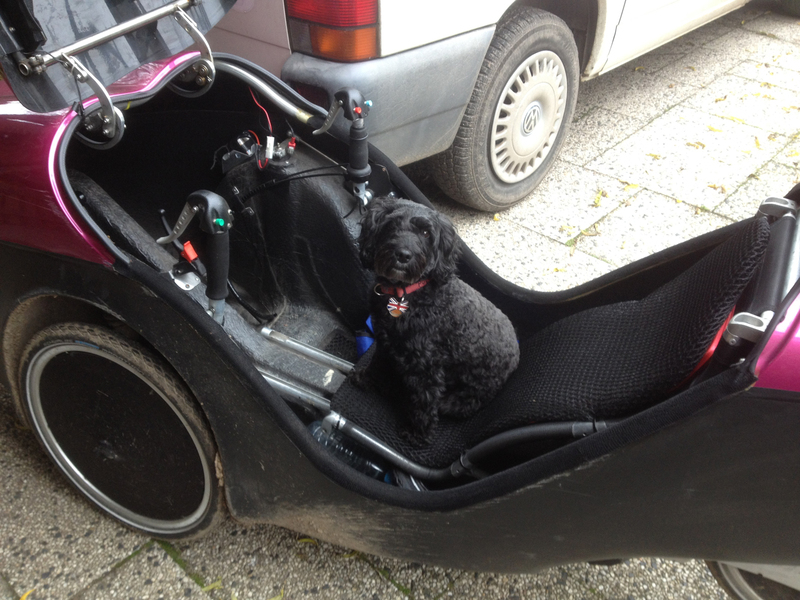 Poppy was doing excellent duty of guard dog in the garden to prevent anyone stealing my cool velomobile. And a second hole for the rear light cabling. (Poppy again is carefully observing that everything is being done correctly). And now feeding the cabling through the hole before soldering it in place. And we decided to turn on the switch to check it works – it does!!!!! And here is the finished job. Penelope seems rather happy with it too! 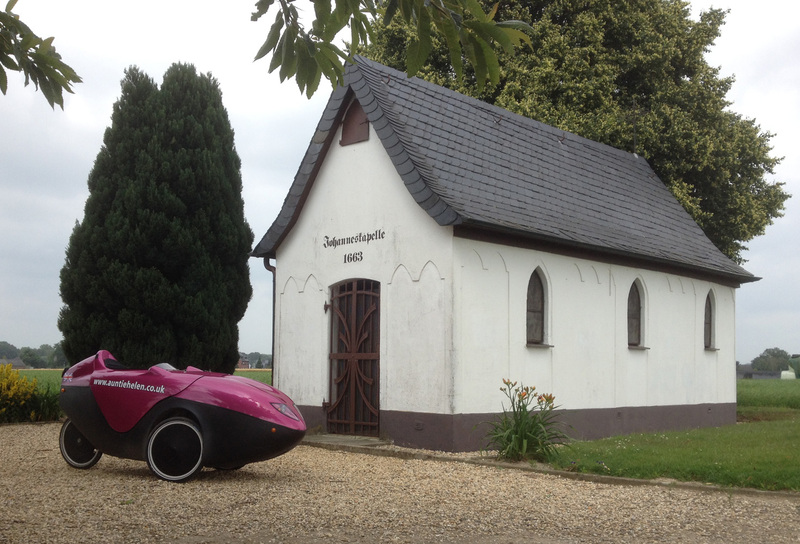 Klaus took a photo of me as I was about to set off home – how cool does the velomobile look? On my 20km ride home I got so many astonished looks – even more than normal! I kept the lights on the whole way home (they actually illuminate the near field rather well and that’s quite useful on some of the Radwege with bumps and tree roots) but as expected they did take quite a toll on the battery. 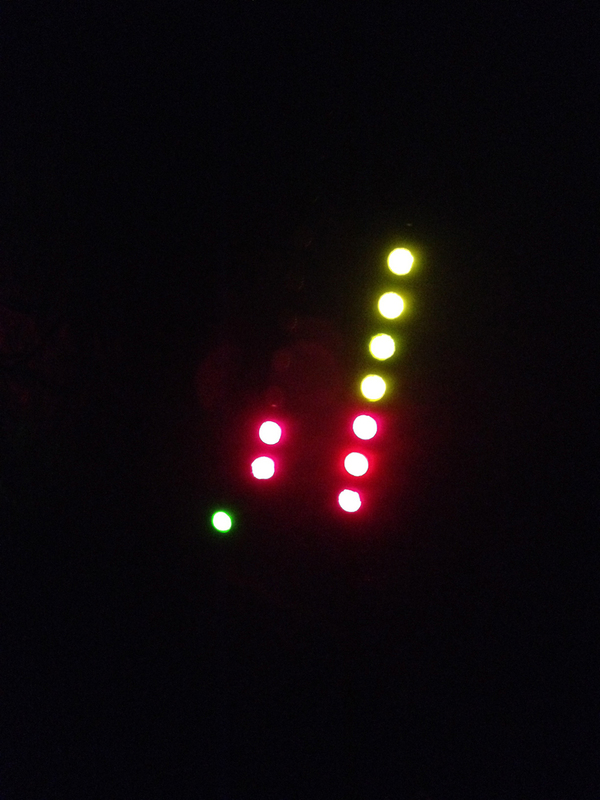 I was using the left-hand battery (which I had used for about three hours previously with the headlamps and rear light on) but it reduced from three yellow blobs and three reds to just two reds in the 55 minute journey. Obviously battery usage is something I will need to be aware of but for my usual ride lengths this is no problem at all. I definitely think the extra visibility from the side is a safety bonus (as Penelope isn’t that obvious due to her lighting arrangement when viewed directly from the side) but of course the real reason for having the striplights is for the coolness factor. I also put together the new wheel covers (the old ones had been damaged in the crashes) and fitted them to the wheels so she now has the solid wheel look. Velomobile friend Oliver had delivered me these new wheel covers almost eight months ago and I hadn’t yet got round to fitting them (the old ones were tatty) but I am glad I hadn’t as there was too much damage after the crashes to reuse them. So Penelope now looks very new and shiny. So anyway, here is Penelope’s new look, which has cost about £110 in total (for the headlamps, strip lights and vinyl wrap) so great value. This is of course not factoring in any costs of labour from my two helpful engineers. Thanks again to James and Klaus for all the work on Penelope – my only payment to them is occasional cakes. This is the sixth batch of church visits that I’ve blogged about. You can read about 1-10, 11-20, 21-30, 31-40 and 41-50 as well. 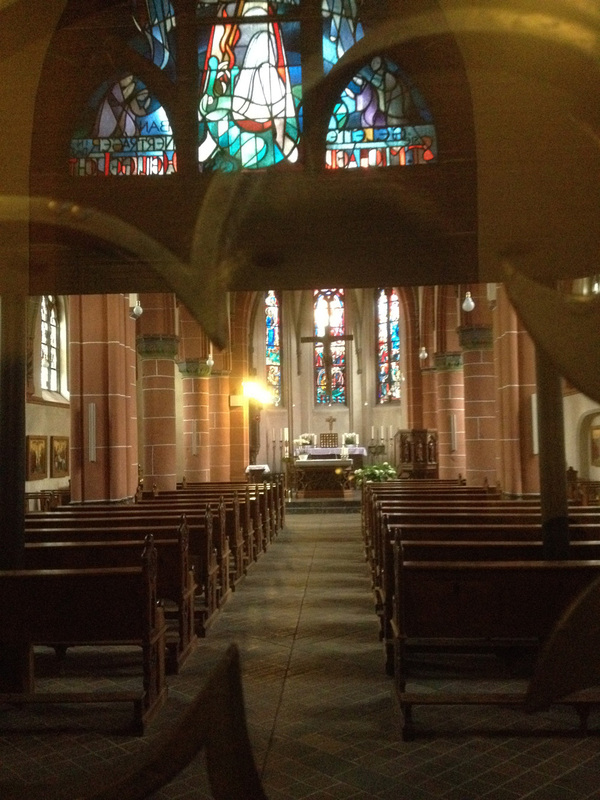 I visited this chapel in the early evening, dragging triker friend Klaus with me. 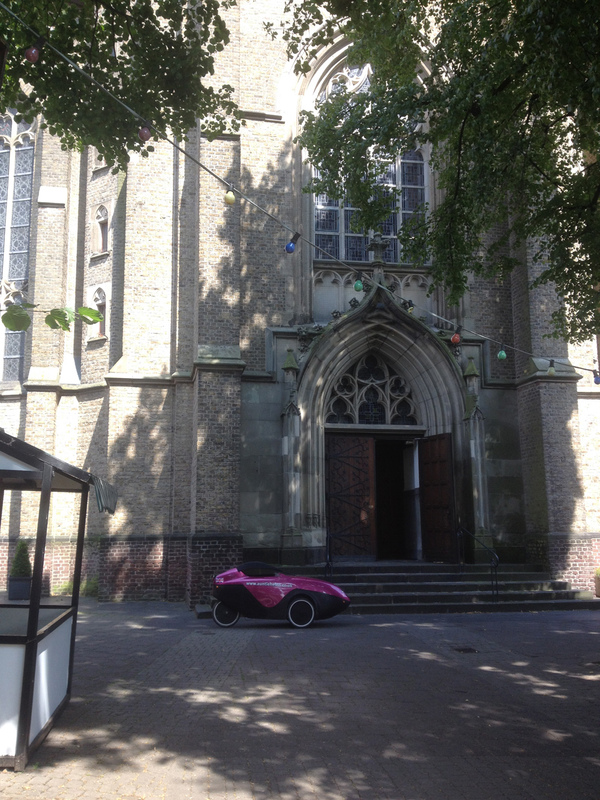 The normal photo of the church with my velomobile or trike now has an extra trike! 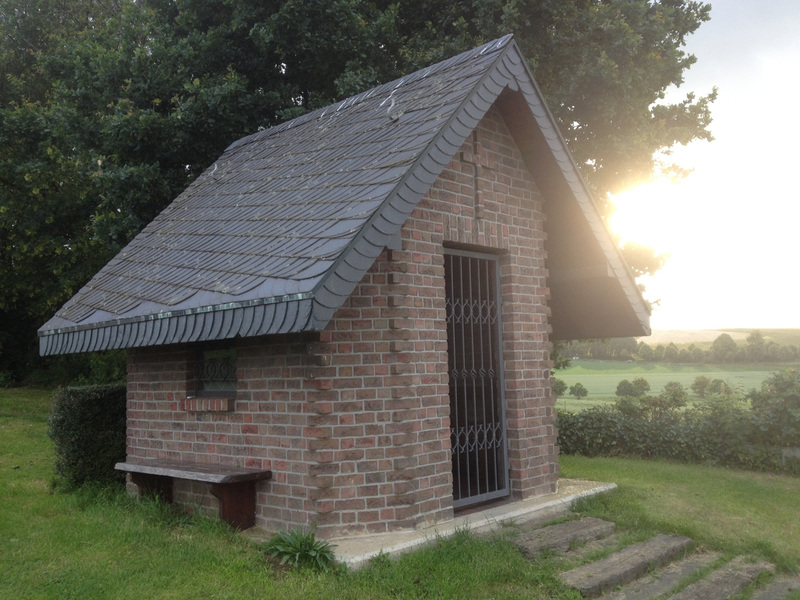 The chapel is in the middle of the countryside between Boisheim and Dülken in the farming hamlet of Lind and was built in 1911-12 to commemorate the tornado of 1 July 1891. The neo-Romanesque brick chapel was built in a Latin cross plan overlaid on an Octagon. You can see the field of potatoes next door! Weiterhin ist sie ein Zeugnis für die Fortführung des Jahrhunderte alten Brauchs, nachdem Hagelkreuze und Wetterkreuze in die “Flur” gesetzt wurden, um Gewitter, Sturm und Hagel abzuwehren. This explains that crosses were placed in the church to ward off thunder, storm and hail, the continuation of a centuries-old rite. 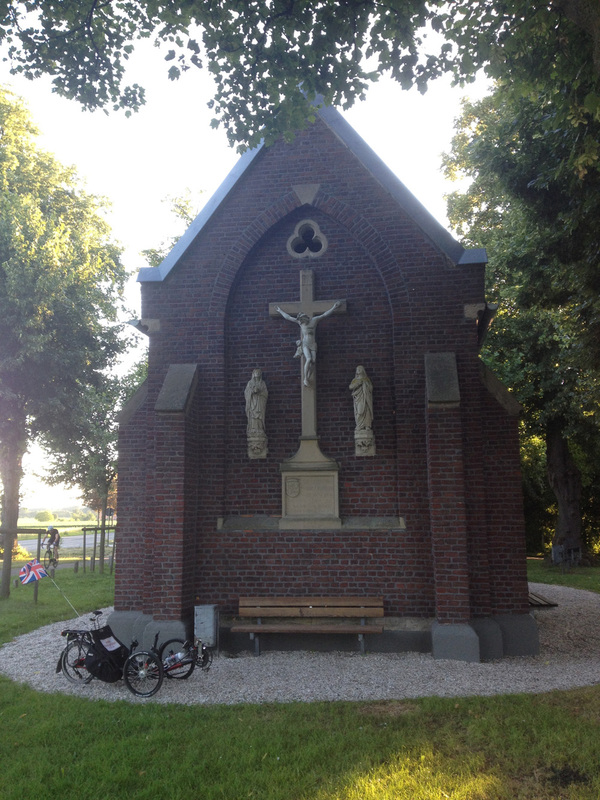 I found this interesting to read as I had, during this cycle ride, asked Klaus if he knew why so many of these little chapels were built. He didn’t really know but wondered if it was to do with collecting lots of money and having to have something tangible to show for it. On our ride we then visited a third chapel in the middle of nowhere east of Lobberich but as this was a wayside one (no services held there) I couldn’t really include it, but it was in a beautiful location so I’ve put a few pictures here. 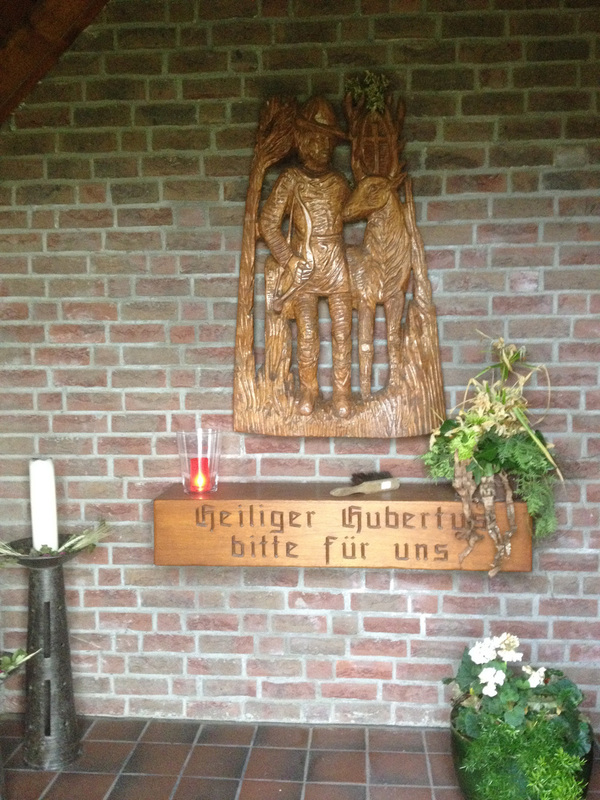 This was a chapel to St Hubertus (he seems popular round here – he’s the patron saint of hunting, I believe). Inside there are no seats (and it was all locked up), just a little altar. And this was the view if you sat outside the chapel – lovely! Klaus and I spent about 10 minutes trying to identify what we could see. Kempen was visible in the far distance because of the white tower of the Propsteikirche but we weren’t sure if we could see Grefrath or Oedt directly ahead of us. It turned out to be Oedt, which I had suspected because of the chimney also visible. In the far background we could see the Hülser Berg (near Krefeld) as well as the other moraine upon which Tönisberg sits. The church was a very impressive sight, for once not surrounded by buildings. It wasn’t completely open, however. Well, you could go in the main doors but there were then some glass doors (with metal gates behind them) to prevent you going right into the church. However I was able to see the windows and it all looked rather nice. 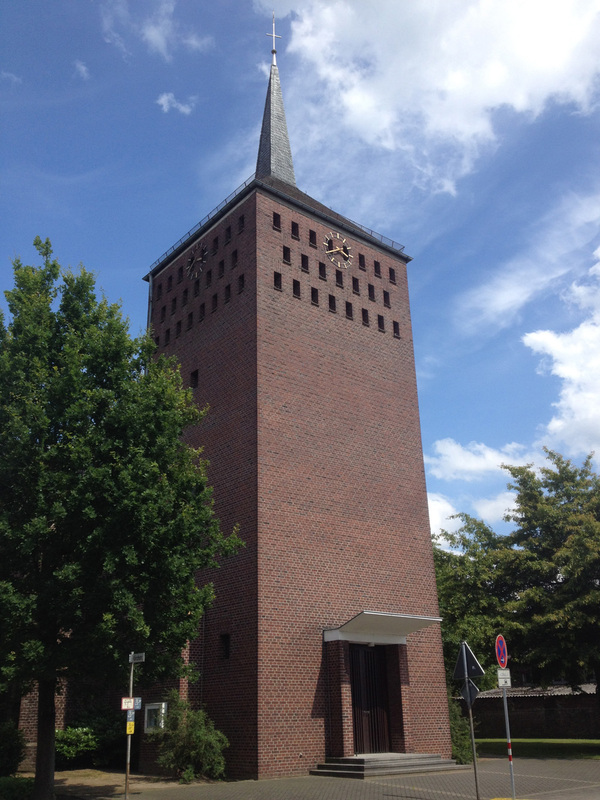 There has been a church in this site for quite some time – in historical documents from 1290 it is mentioned that there is a ‘Capella’ in ‘Buyschem’. 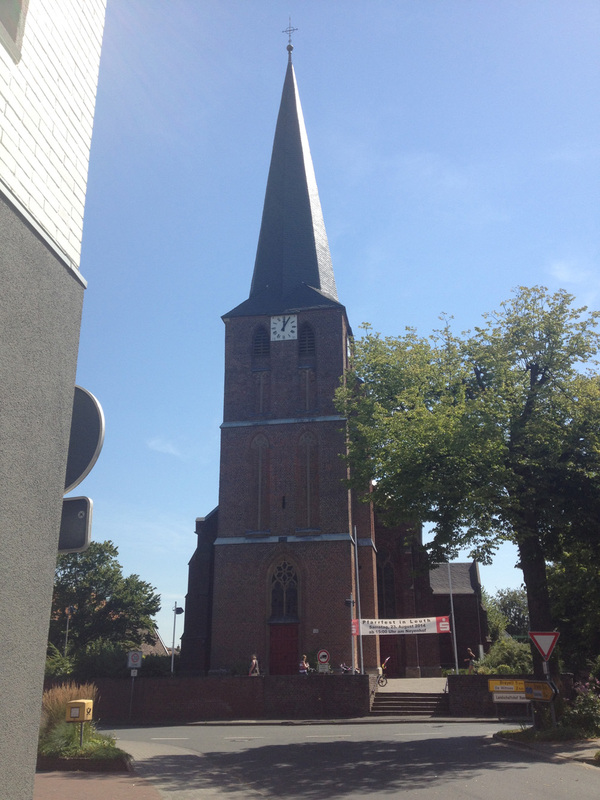 A small brick church was built in 1487 and further enlarged in 1899, including the tower. The church was badly damaged in 1945 and repairs were completed in 1954. 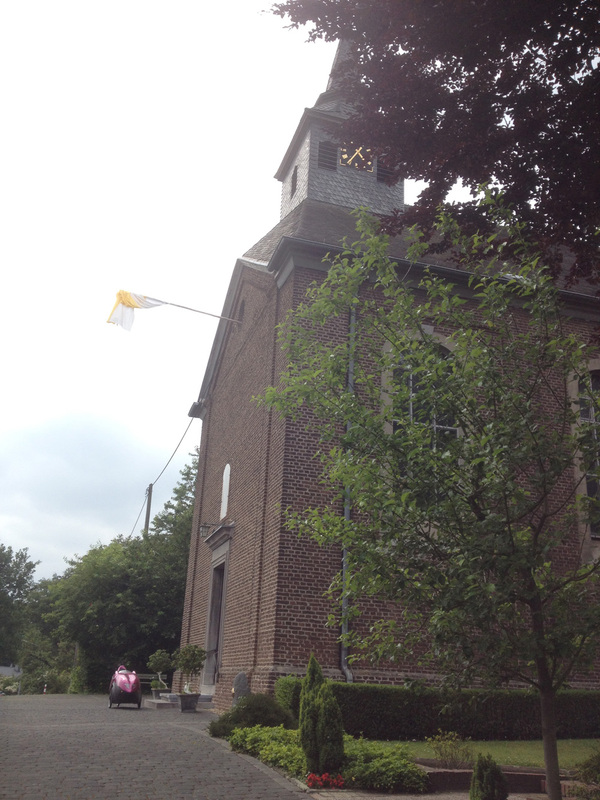 When I arrived at this church there was a large procession of people walking down the road, a priest talking through a loud-hailer and lots of general activity. It turned out there was a funeral taking place and the church service part had just finished, they were now walking to the cemetery (I presume). So I waited a bit around the corner until people had left so that I didn’t disturb them with my photograph-taking. Because the church was open following the funeral I popped in to have a quick look. The church was originally built in 1460 and was much enlarged from 1902-1904, including painting the brick red. 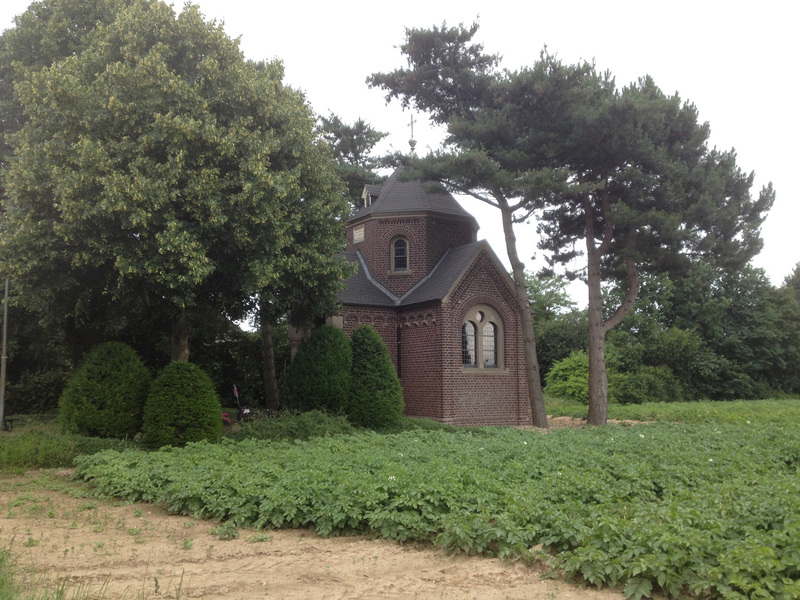 This was a gorgeous little chapel hiding in the fields – I thought the waypoint on my Garmin must be wrong as I couldn’t see the chapel, just a strange white tower, but the chapel was hiding behind the tower. So I made it to Lüttelforst (which I had always assumed was spelled Lüttelvorst and so had been writing it wrong for ages). It is the furthest-away church in my challenge and was an 80km (50 mile) round trip. Great fun though! 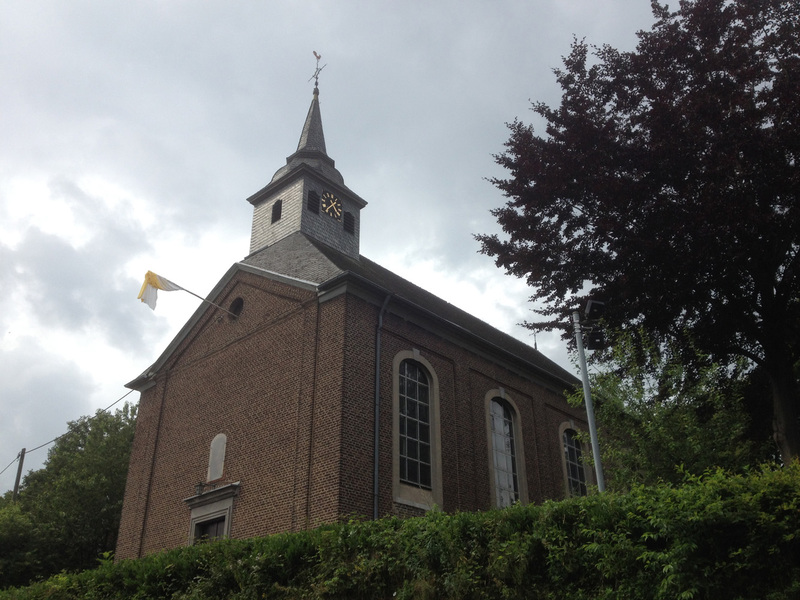 This church is perched on a hill above the road and was a pretty steep climb for Penelope. The church was built in 1802. 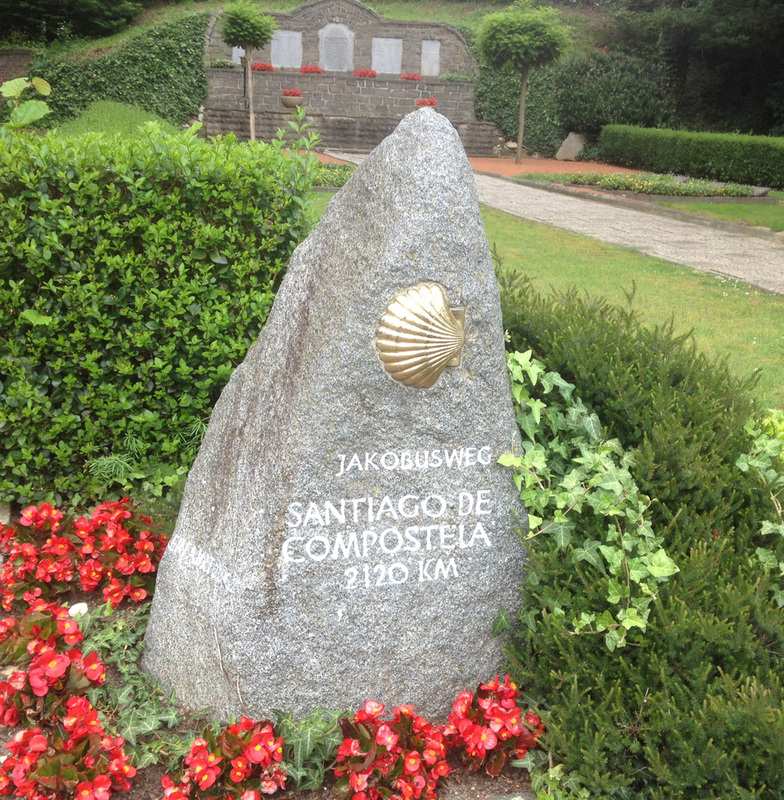 This stone shows that a pilgrimage to Santiago de Compostela would be a bit of a trek from here! It also had rather a lot of mosquitoes buzzing around whilst I was visiting – undoubtedly due to its close proximity to the river. Lüttelforst seemed a very quiet little village without much going on but apparently there is a good restaurant at Lüttelforster Mühle which I may visit some other time. I can’t tell you how many times I’ve passed this church and gazed up at its rather ugly tower. On my ride back on the main road from Grefrath I have to wait at a traffic light opposite this church and the traffic lights are slow so I see it a lot. 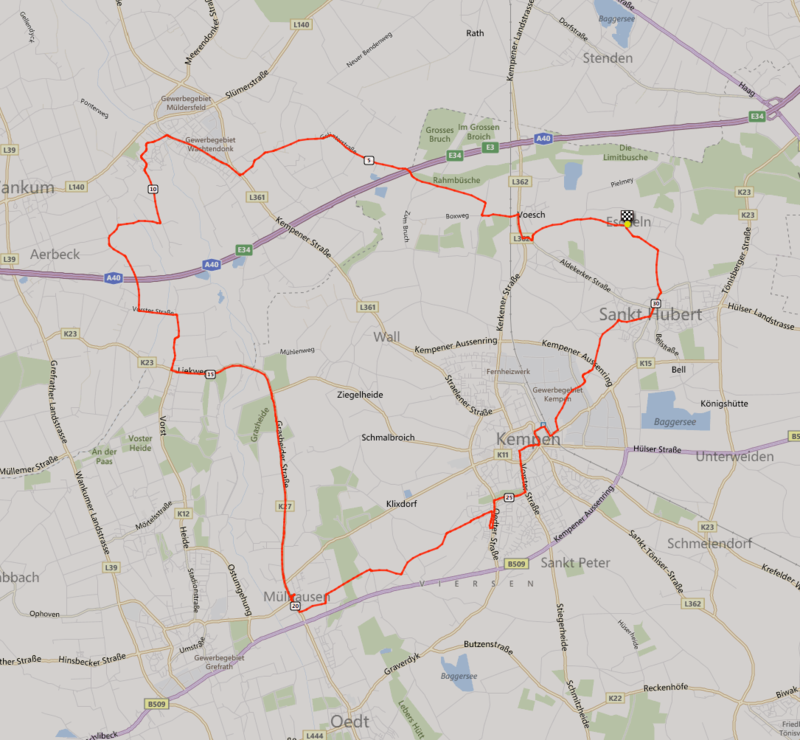 However, I decided to pop in on one particular day as I was doing a nice 30km loop around Kempen. Apparently it was built in 1900 in the neogothic style but it looks to me like some industrial chimney or something. It goes a long way back and the rest of the church looked reasonably interesting but that tower! It totally takes over the look of the church! 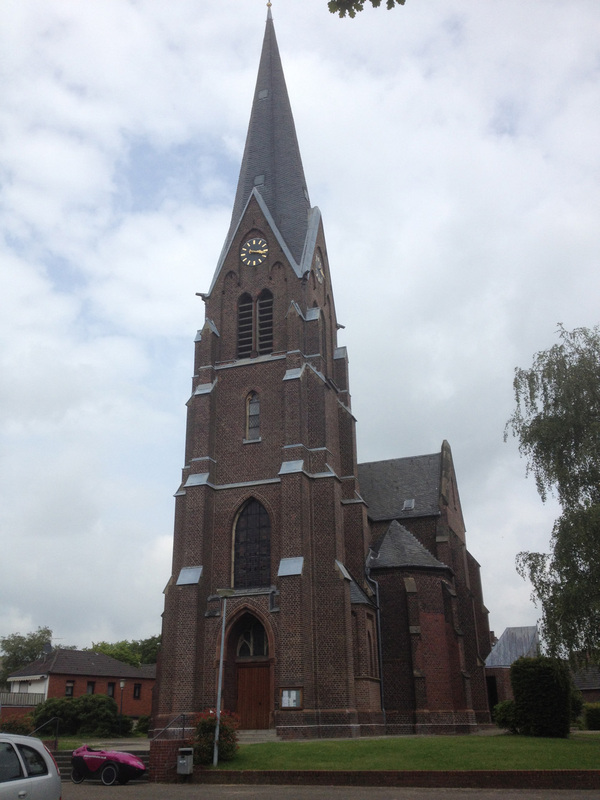 At this point I have to admit something shocking – that a few of these church visits have not involved me cycling from Kempen. 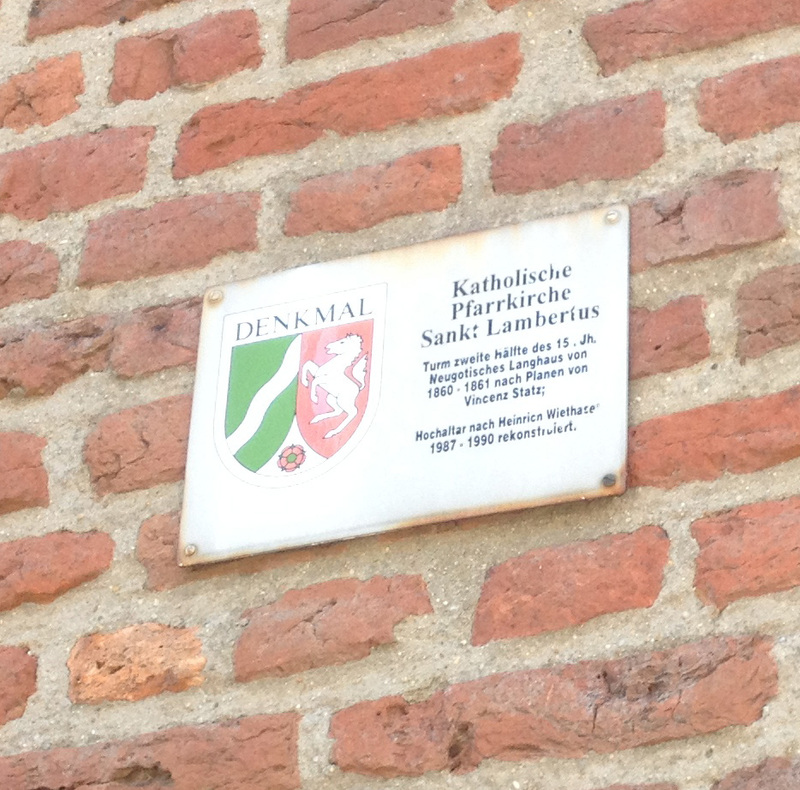 Instead I have visited them when starting my ride from Viersen (when I have been riding with Klaus). 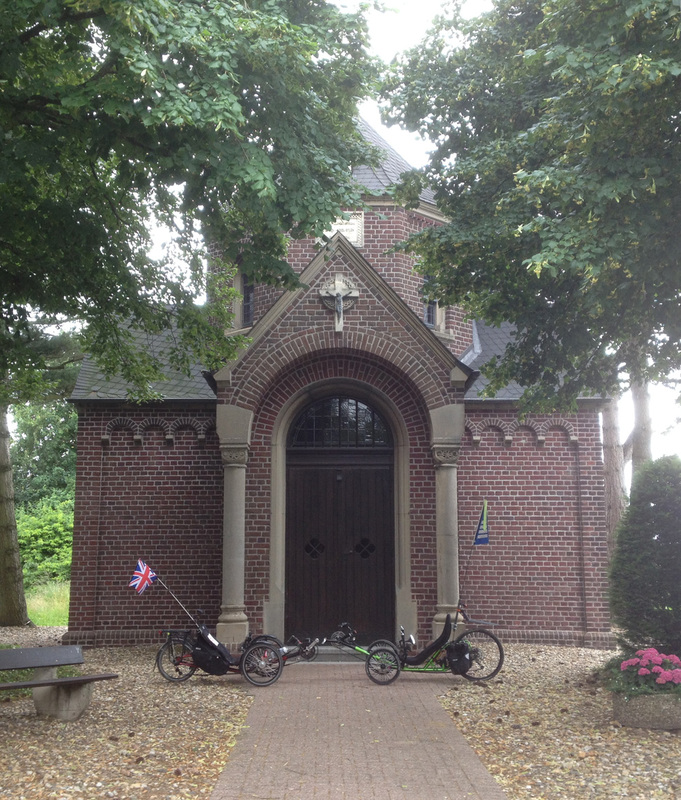 The original plan was to ride to all these churches from Kempen but it seems rude not to bag them when I am passing anyway, and it’s usually on a long ride, and I have probably ridden past them when having cycled from Kempen at some other time, etc etc. Excuses. I let you the reader decide if I have been cheating on my Churches Challenge. This chapel is situated beside a main road down the hill from Hinsbeck. I think it might be linked to Haus Bey, which is now a golf course/centre near the Krickenbecker See. It was built in 1617 as a memorial to Sophia Gräfin von Schaesberg (1823-1844) and was renovated in 1854 and 1994. There’s a photograph of the interior, plus further explanation of this chapel in English, on this Flickr page. 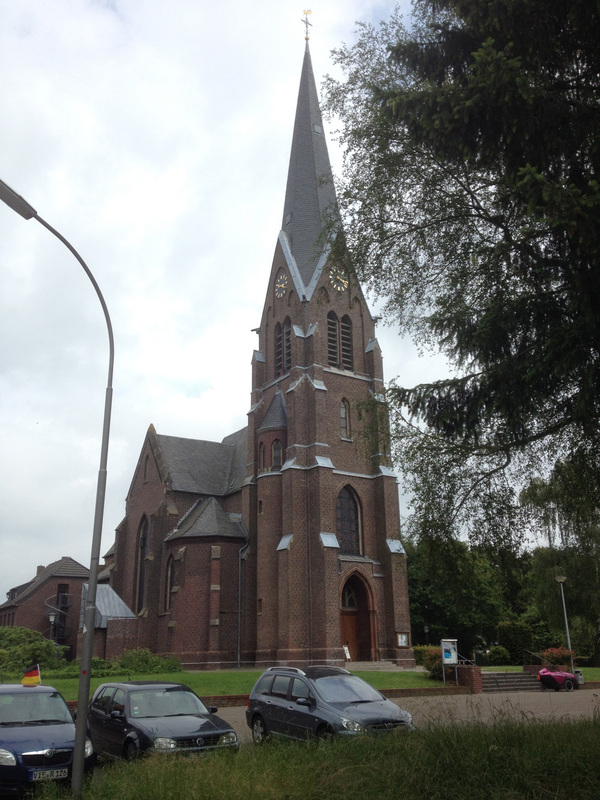 This is another church that I visited when riding from Viersen rather than Kempen. I wasn’t able to take a good photograph but here is one from their website. I wasn’t able to find out much information about this church at all. I had passed this church several times on my travels but decided to visit it whilst leading a group ride with several of Gudula’s friends. I’m not sure they understood exactly why we were stopping at the church and I was photographing it but it was a nice day and time for a water break for them anyway! Here they all are standing outside looking puzzled. 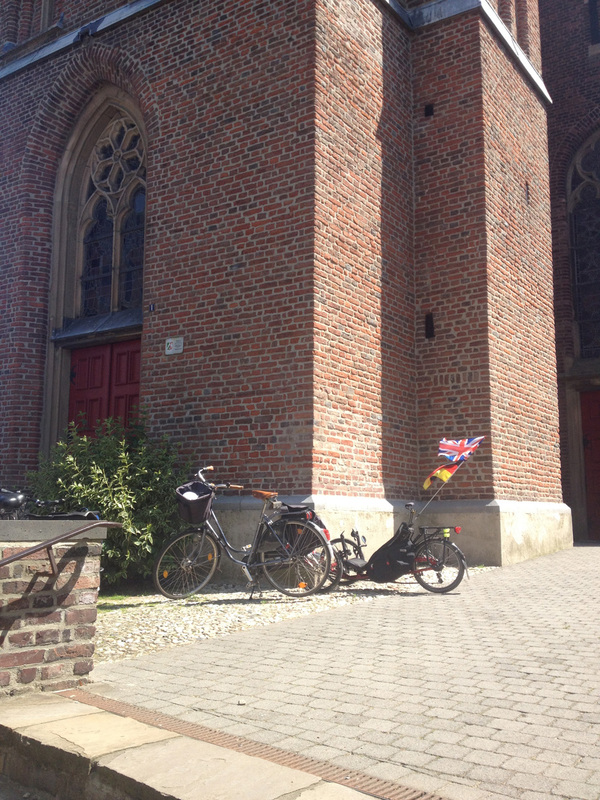 Here is Alfie with Gudula’s bike having a rest beside the church. The webpage for this church seemed to be dead but this plaque tells you that the tower was built in the second half of the 15th century and the nave 1860-1861 in the neogothic style. Willich is pretty much at the bottom right hand side of Kreis Viersen and is somewhere I visit for the choir practices at the Auferstehungskirche but I hadn’t actually been into the centre of the town since arriving in Germany. 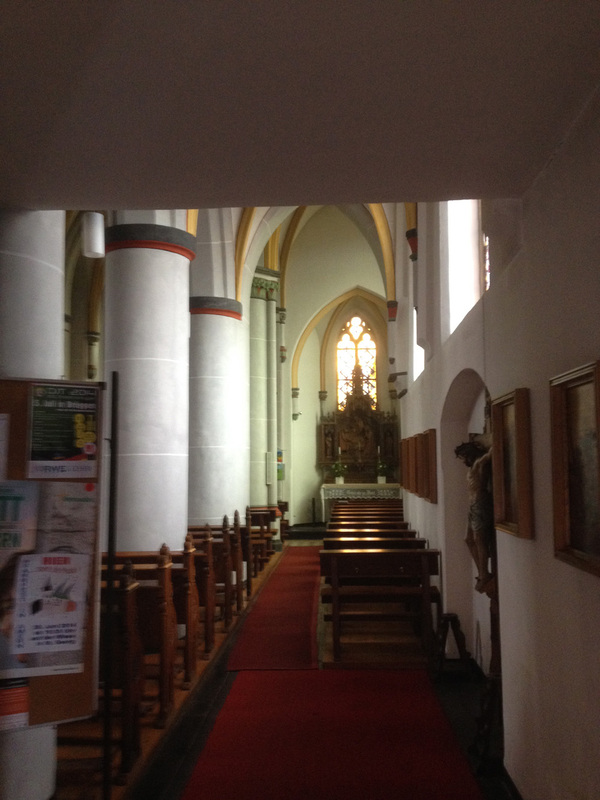 There were three churches to visit in Willich (including the aforementioned Auferstehungskirche) so I headed off directly to Willich, returning later via Anrath (where there are some nice cafés and for a variation in the route), riding 47km in total. I arrived at St Katharina – which is easy to see as it is yet another of these colossal churches whose spires are visible for miles around. But when up close it’s impossible to fit the whole church in the photo! Round the corner, to get the side view, didn’t help much either because of the sun. This was another church about which I found it very tricky to find information. There’s plenty of information about services and the kindergarten but little about history. 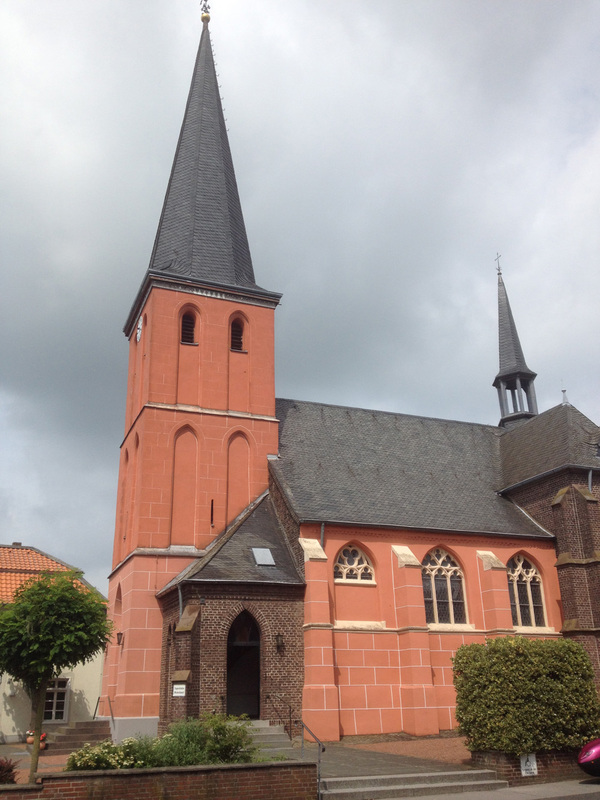 However, Willich’s entry in Wikipedia explains that there was a church here in 800 AD. There was a big fire in 1675 where most of the village of Willich was destroyed, including the church which burned to the ground. The present church was built in 1901 in the neogothic style. 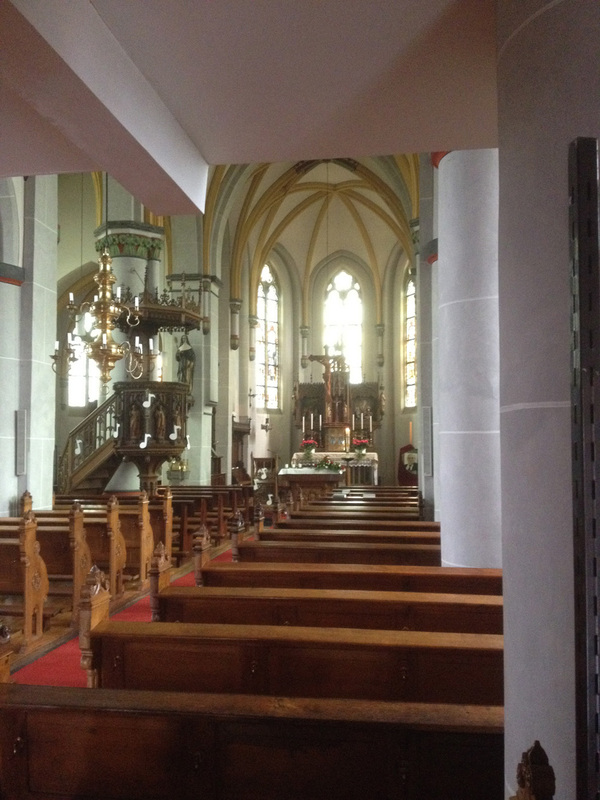 So that brings to an end the next batch of 10 churches which have been scattered all over Kreis Viersen (I haven’t been very systematic in my visiting). But the dots on the map are spreading a bit wider now which is good news! On 3 June 2014 Penelope crossed the 1000 mile / 1600km mark in my ownership. So what have I learned about my new bike in that time? 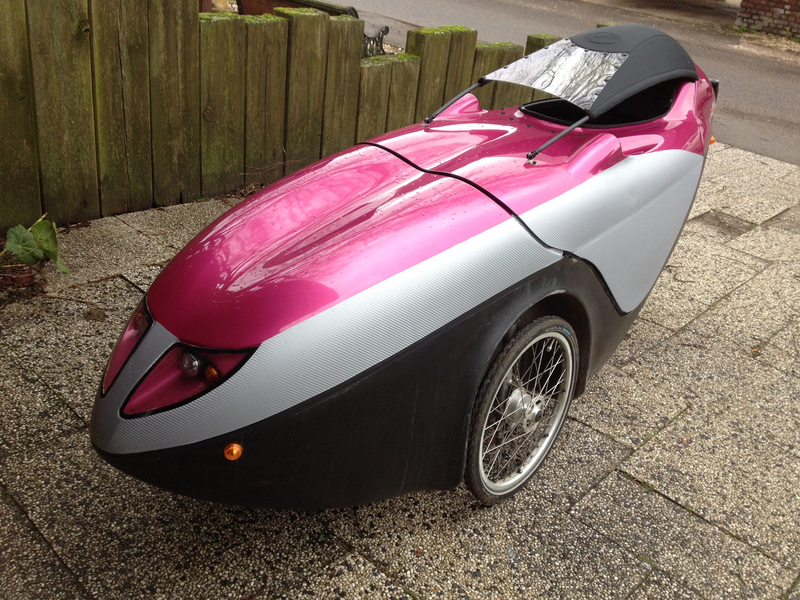 Firstly, it’s brilliant fun riding a velomobile! 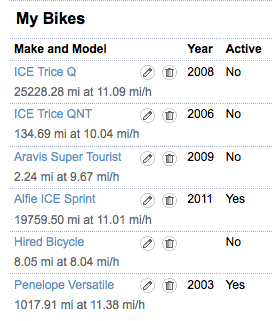 Since I’ve had Penelope I’ve not used Alfie the ICE Sprint very much and, as is clear from the above screenshots of mileage, I certainly used him a lot in the past! There have been lots of other little things that I’ve noticed during my riding which I’ll list below. 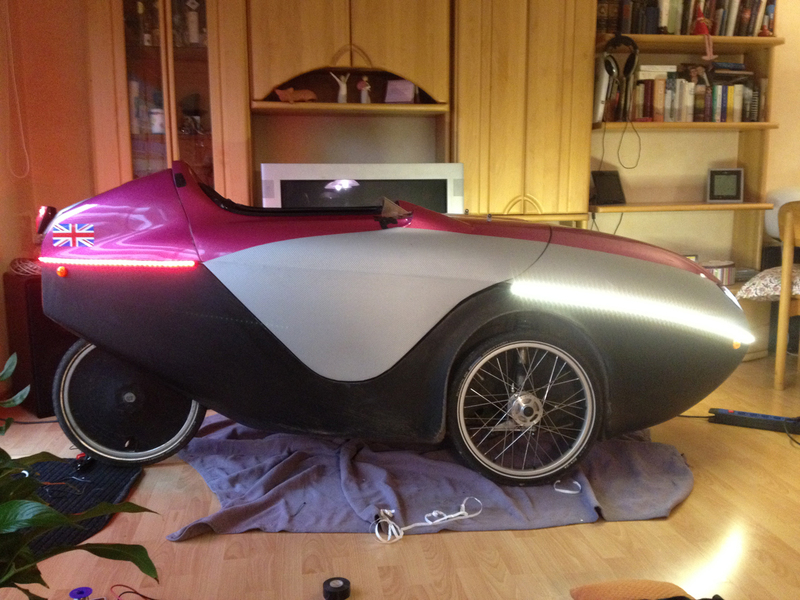 Some of these may be specific to the Versatile, others might also be apparent with other types of Velomobile. This is something I should have remembered from riding my Trice Q which also has twist-grips. What this means is that to change gear you have to twist the bit of handlebar you are holding on the right hand side. This is normally no problem but if you have very wet hands (from rain on the Trice Q or from sweat in Penelope) it can be difficult to grip firmly enough. This is partly because you are gripping with the opposite side of your hand than you would on an upright bike; on an upright your grip is between the thumb and forefinger, very strong. Because the handlebars are vertical on a recumbent, you are actually gripping with your little finger side of the palm, not as strong and so it can occasionally be difficult. Cycling gloves will solve this as they always provide good grip. The Rohloff is generally considered the top option for hub gears on bikes and deservedly so. They tend to be extremely reliable (and Rohloff the company are very good at dealing with any problems) and relatively maintenance-free, just an oil change every year or 5000km. The Alfine that I have on Alfie is slightly pickier as the cable length needs to be occasionally adjusted with a barrel adjuster to keep the cable length correct and the indexing smooth. The Rohloff costs twice the price of the Alfine and I have to say I’m not entirely sure it’s worth the extra. It has been totally reliable so far for me but it is pretty noisy in the lower 7 gears. The Alfine seems quieter and somehow smoother. I guess time will tell! The Rohloff of course has three more gears than the Alfine which would make a difference in the Velomobile as it does need all 14. Penelope is due her Rohloff oil change and I am currently investigating how to do this (I have bought the oil change kit as a starting point!) 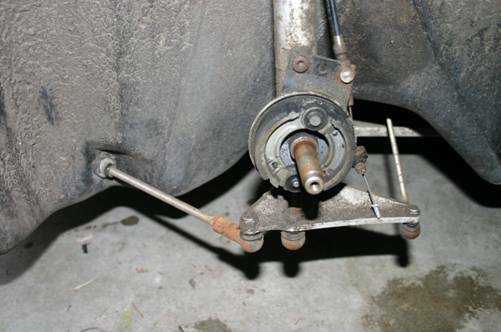 There will be a blog post when I finally get round to this task – I have some promised help from a couple of German cyclists as it involves completely disassembling the rear swing-arm on the Versatile. You stay pretty much dry whilst riding in her (apart from sweat!) but I was out in a colossal deluge and discovered that some water flicks off the front onto your face and neck (not a problem). But what I also found the next day is that some water had splashed up through the drain holes and made my bag of tools, which is stuffed behind the seat, slightly wet. I now have the tools in a waterproof bag that I already had so that was no real problem. 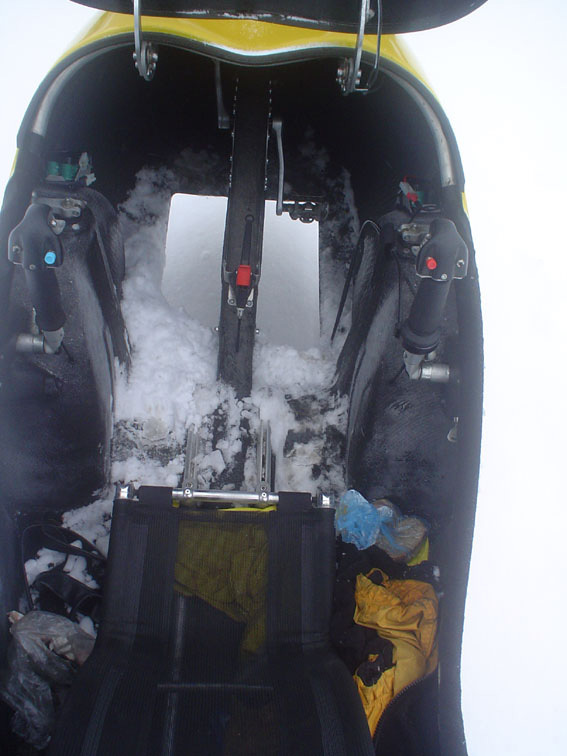 However the amount of water that gets on you is tiny compared to the amount you would be drenched by with a normal bike or unfaired recumbent. 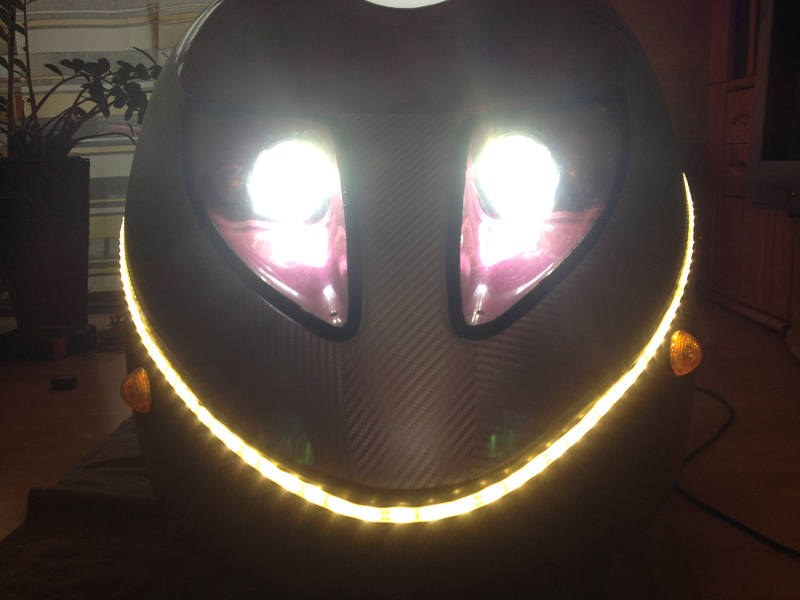 Penelope has a 12v lighting system and she has two battery packs that I can switch between. This works well and in normal usage one battery pack lasts about a week (normal usage just being the daytime rear light, occasional hooter use and indicator use). If the front lights are used that makes quite a difference to the battery capacity, especially as the front lights are rather poor (see below). Alex gave me four battery packs with Penelope. 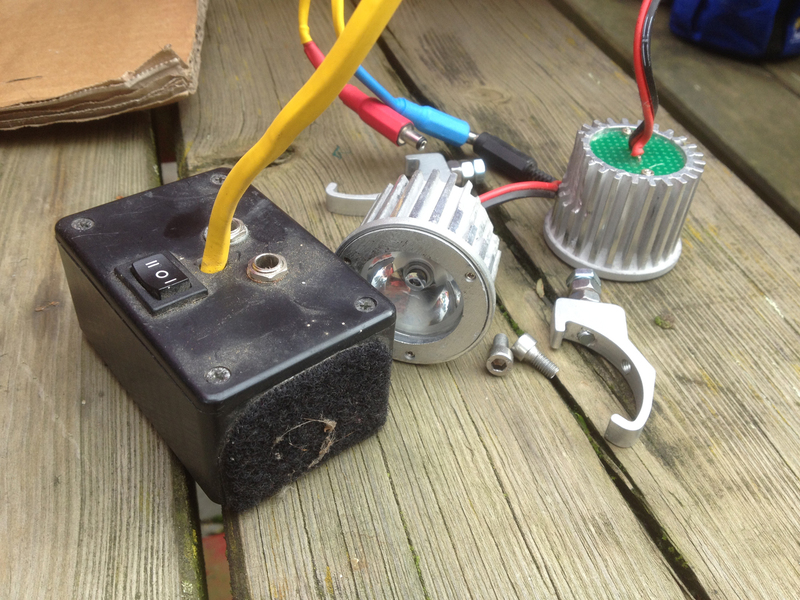 Two were the originals from when Wilfred installed the 12v system (i.e. about seven years old now) and two others were newer that he had bought about a year before. The old ones are definitely looking old and I haven’t used them; the two newer ones work well except for one of the two tends to discharge very suddenly when it reaches halfway used. I’ve got a sticker on it so I know which is which and make sure that I always have the other battery topped up fully when using this one, in case it suddenly drops. My husband has made me a new battery pack which I will try out when I collect it mid-June and if it lasts longer he’ll make me another one. 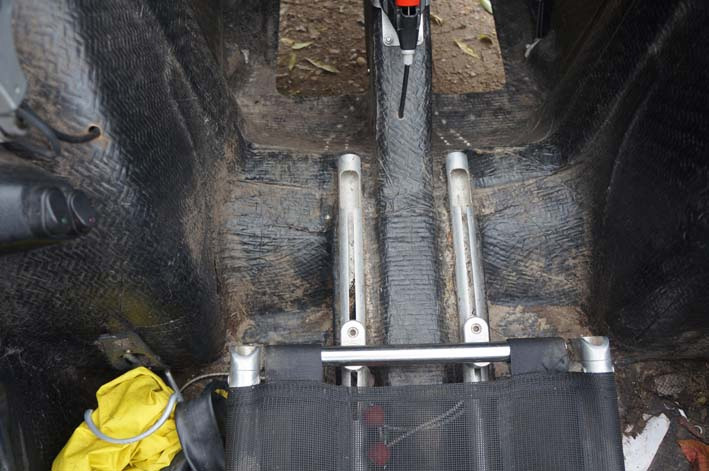 When I was out riding along a bumpy cycle path I hit a series of tree roots which jolted the velomobile so much that the left hand battery packed jumped out of its mounting box and fell onto the floor (pulling out the connectors in the process). 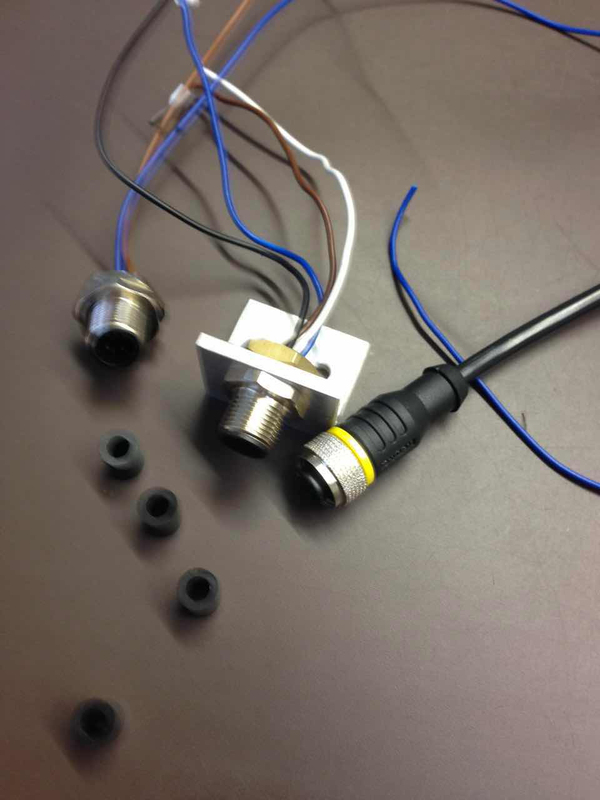 Although it was easy to put it back and put the connectors back together, I have since found that the cabling can be a bit picky – I think there’s maybe a weak solder join underneath some insulating tape. I’ll get my tame electronic engineer to have a look at it in due course. I have been completely spoilt with the front lighting on Alfie. He has a Schmidt SON Dynohub in his front right wheel which provides electricity for a Busch & Müller IQ Cyo front light, 60 Lux. What all that means is that basically I always have an excellently bright front light which is always enough to see by. It doesn’t need batteries, it just lights the way day and night. 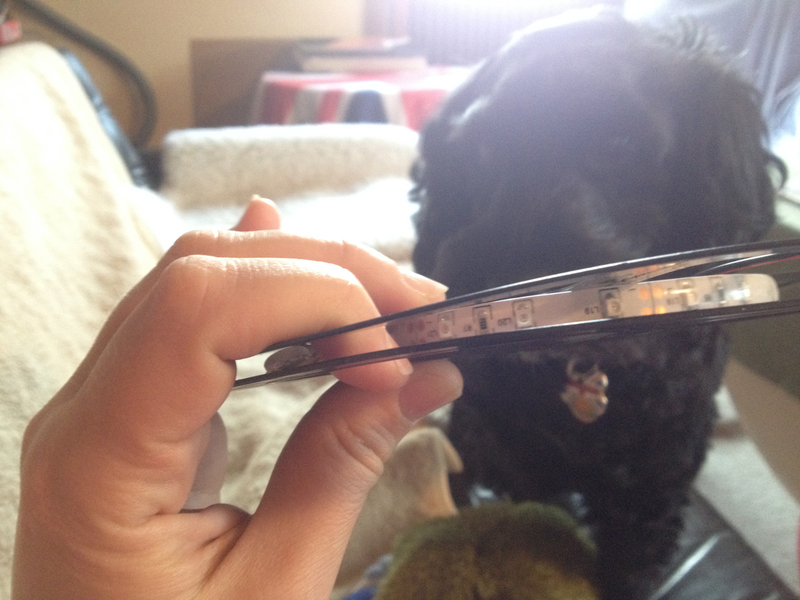 Penelope has two headlights which are notably less bright than Alfie’s one. In fact, if I had to make a guess I’d say that they are combined less than 25 Lux. It makes for a bit of a scary ride in the dark on unfamiliar lanes, so much so that I have bought a Busch & Müller battery torch light (of 40 Lux) as an extra light. I can run Penelope pretty well on just this battery light (without her main lights) but if I have just the main lights and not the battery one it’s not enough to see by. Clearly some replacement lights are in order (these are 7 years old and LED lighting technology has significantly improved in the intervening years). It’s a job beyond my engineering skills though so James my husband (who is an electronic engineer) will be drafted in to help me next time he visits! A nice pair of 40 Lux Cyos would be wonderful! There’s a parking brake on Penelope roughly between my calves. When I was at SPEZI I spoke to Andre Vrielink (who designed the Versatile/Orca) and we talked about some of the changes which they brought in for the newer version, the Orca. One of which is the position of the parking brake. 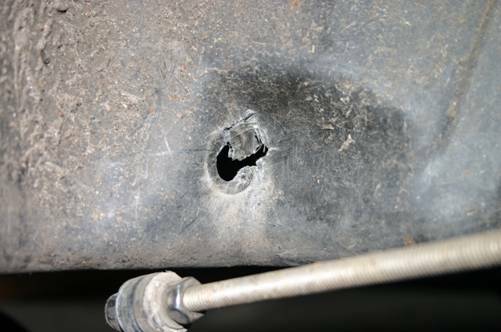 Andre said that some people had found their flappy trousers got caught around the brake and put it on whilst going along – not great. I don’t tend to wear flappy trousers when cycling but have been sure, when occasionally wearing jeans, to roll them up when I am riding. I have written about the ride I did early on to Schwalmtal where I ended up with three punctures on the way back. I think this was because I didn’t initially realise I had a puncture and ran on the flat tyre for a kilometre or so, thus ruining the Tryker. However I am happy with the Schwalbe Marathon tyres I subsequently put on Penelope and haven’t had any punctures from them yet. 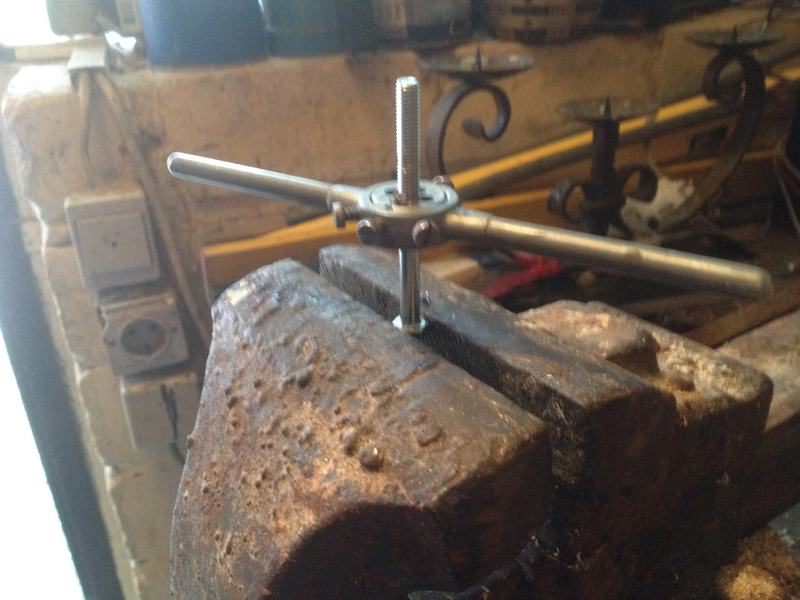 The little wheel jack that Peter made for me is just brilliant too! The Versatile has wheel covers (the Orca has five-spoke wheels instead). They are a consumable item, really, as it’s quite easy for them to get damaged. With the Sturmey Archer Drum Brakes the axle is wider than the rest of the wheel (unlike in my ICE trike where the axle is flush with the tyre). 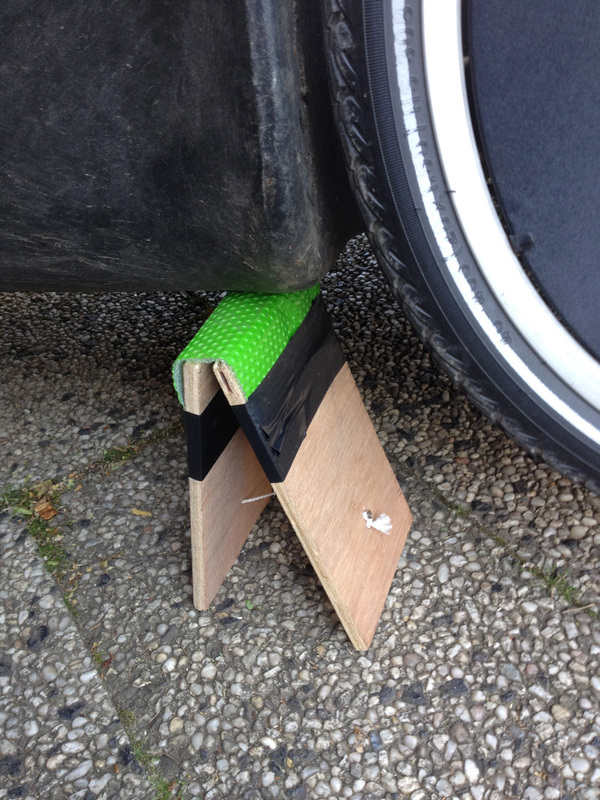 What this means is that if you misjudge the width of a gap then the wheel cover takes the hit. 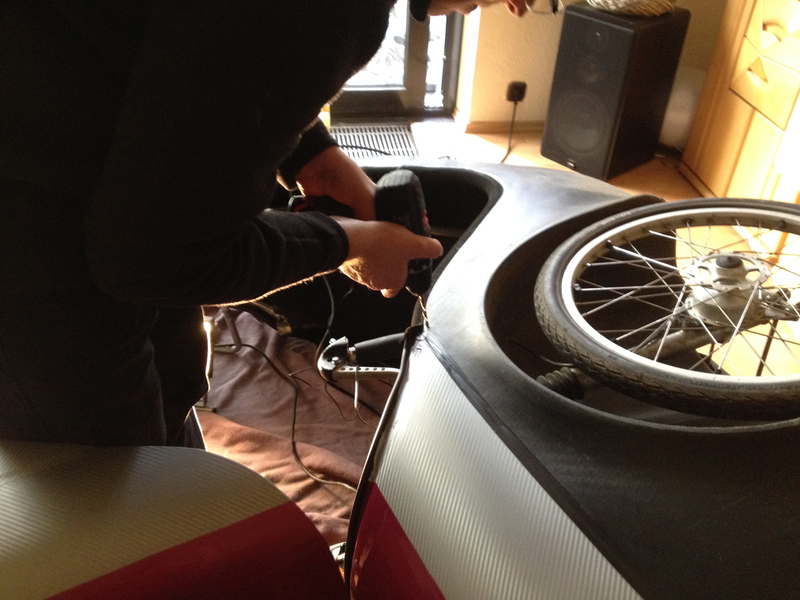 When I bought Penelope the rear wheel covers and one of the front ones were looking a bit tired. I subsequently did more damage to the front one when dragging it across a fallen tree. Friend Oliver had to order some new wheel covers for his Mango so he’s got a pair of covers for me too and we’ll meet up somewhere (probably for cake!) for me to collect them from him. They’re pretty cheap, about 20€ a pair I believe, so it’s not a big deal. With Alfie the questions were “How much does it cost?” and “How do you steer?” so a slightly different selection. I quite enjoy chatting to people (if I’m in a hurry I say so and head off) but I guess for some people it could get a bit irritating. Alex, Penelope’s former owner, says he doesn’t miss that side of things now he rides a more normal bike. It’s tricky to compare bike speeds as so often when I’m out riding I may go through a town centre pedestrian precinct (i.e. very slowly) or have a tailwind or something. However, at the beginning of June I did a 50km ride on Alfie which I then repeated the next day on Penelope. The routes weren’t 100% the same (I diverted to photograph a couple of churches on each ride, different churches of course!) but I estimate the diversion time and distance was pretty similar. 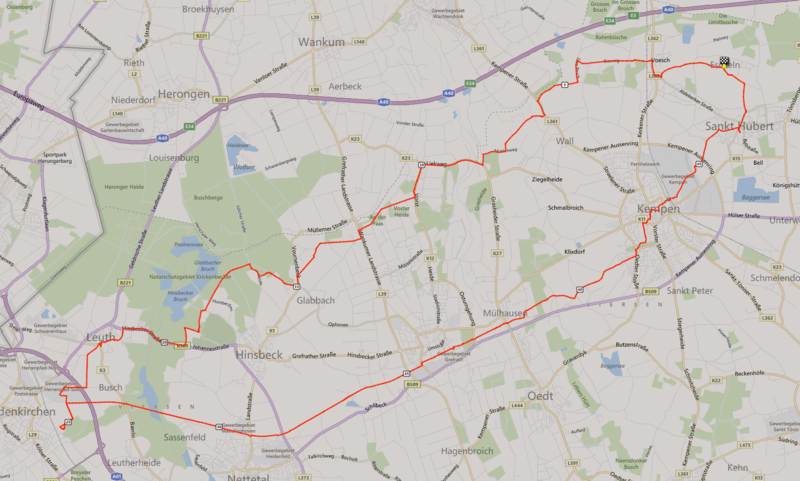 The route was one sent to me by recumbent rider Klaus and he rode it on Sunday 1 June. 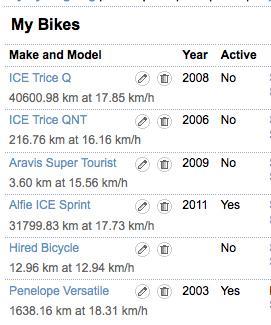 The ride on 2 June is on Alfie the ICE Sprint, the 3 June ride is Penelope. The most noticeable thing for me, when doing these two rides, is that you feel the wind so much more on Alfie that I had the impression I was going faster overall (which I clearly wasn’t). The second thing I noticed is that things are much quieter on Alfie (the Versatile makes more noise) but that I am lower down and can’t see as much. Despite the fact that Alfie is notably lighter than Penelope, over a long journey Penelope’s fairing has more of a beneficial effect than her weight has a negative one, if that makes sense. If I were doing a short ride with lots of stops and starts then the trike would be a better choice (assuming the weather was nice) but for any sort of distance, the enhanced cruising speed on Penelope makes it easier and quicker. 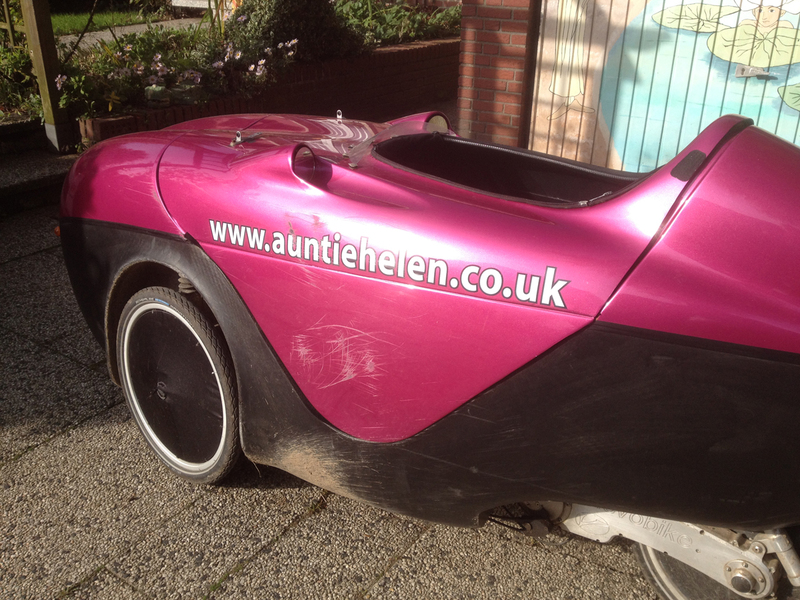 I wanted the signwriting on the side so that people could find out about velomobiles (I had noticed lots of people photographing the blog address embroidery on Alfie, presumably they then look it up later). I’ve had some people contact me through this blog already having seen me cycle past – it’s fun and a good opportunity to get to know some other cyclists. 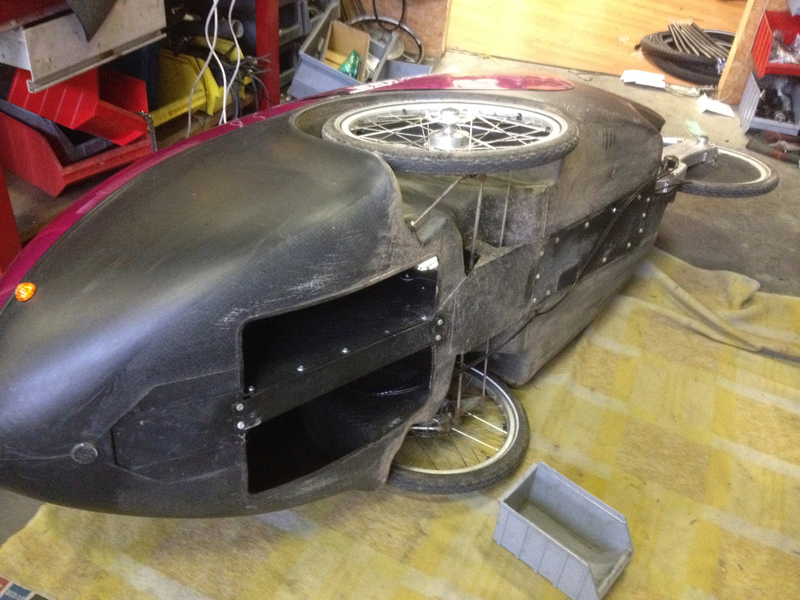 Penelope’s former owner had an issue with his knee that the weight of the velomobile exacerbated. When I started riding her I also had painful knees for a few days so was very careful with my riding. That all now seems to be past and she feels fine to ride, especially now I have got the seat how I like it. But a velomobile, like the trike, has the same warning that you can damage your knees by overpushing (in a way that you can’t on an upright bike) so I am always aware of this. It’s 32 degrees today in Germany and my plan for my late afternoon ride (to a café) is to go on Alfie rather than in Penelope – it just feels a bit too hot for Penelope. 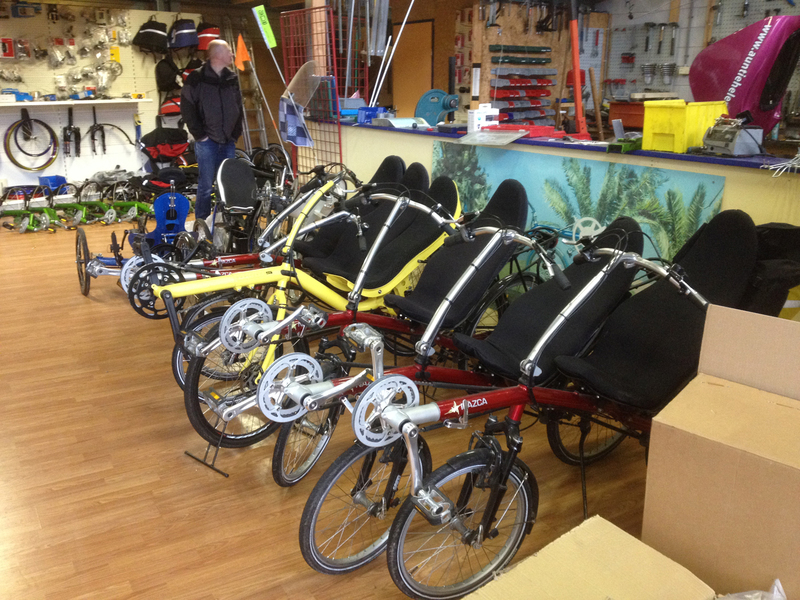 With the trike you get the benefit of wind when cycling so feel a bit cooler. 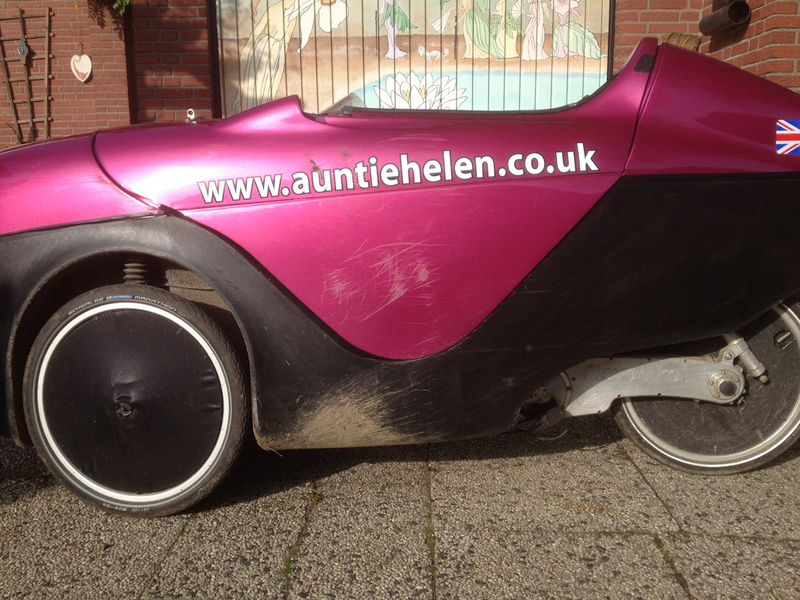 Having ridden the trike on a couple of hot days I noticed that I tend to end up with dust and dirt on my arms when triking – and I remain clean in the velomobile. I think it’s probably that the front wheels on the trike pick up dust and flick it into the air and some lands on you, even if you have mudguards on the trike. 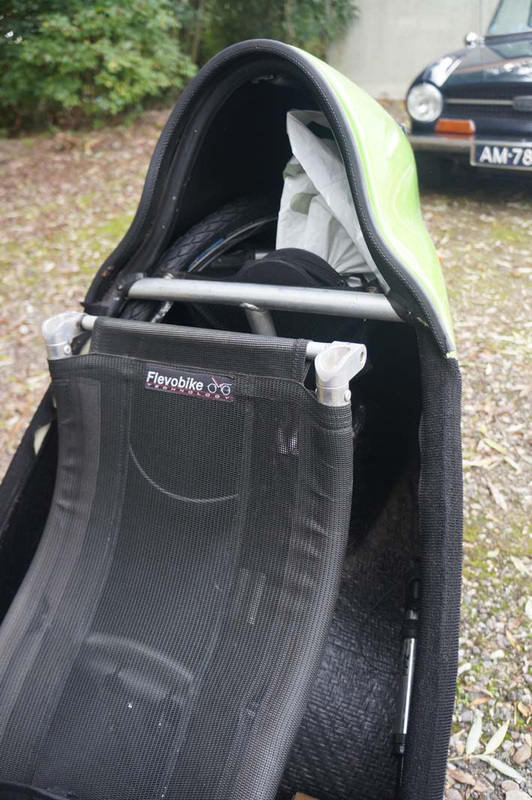 I also noticed I had more insects in my face on the trike, probably a result of it being a little bit lower down and perhaps also because with Penelope the airflow pushes insects underneath the velomobile rather than into your face. Apart from the above-mentioned Rohloff service which is due once per year or every 5,000 miles, Penelope hasn’t needed any maintenance apart from topping up her batteries once per week. I’ve wiped her down with a cloth a couple of times (she gets a bit dirty/sandy at times) but that’s about it. 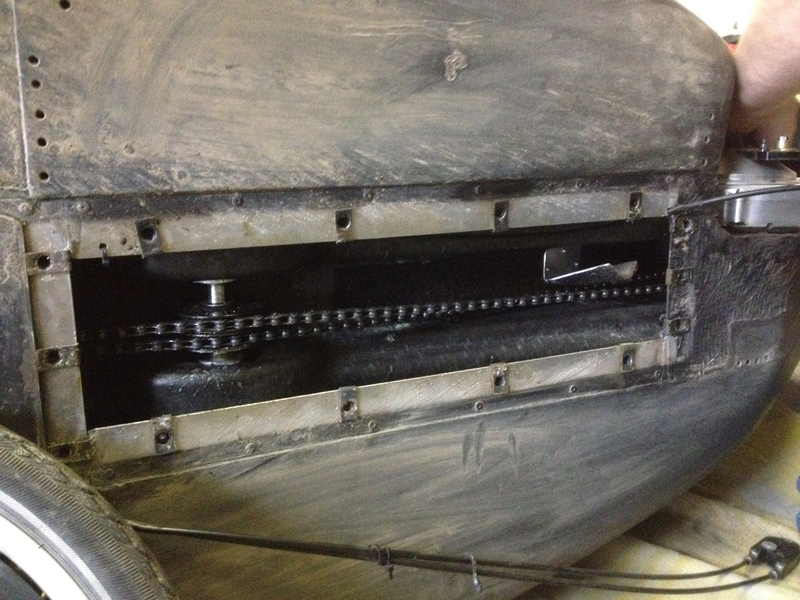 I’m not expecting to need to change the chains at all – reports of chain wear suggest they last upwards of 40,000km, so Penelope has 32,000ish to go! I’m really glad I bought Penelope and have found her quicker to get used to that I expected. Having now seen many other types of velomobiles it’s pretty clear I wouldn’t have been able to get in and out of them with my disability. 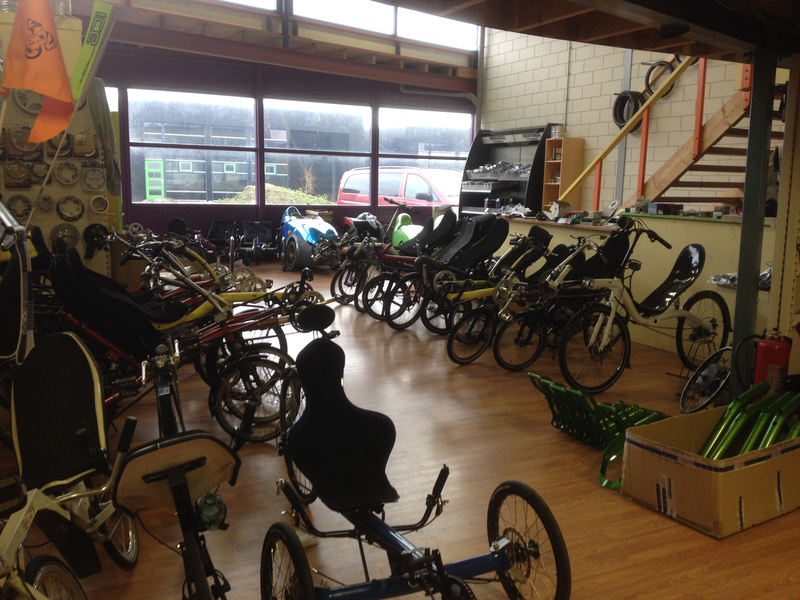 I think the choice of the Versatile was definitely right for me (this was also confirmed to me by a cycling friend over here who had also seen lots of other velomobiles – he felt that this was the best option for me). I wonder about how difficult she would be to ride back in the UK with our hills (she is ideally suited to the flat Niederrhein area), so if I return to England I’d have to weigh that up and decide whether to bring her back or to sell her here. As summer is approaching I expect to use Alfie more, but the Versatile is a fantastic autumn, winter and spring machine, plus an ideal bike for when it rains, or it very windy. The only real time I expect to pick the trike over the velomobile is when riding in groups with others, taking the train or when it’s a very hot and windless, dry day.